Hello again. We’ve been busy bees as most of our friends and family already know. 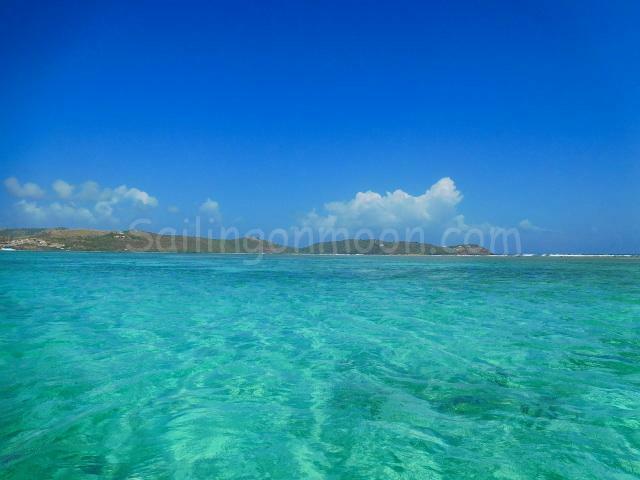 We had our final days in Culebra and have put Moon away for the summer season. 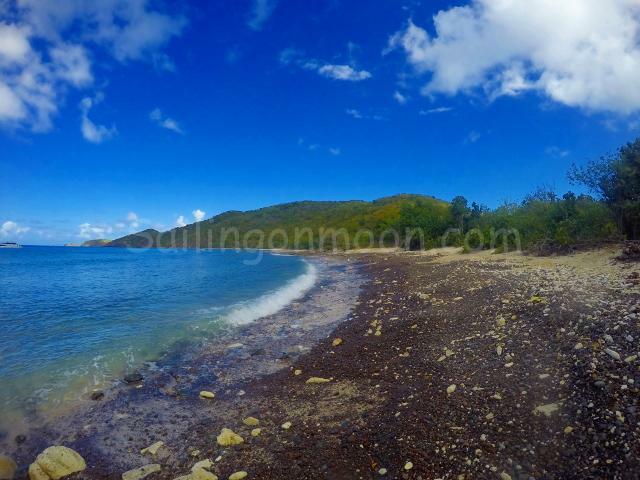 Combing towns beach in Culebra one more time while waiting for the ferry to arrive. It’s always a bit sad leaving Moon behind and checking into the real world…the one of work and responsibility. But it is a necessity and so we are back in our home town of PCB. 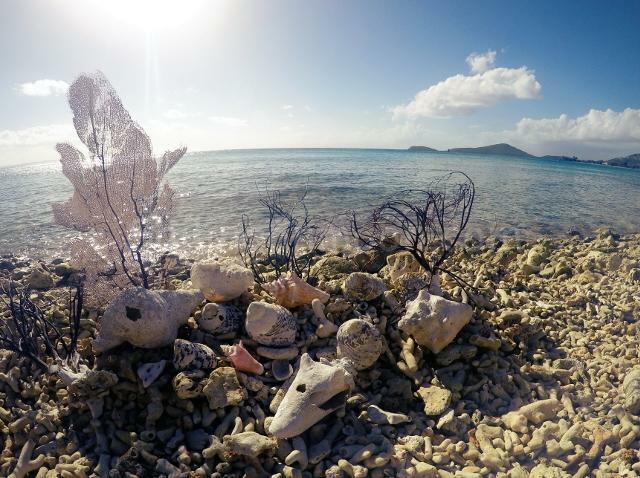 We soaked in as much of the beauty in Culebra as we could before we left. Of course we had to spend a day beach-combing our “glass” beach and visiting the tide pools close to Dakity Reef where we were moored. 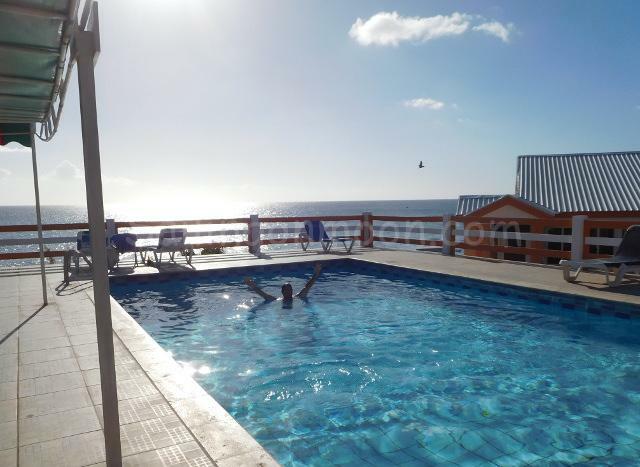 We can never get enough of the amazing water and views there! 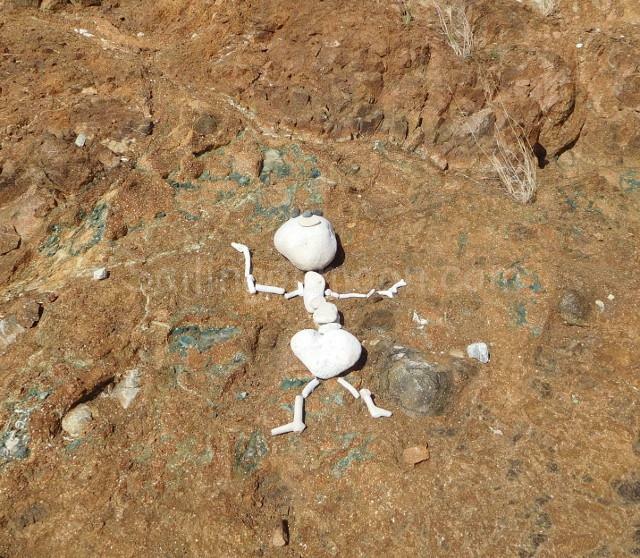 Alien skull we came across on the beach. 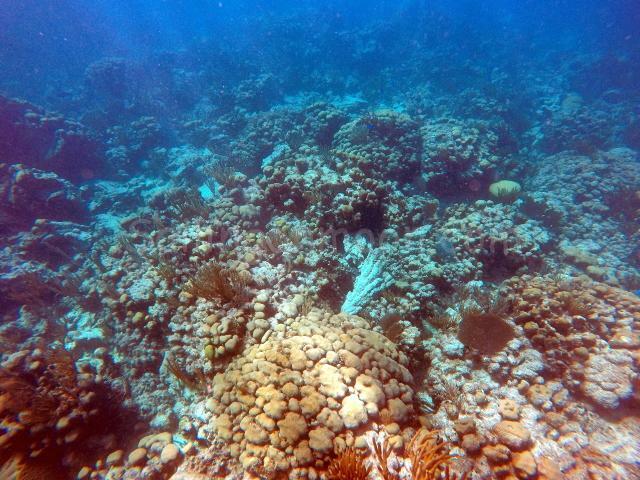 Just lying there among the coral! This summer season we are storing Moon differently than the last three years. 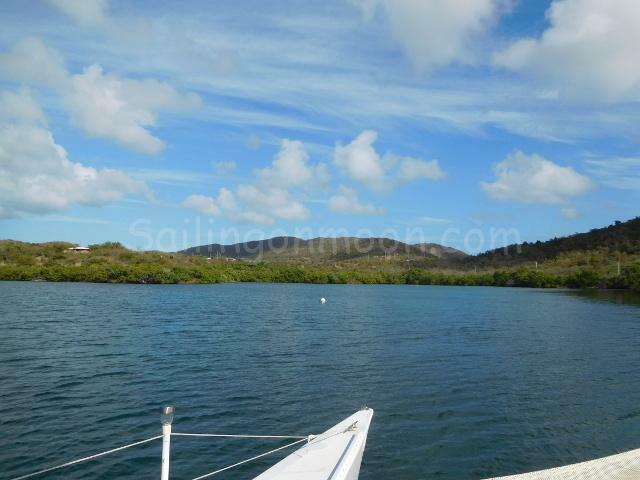 In the past we had stored Moon in Saint Kitts at Saint Kitts Marine Works, but this year Moon will spend her summer in a mangrove bay in Culebra, PR. I know some of you are probably thinking that we are crazy just leaving her anchored in the water but it is a safe and protected spot. In fact it is just outside of where the cruisers bring their boats if a hurricane approaches the area. 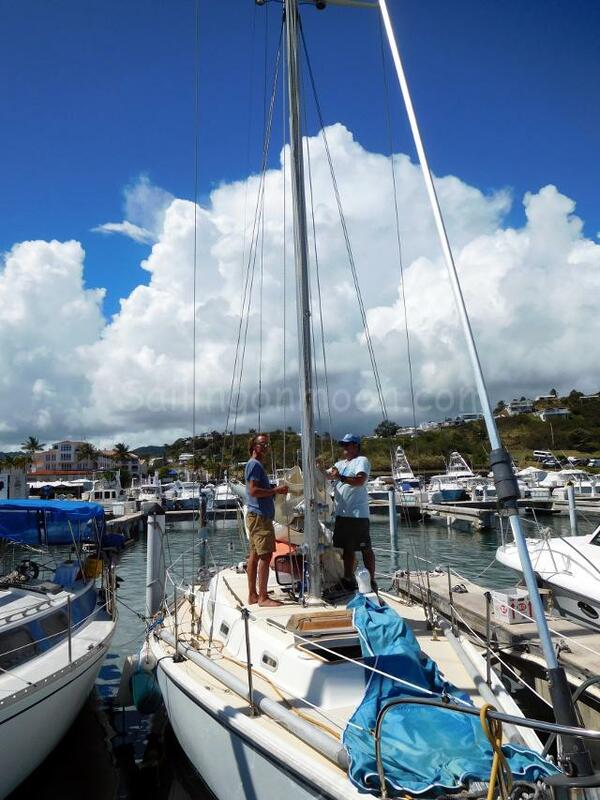 We’ve left her in Culebra before and then it was in the main harbor so we are confident this time that she is in a secure place until we come back. Either way it is always strange just leaving her anchored out. Heading into the bay where we are going to anchor Moon for the season. 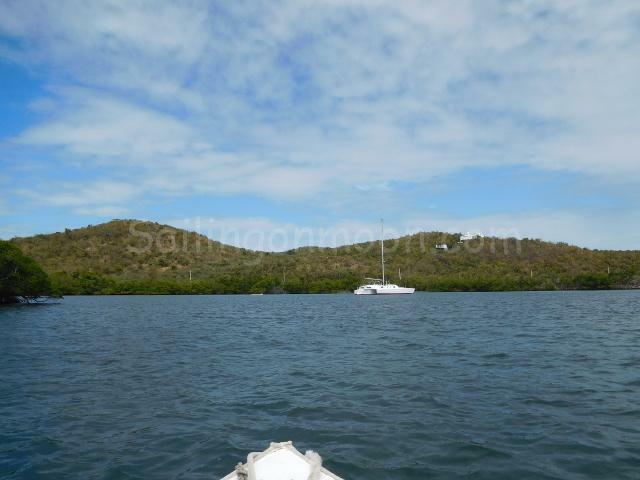 Just have to get past all these boats and tuck in close to the mangroves. Moon’s summer home will be just past that white ball, tucked in all by herself. Brian of course set us up for success and Moon should not be going anywhere. 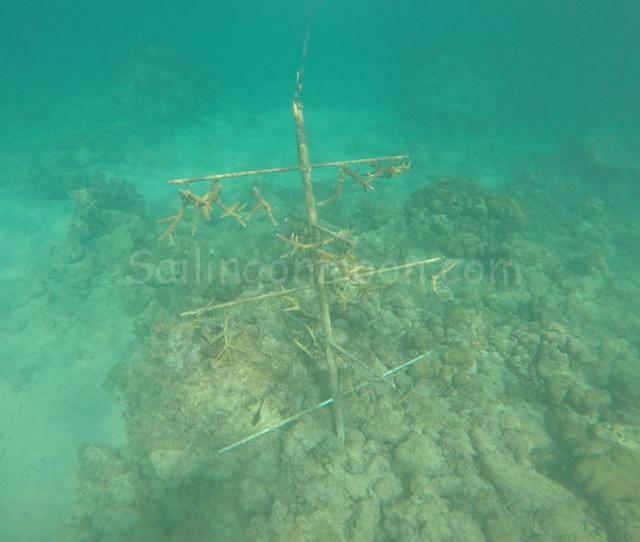 Check out our anchor system that he put in place…. 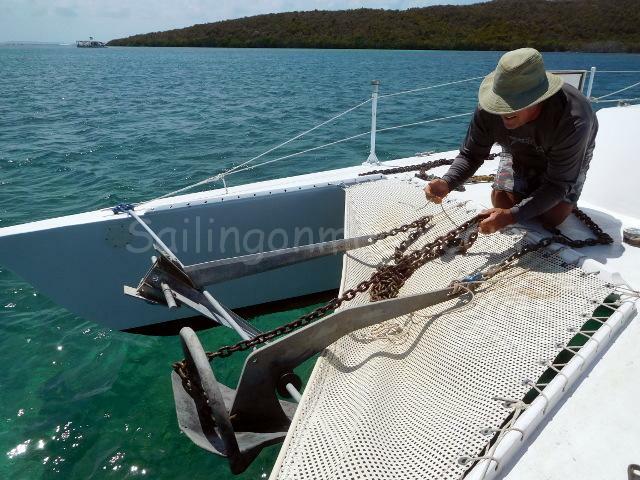 Three anchors: Our 45lb Rocna anchor, (which by the way is the normal anchor that we use and trust so much that we call it “The Sleeper” meaning that we put it down, set it and no worries), then we also set our two FX 37 Fortress anchors. 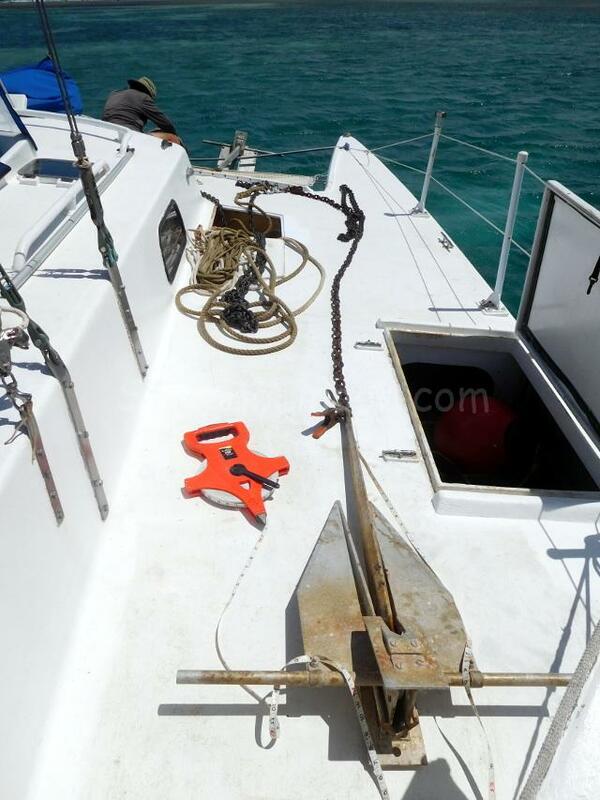 The method was two anchors in front of the boat leading to a center point with a swivel and then back to another Fortress anchored in the opposite direction just in case of wind change. Two forward facing and one rear facing. In tropical storms or hurricanes the wind completely changes direction, so that is what the third anchor is for, just in case. 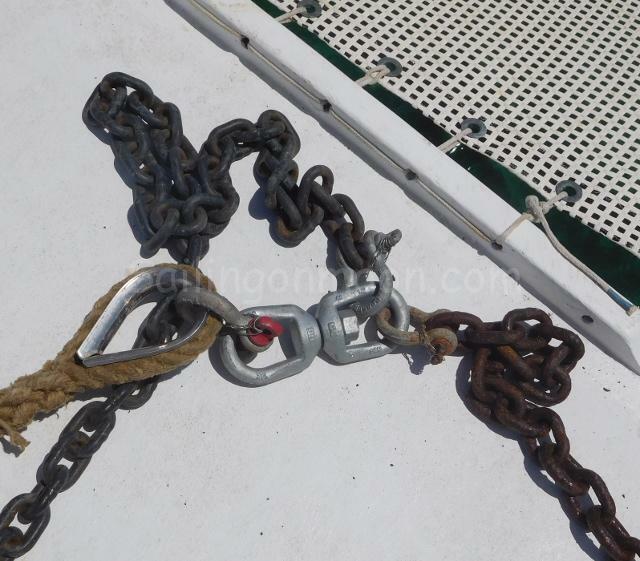 All of our ground tackle is tied together with US rated shackles, chain and swivels. 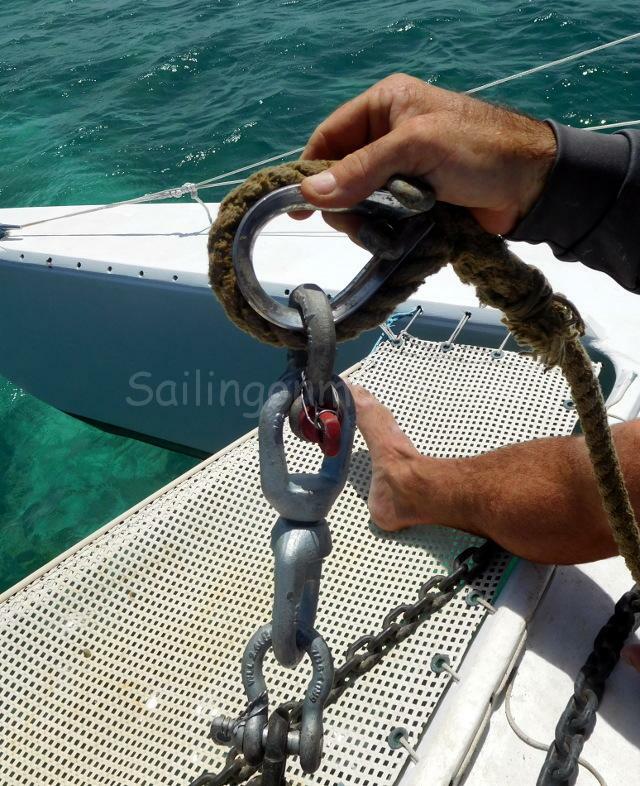 Then we have the anchor rode tied to 6 different cleats just in case of any chaffing or if a cleat was to become loose or let go. Some would say that it is a bit of overkill but we call it insurance at least as much as we can. We plan on finding her (Moon) right where we left her! The spot that we choose was also important. 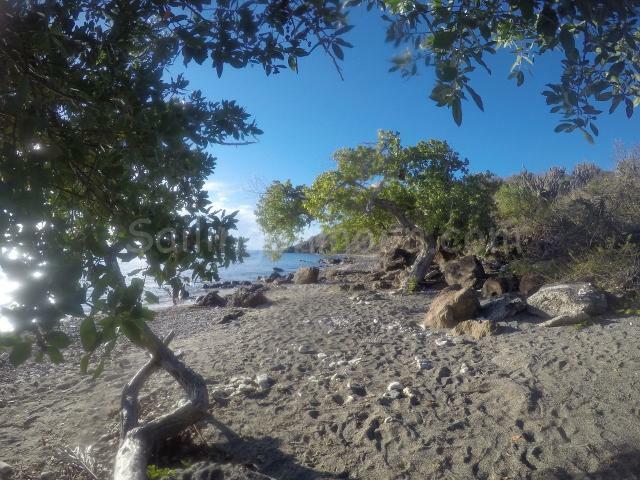 We tucked into a small hole in the shallows with three sides surrounded by mangroves. 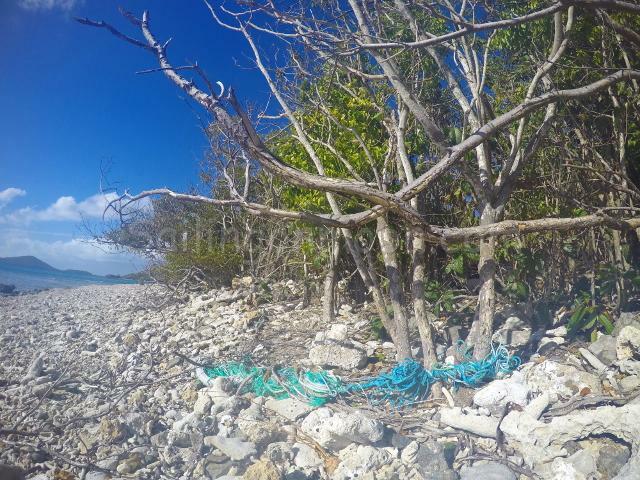 This is about the best that we could do without tucking into the mangroves themselves. It would be inconsiderate and not permitted for us to go all of the way into the mangroves unless there is actually a storm approaching. They are a protected area. All this being said we are just a few hours away by plane should a storm approach while we are away. 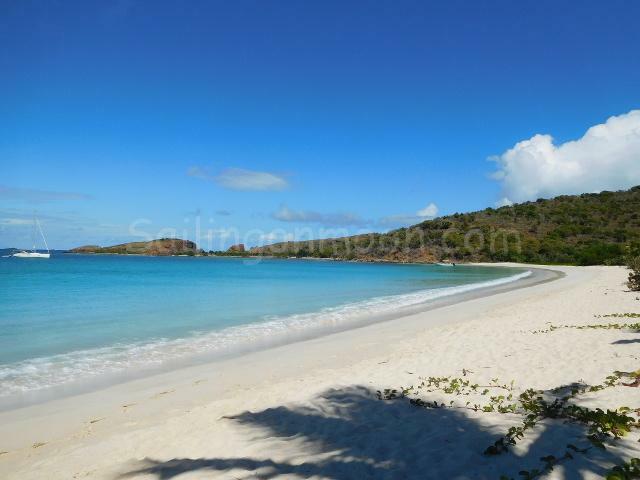 That is also another reason that we choose Culebra this year, location, location, location! 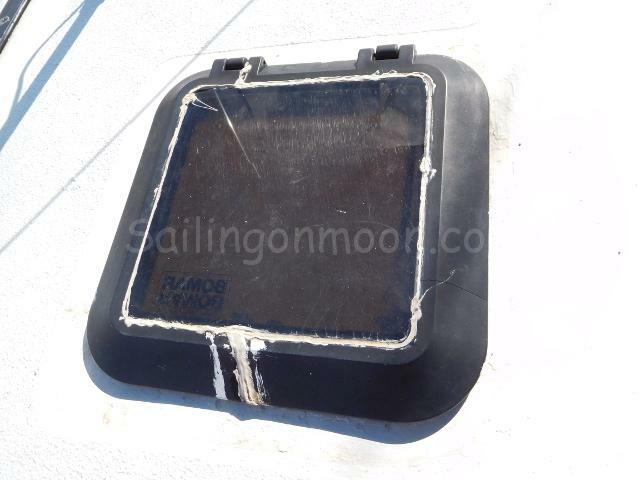 Moon also has her own phone on board and we can text her anytime and she will give us her GPS location and there is a grid set that if she should go out of it she will text us so that’s another thing that we have to make us feel better that she is doing OK on her own. Of course we have friends watching her too just to make sure that she is staying afloat. So pretty sure that she is set up for success while we are away. Moon stripped down for the season. Windsock will be the last thing to come down. 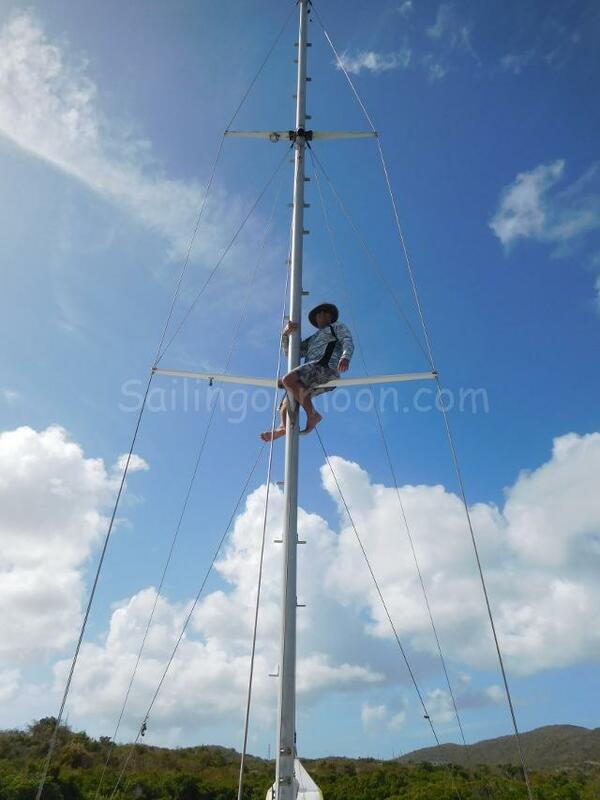 Brian climbs the mast to see how we look in the spot that we picked out. 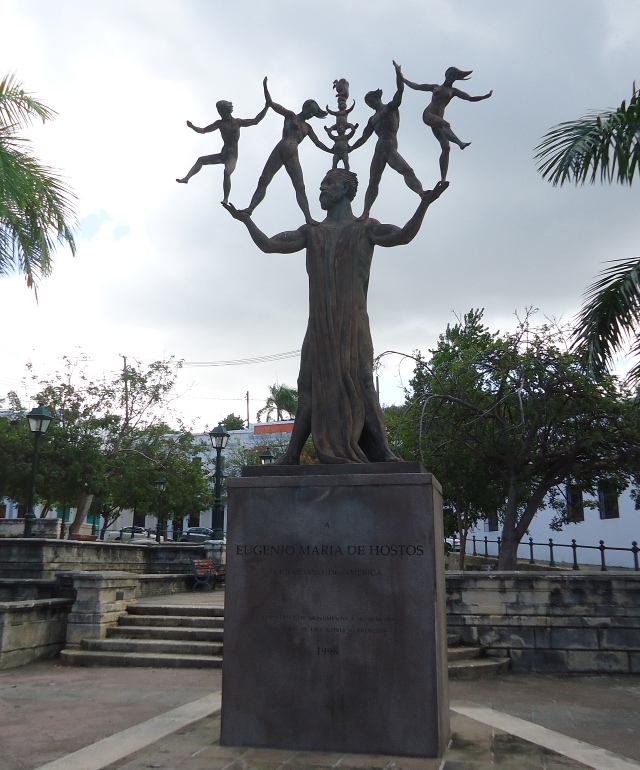 On our way back to PCB we spent a night in Old San Juan. Love this place so full of history and things to do! 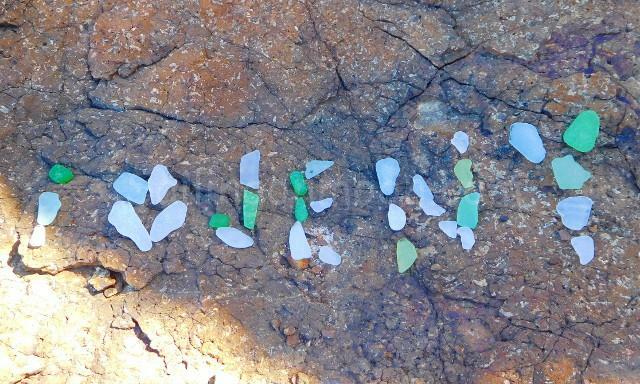 We even found a beach with sea glass and chaney! 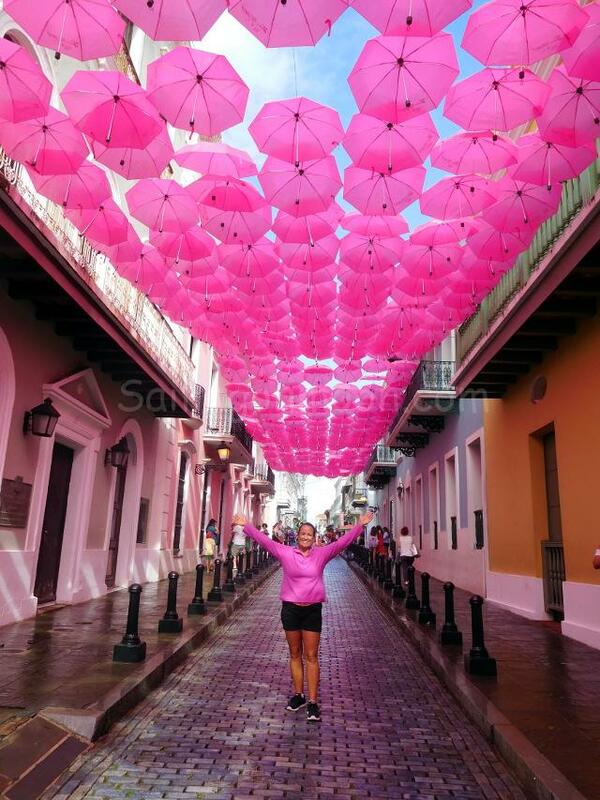 Just happened that my shirt matched the umbrellas on Fortaleza Street in Old San Juan! As promised we’ve been busy having fun and we took lots of pictures to share with you. We’re not going to write much this round, we will just let the pictures speak for themselves. I mean lets face it, most of us just scroll through the pics anyways! 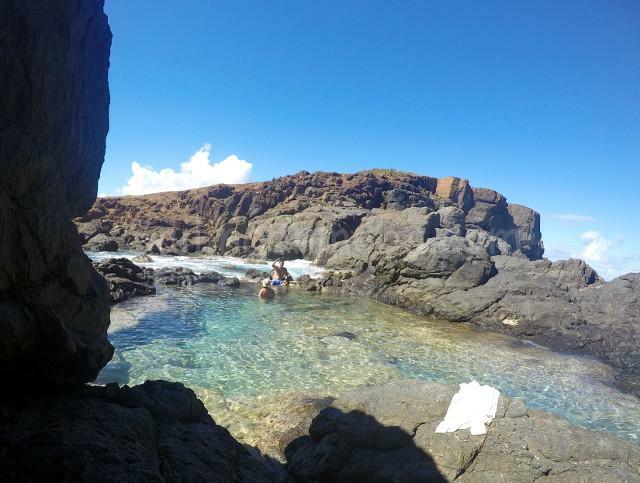 We hiked to our secret tide pool on the south side of Culebra and we remembered our camera this time! Bringing the dinghy into the beautiful cove that we walk to the tide pool from. From here we climb up to make our way to the tide pool. 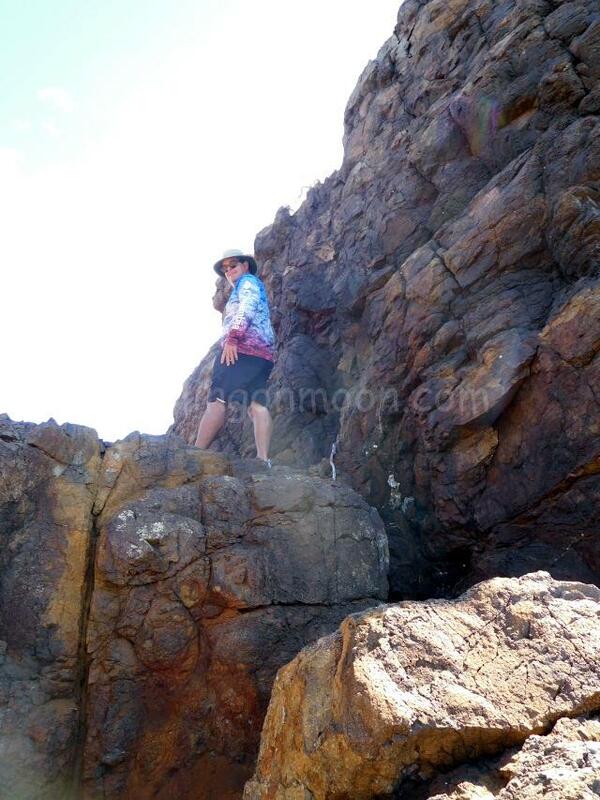 Scrambling over, up, down and around to get to the tide pool. 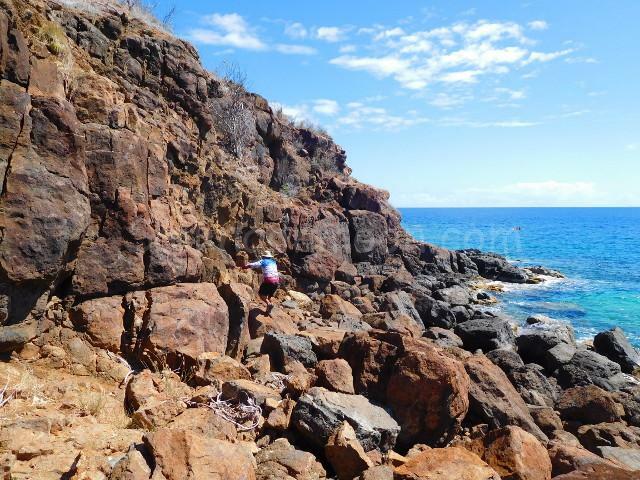 Almost there…just have to get to the jagged rocks at the end. 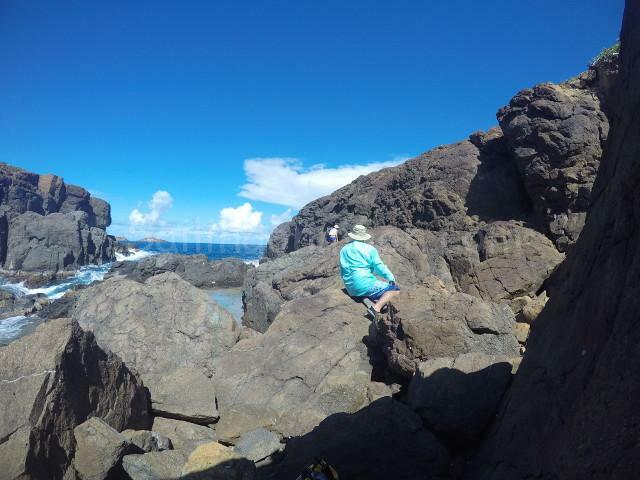 Last big boulder to climb over and we have made it to our secret tide pool! 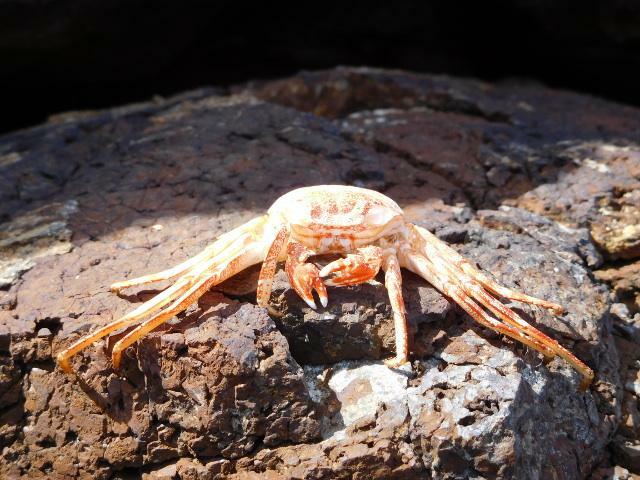 Mister crab hanging out at the tide pool. 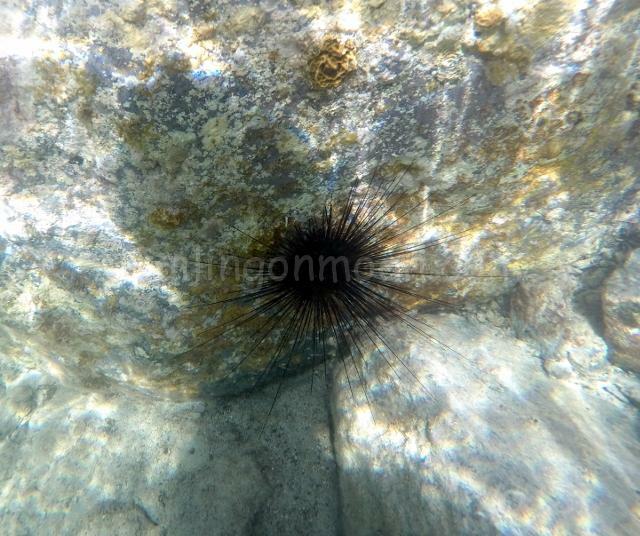 Had to watch out for the sea urchins in the tide pool! 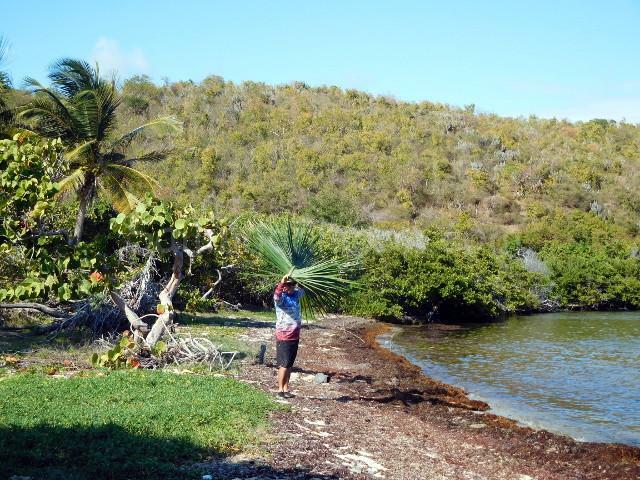 On the way back to the dinghy Brian cut a palm frond to make a hat. 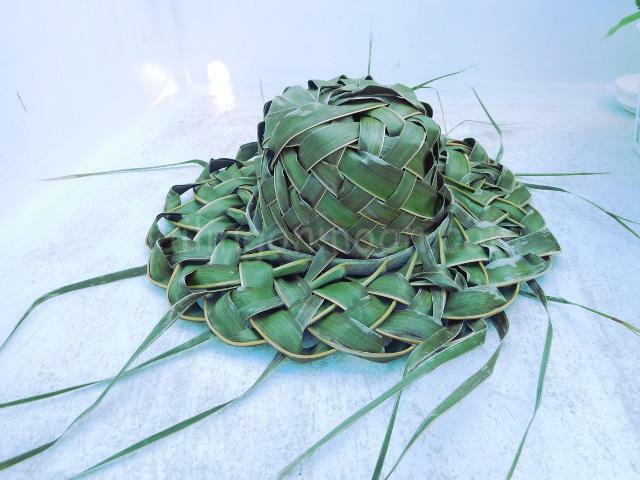 It’s been a while…we were in Jamaica in 2011 where our friend Lance taught Brian how to weave a hat, but after a bit of rum the skills came right back! 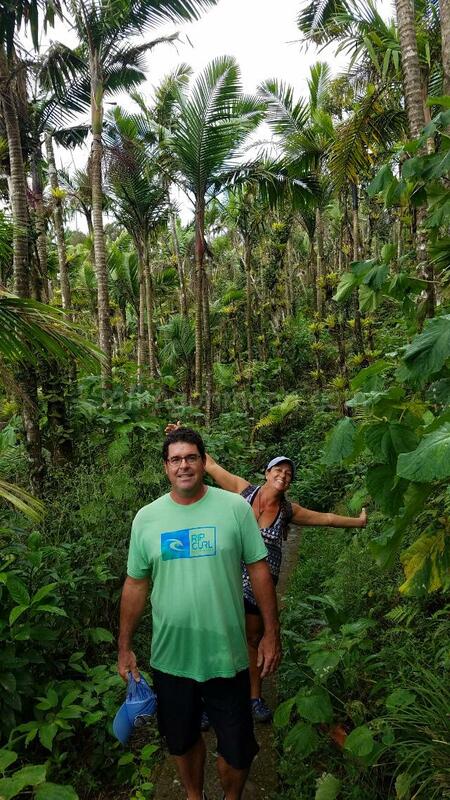 Brian looks like an island native carrying that palm branch. It’s hard to find just the right one that is easy to get to. I see the look of success on his face! 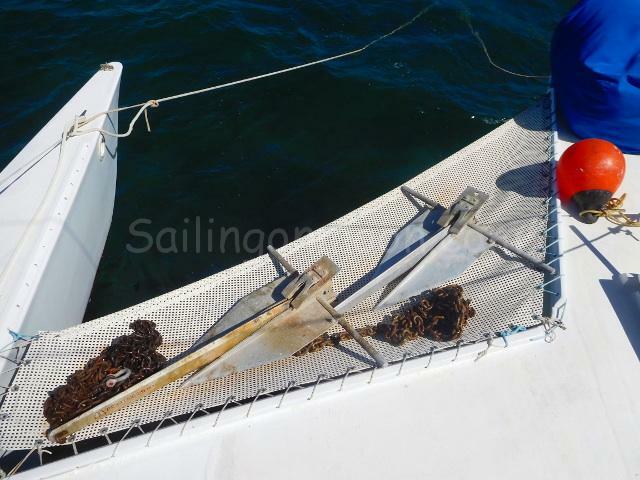 I’m sure that we were a sight carrying this back on our dinghy…the branch was bigger than we were! Brian’s finished product! Looks awesome too! I still need to cut off the tails as the final touch. I want it to be completely dried out before I do that though just in case of shrinkage. 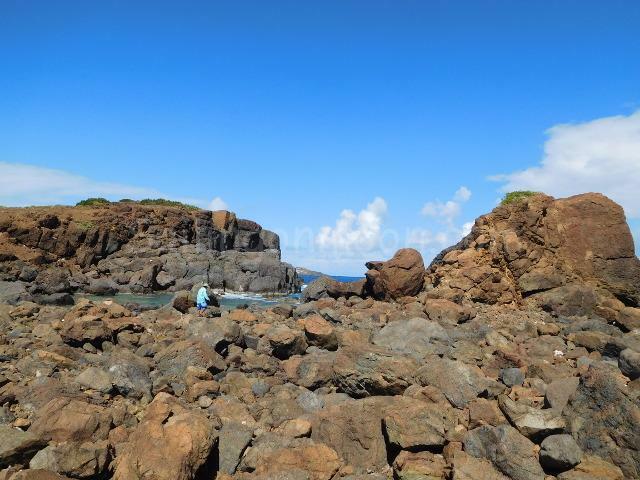 Next we found a new snorkel spot also on the south side of the island but not near the tide pools. 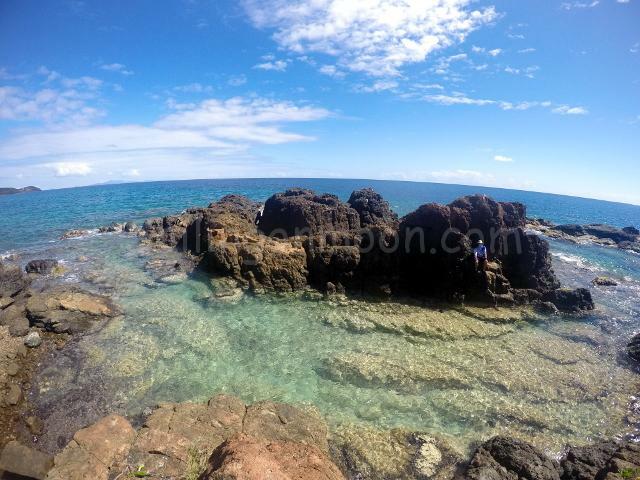 Normally it is too rough to snorkel here but we had a few calm days and we were really glad that we checked it out. 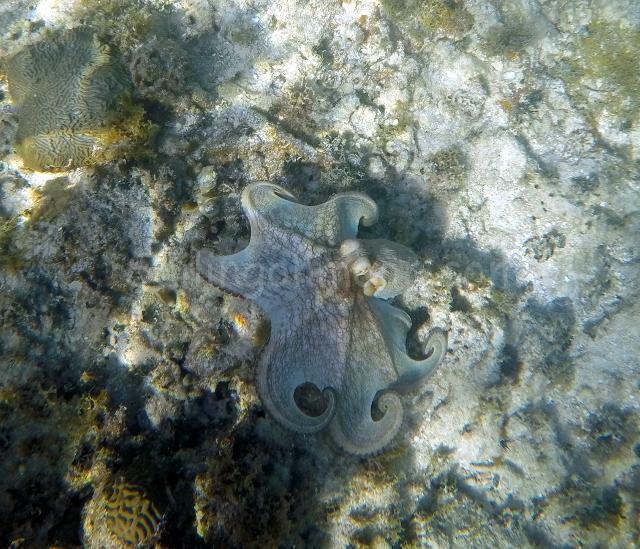 We even saw an octopus! I see you looking at me, looking at you! This guy was so patient, like he was showing off. When we came by to take his picture I could have sworn that he posed for us! 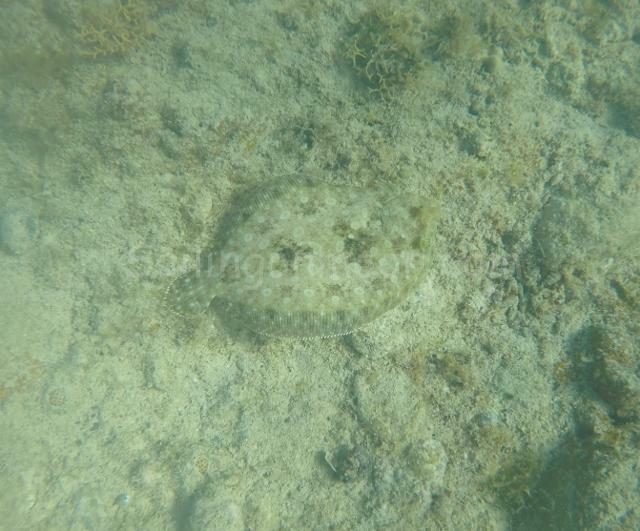 I think that he is a trunk fish. 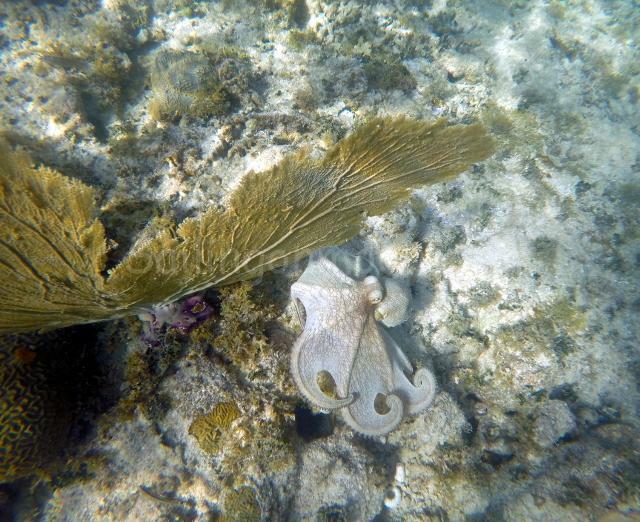 Octopus on the move….soooo cool! 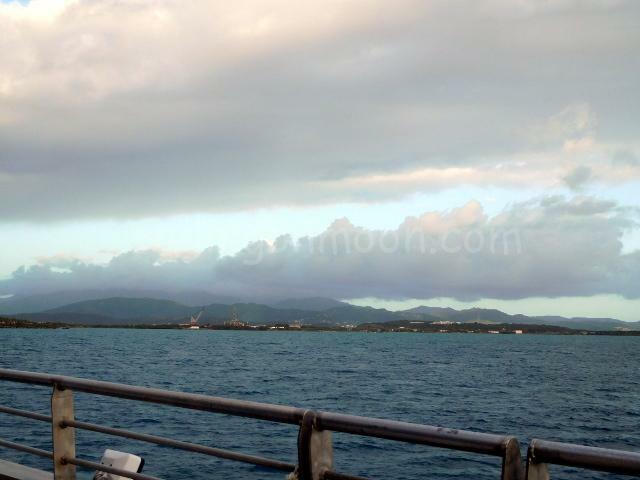 A friend of ours recently bought a “new to him” boat and we took the ferry again to the main land PR to check it out. The guys had a great day going over the boat and I had fun hanging out at the marina. I even saw a manatee, but the dang thing was so fast I could not get a picture to share with you. You know that manatees are known for being speedsters 🙂 !! 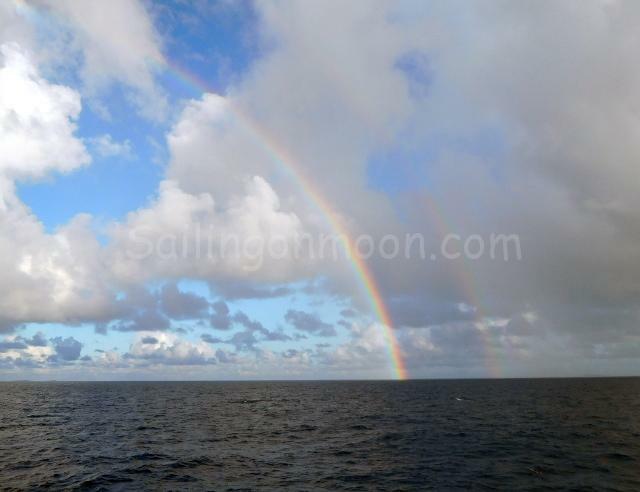 We spot a beautiful double rainbow as we take the ferry to mainland Puerto Rico. Our friend Chris just bought a new to him boat. 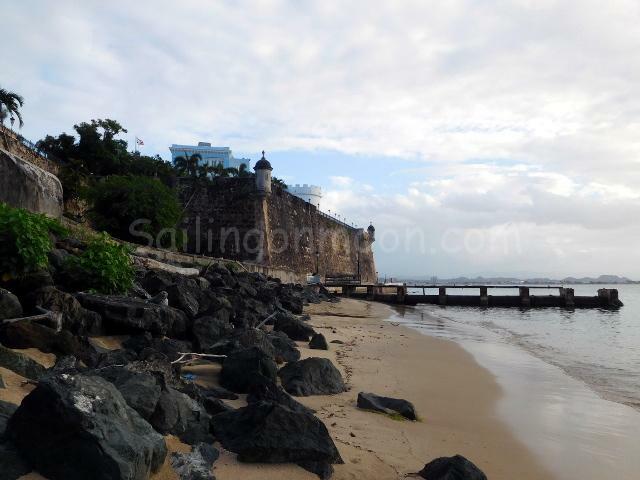 Brian and I went over to Fajardo, PR for the day to hem him get things settled. 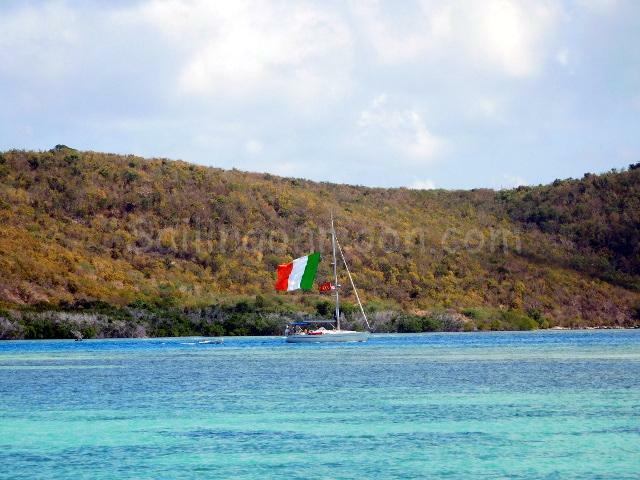 Not our friends boat but saw this going out the pass…this has to be one proud Italian! 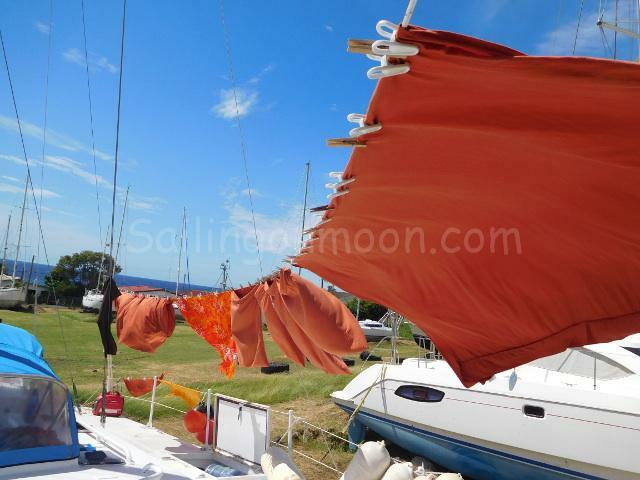 I think that this is the biggest home flag that we have ever seen on a of sailboat this size! We put together a couple of art projects that we had been planning for a while that we think turned out really nice. Lots ideas in the works so we will see what else we can come up with. Some artwork that we made of treasures that we found while beach combing. 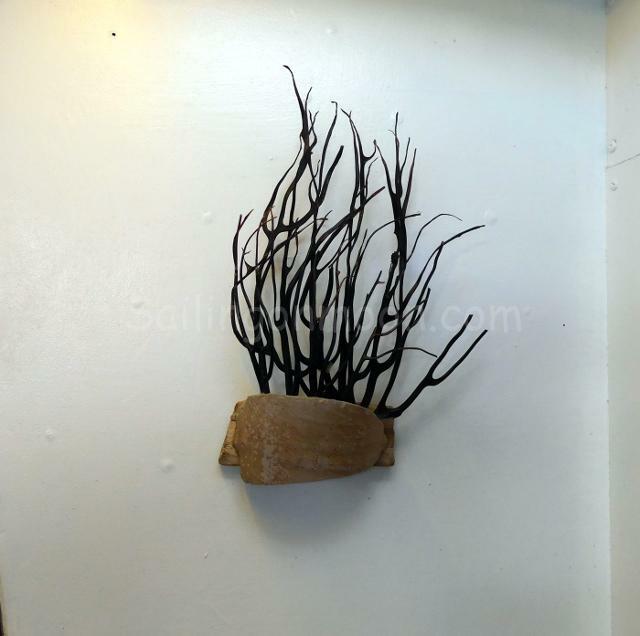 It is made of old pottery that I found on the beach in St.Kitts and a long dried out coral sea fan. It is mounted on the wall in my galley. I love it! 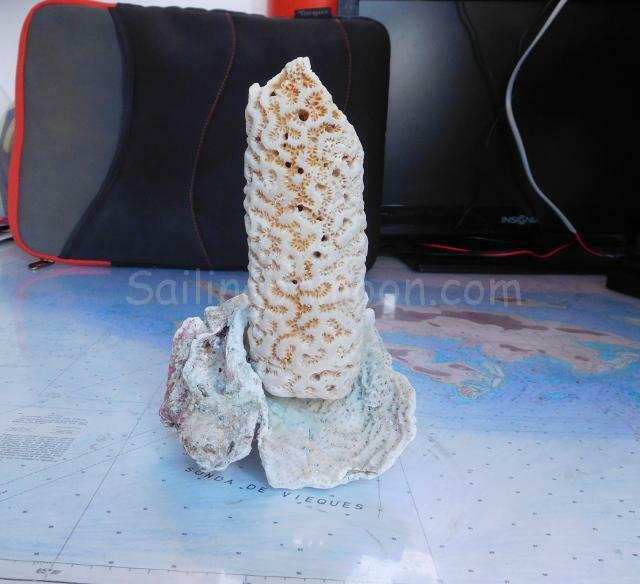 A night light that Brian made with a naturally hollowed out piece of coral that he found. As you can see we have been having a great time. Weather has changed quite a bit for us today. It is howling out right now and supposed to get even windier into tonight and tomorrow. Gusts to 30 knots! 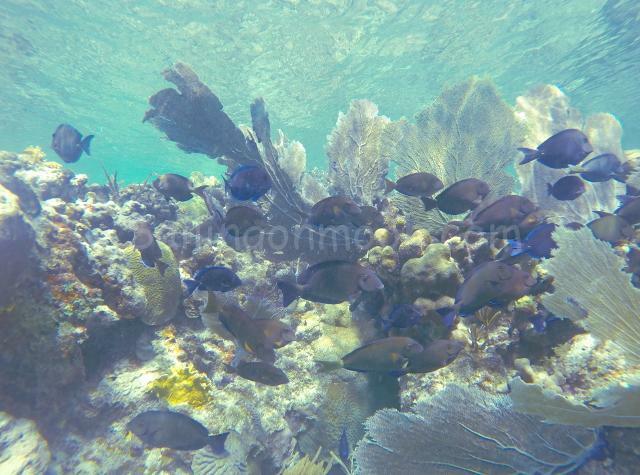 Lucky us we are once again tucked in behind our favorite spot at Dakity Reef. 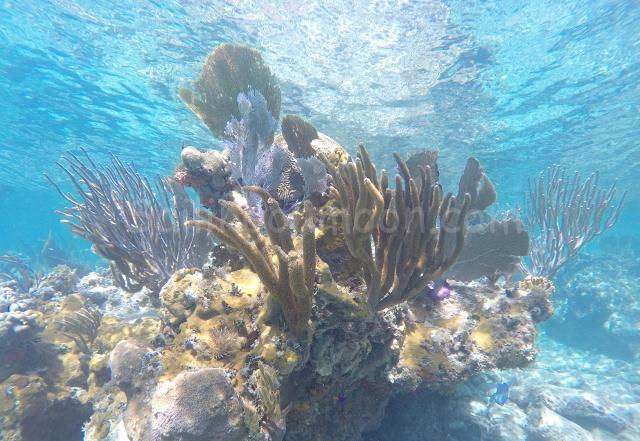 With all of this wind the waves are really big here behind the reef….like 5 or 6 inches! LOL! 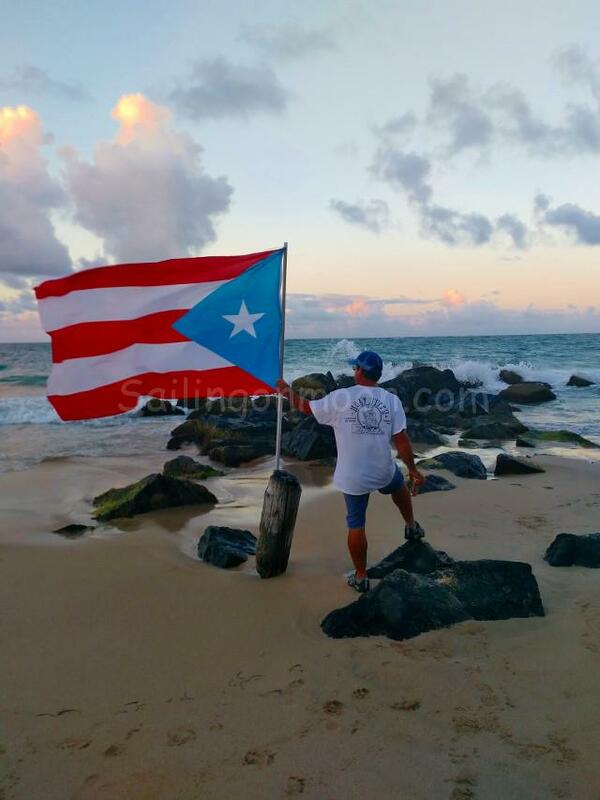 “Hector el Protector” before Hurricane Maria. Hector el Protector, A work in progress. 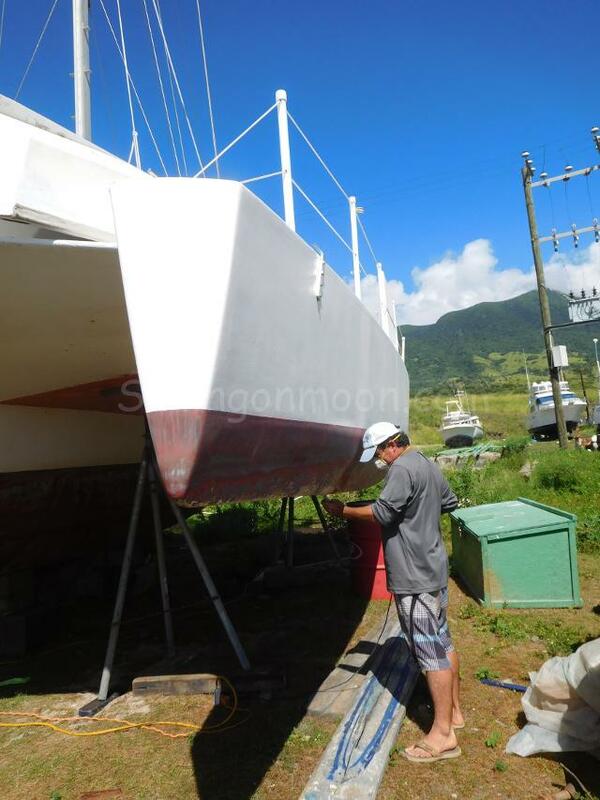 Brian is still working on boat projects and Moon is still getting some of the attention that she needs. Other than that we are just hanging out and enjoying it while we can. We’ve already started talking about when we will have to return to work and we know that it will be here before too long. 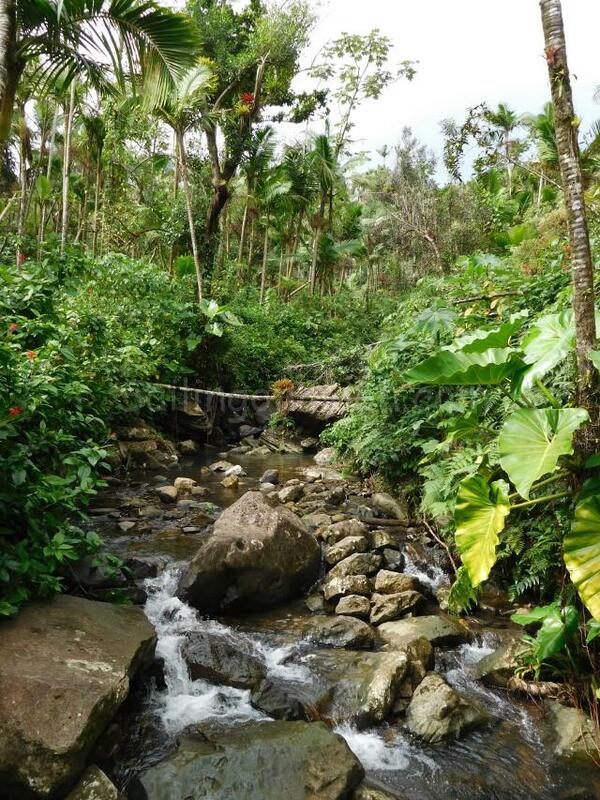 Until then we are going to keep our feet wet and enjoy our time playing tourist! 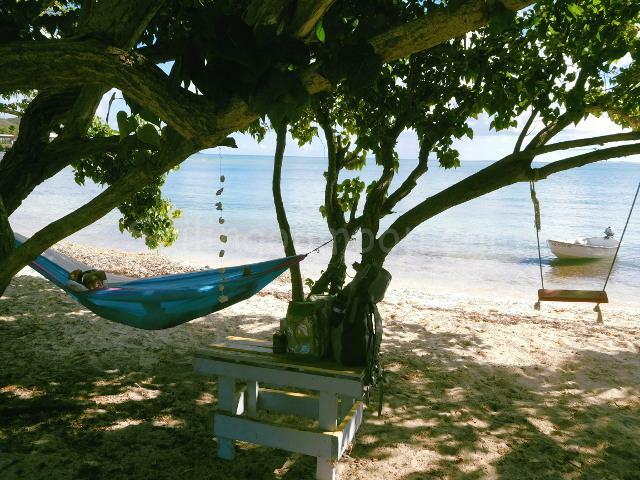 Enjoying my Valentines Day gift…a new hammock! Enjoying the view while I swing in my new hammock. Hi there. 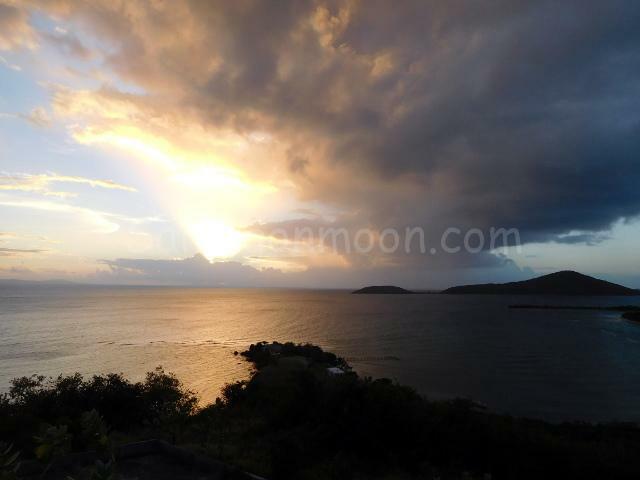 We are here again to share some of what has been going on here in Culebra, PR the island of sun and fun. 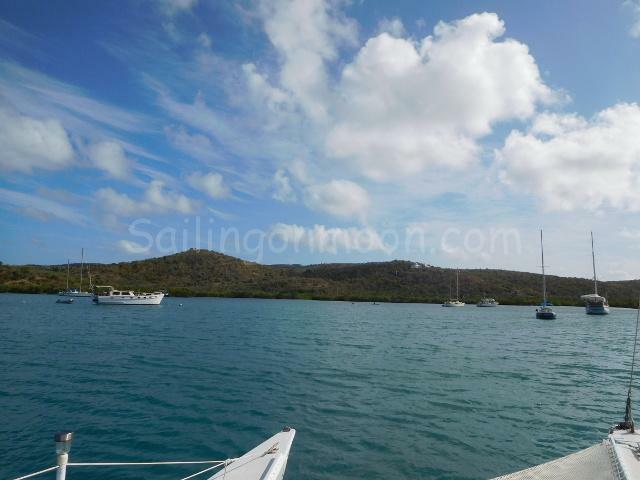 Ensenada Honda Harbor, the main anchorage in Culebra. If you zoom waaaay in you can us all the way to the left hand side and closest to the trees. Cloud front moving across the Ensenada Harbor. Double trouble! 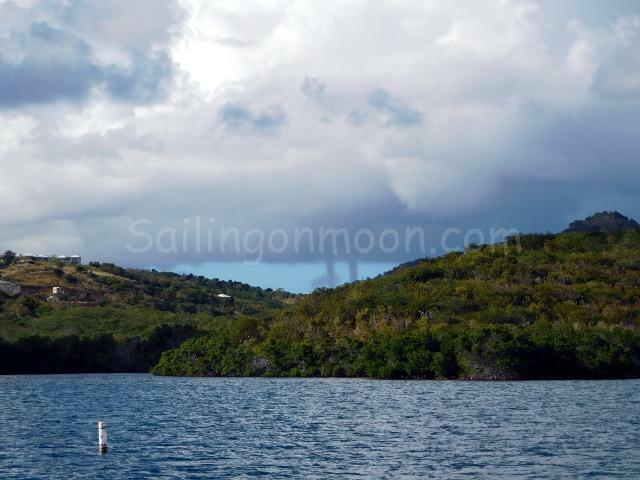 Two waterspouts spotted along the hills behind us. 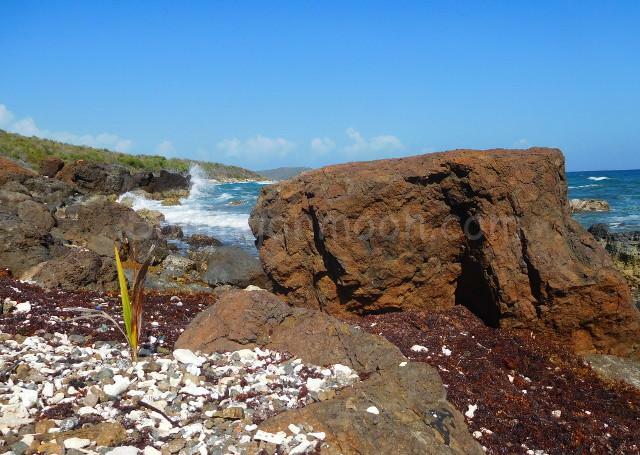 As always we have been exploring and I think that before long we will have walked the entire coast line of Culebra. We’ve got a ways to go still, but we are off to a good start! 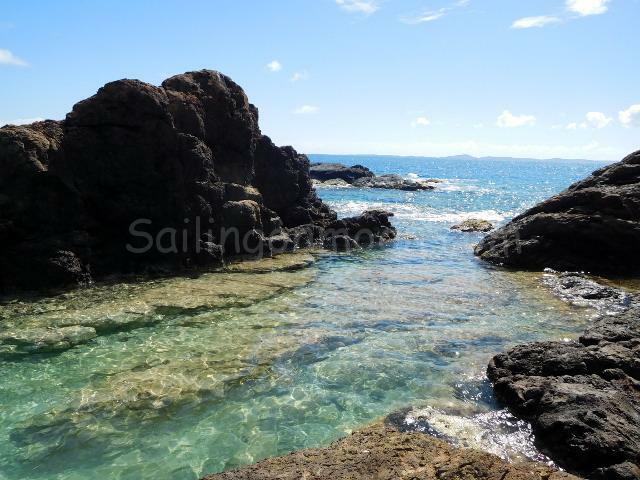 Typically we find a nice place that we can pull our dinghy up to on the beach and then we walk until either our feet give out or we come across boulders that we can no longer scale or climb over, (usually the latter of the two turns us around). 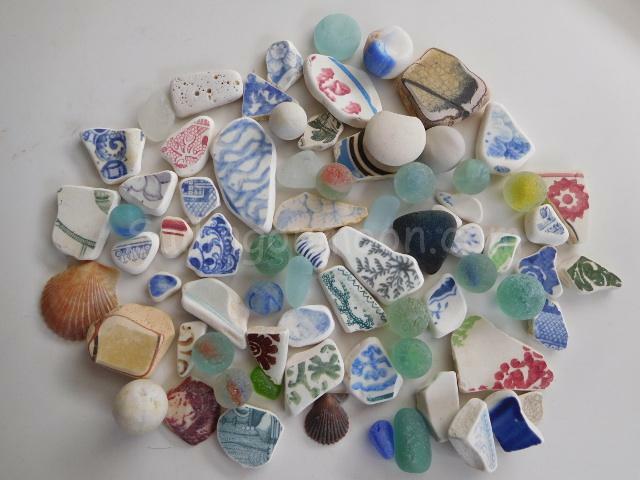 One of the reasons that we like to walk the coastline is to scavenge the beach for treasures. Most of this time is spent looking down where we are putting our feet so that we don’t lose our footing that I’m sure that we are missing out on some good stuff that is probably right under our noses! That’s OK though because we are still finding some cool stuff and have even started some projects that we will share with you on our next posting. 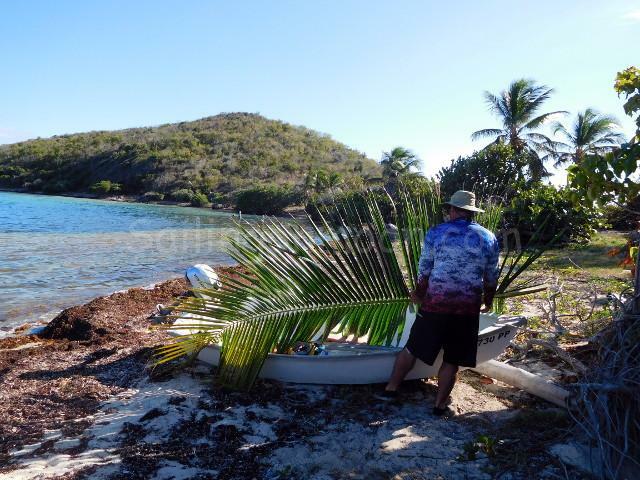 Our dinghy getting some rays resting on the beach. 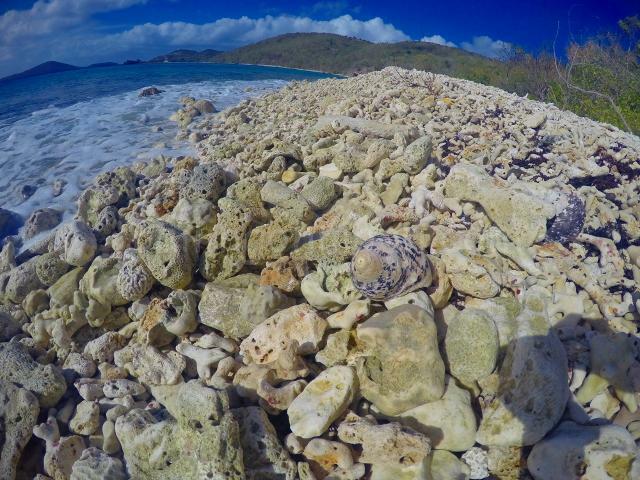 Bones…all of the dead coral that has washed ashore….lots of it on the beaches here after the hurricanes. 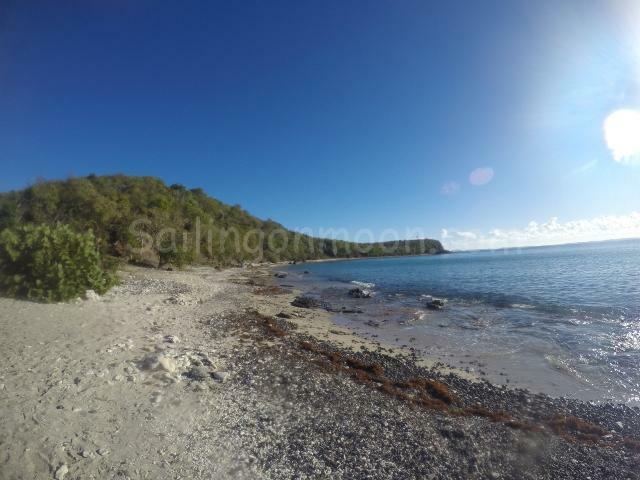 Beach / Shoreline on South West of Culebra. 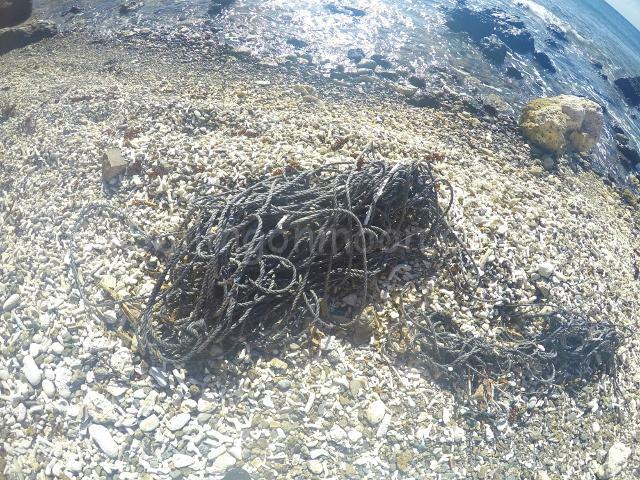 Fish net washed up on beach…a pretty common sight. More line washed up on beach. 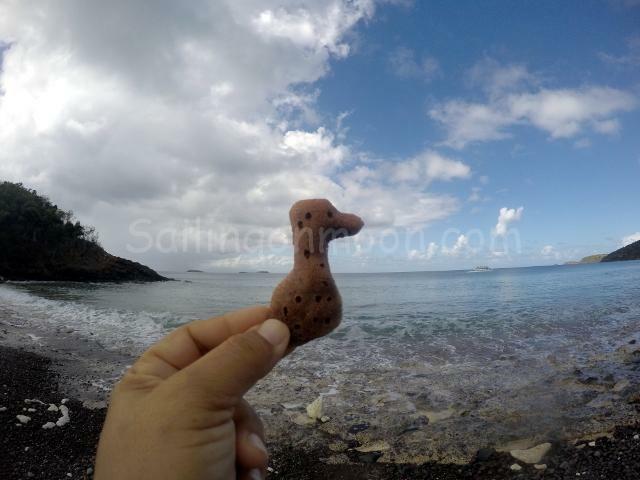 One of our latest adventures brought us to Carlos Rosario Beach. 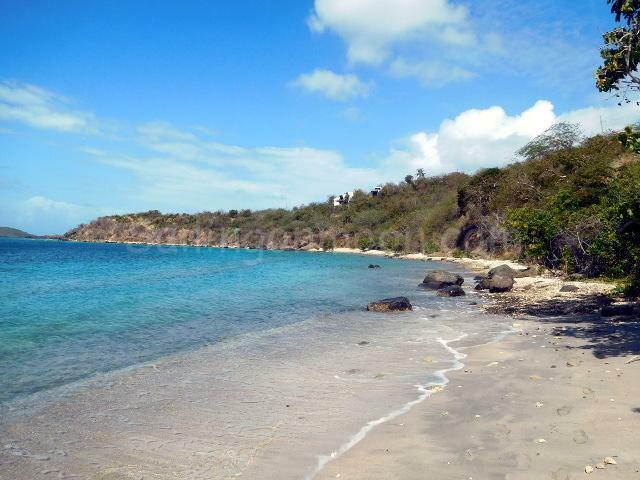 Just when I thought that we could not find a beach better than the last we come across another treasure here in Culebra. 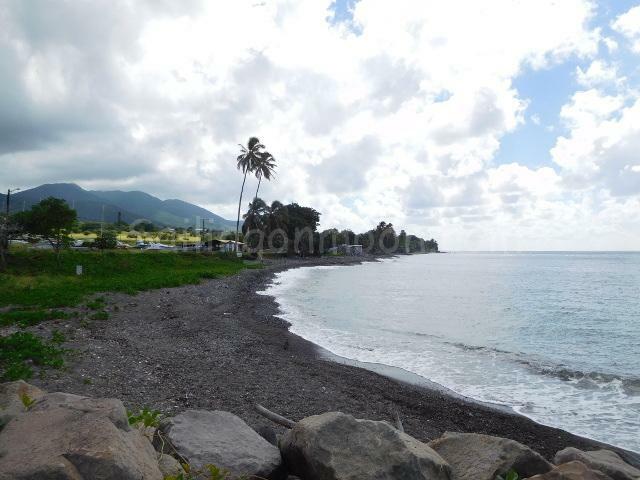 This beach is at the most NW tip of the island. 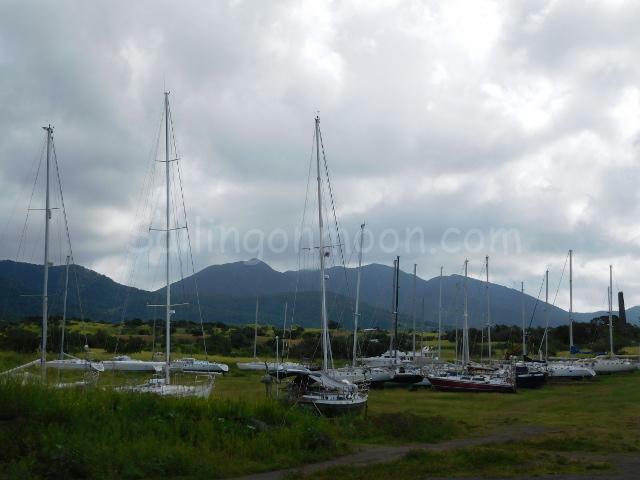 We took our dinghy over from the main harbor where Moon was anchored (Ensenada Harbor). 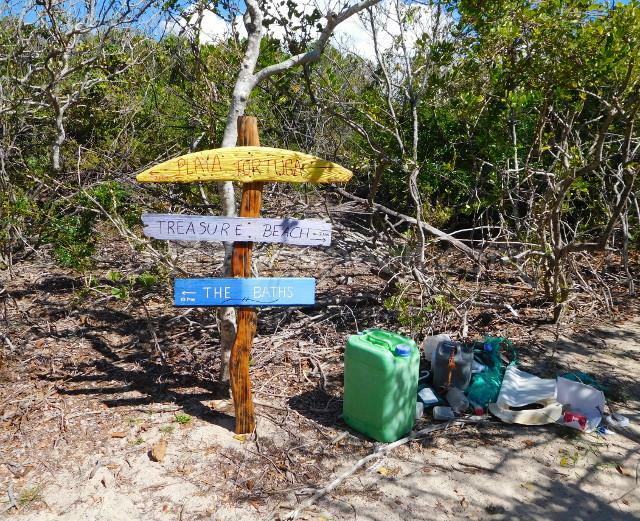 Here we pulled up on Tamarindo Beach and walked across a small path to the other side. Because Carlos Rosario Beach faces north it normally has a bit of wave action but on this day it was about flat calm as it could get. 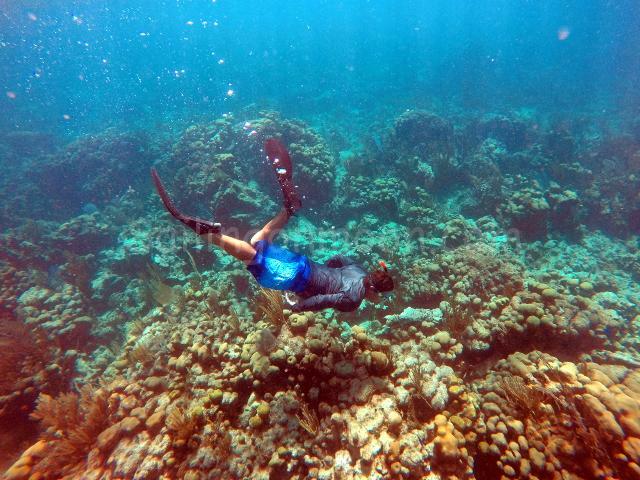 With our snorkel gear in hand we jumped in to check out the reef. All we can say is WOW! 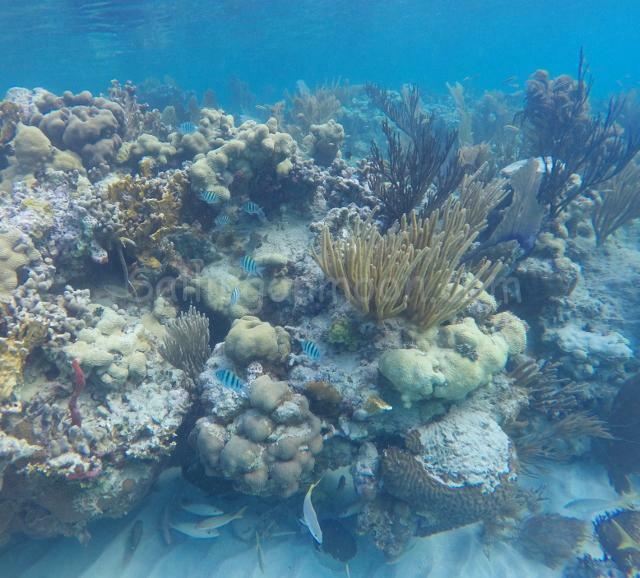 Here was the most amazing reef that we’ve seen as of yet. 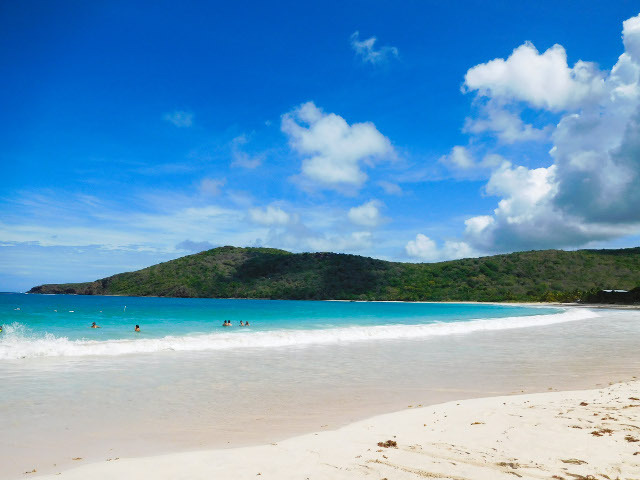 Carlos Rosario Beach on Culebra’s North West tip. 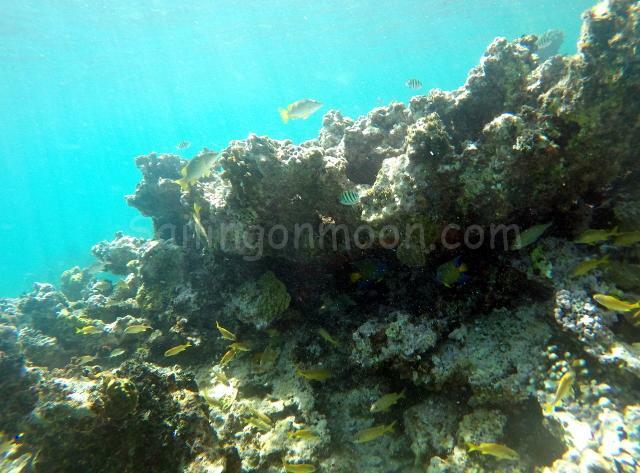 To get to the reef you swim from the beach through a flat sandy patch and then the water comes alive with life. 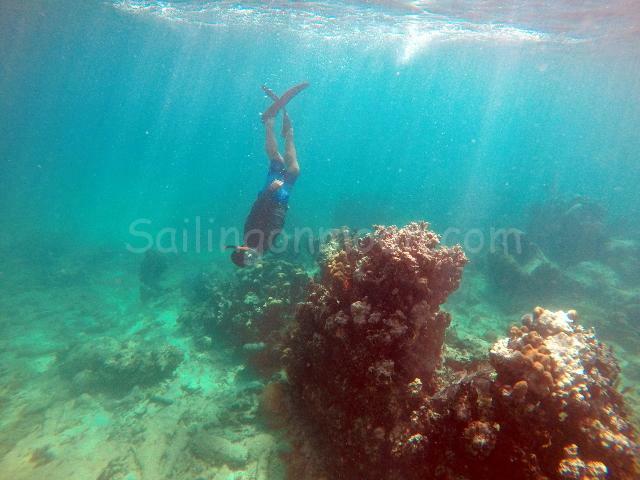 The reef is a bit of a deeper swim but well worth it! It was so beautiful! 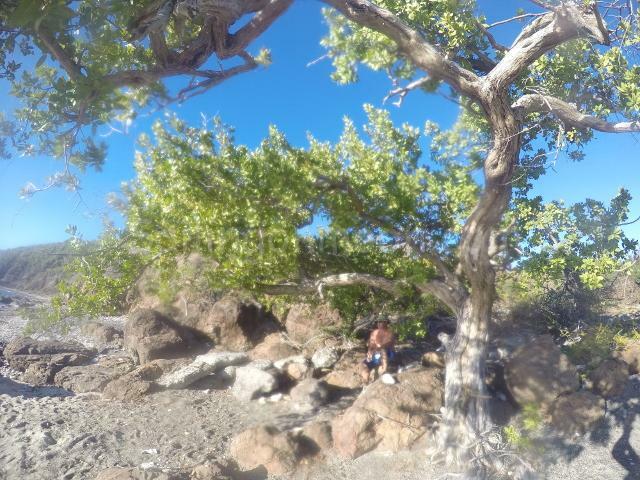 I got a few pics before my go pro went dead. This seems to be a recurring event with the damn thing so not sure what we need to do to get it to stay charged longer. Brian said maybe a software upgrade. Anyhow I was able to take a few pictures to share with you before the battery died. 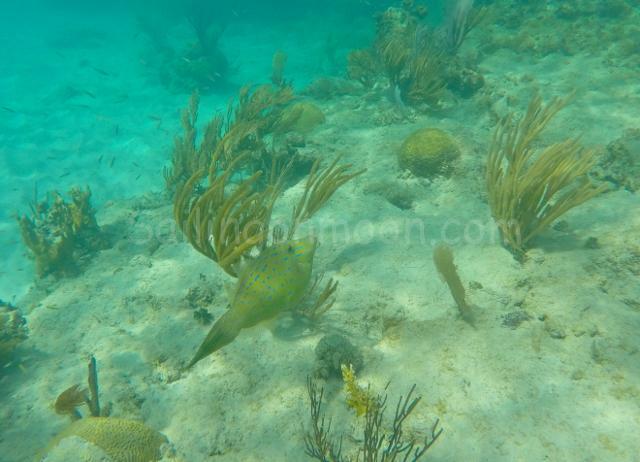 We even saw a medium size nurse shark. What a great day that was! 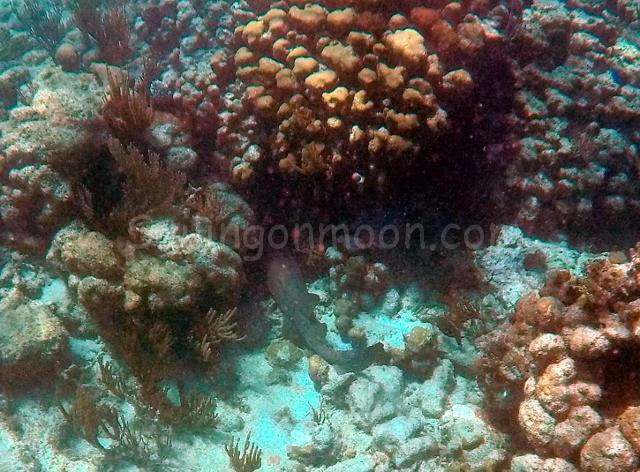 Nurse shark hiding/sleeping in the coral. Love these little blue guys! 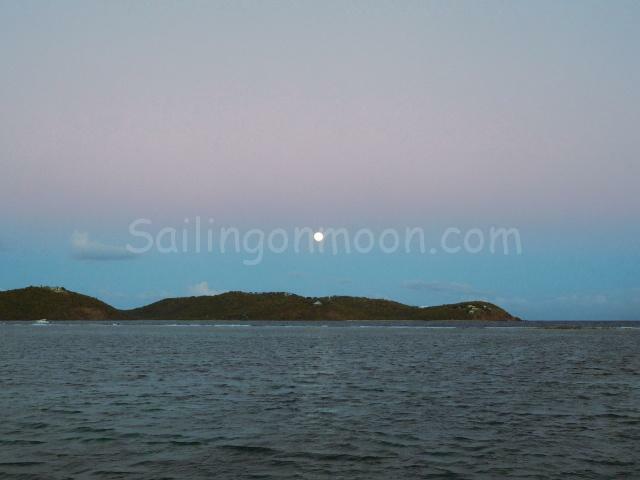 Leaving on the ferry from Culebra at 7:00 am heading to the main island (Puerto Rico) to …. go to walmart! How exciting is that! 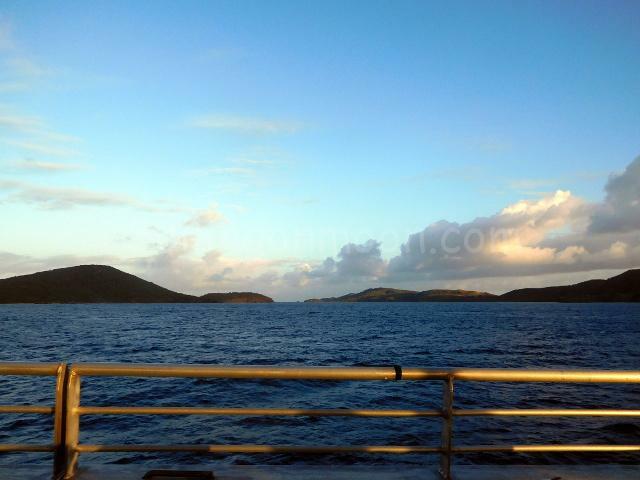 Approaching Roosevelt Roads as we arrive on the ferry from Culebra. 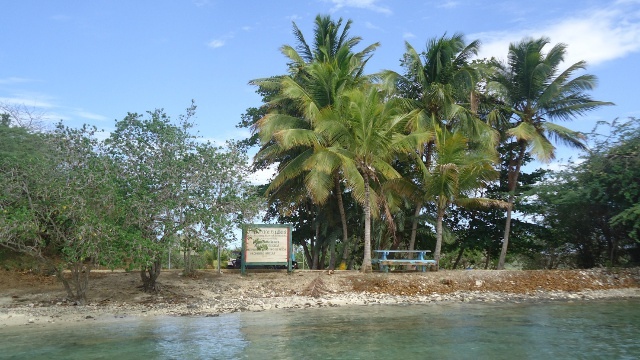 Looking towards Roosevelt Roads from the ferry. 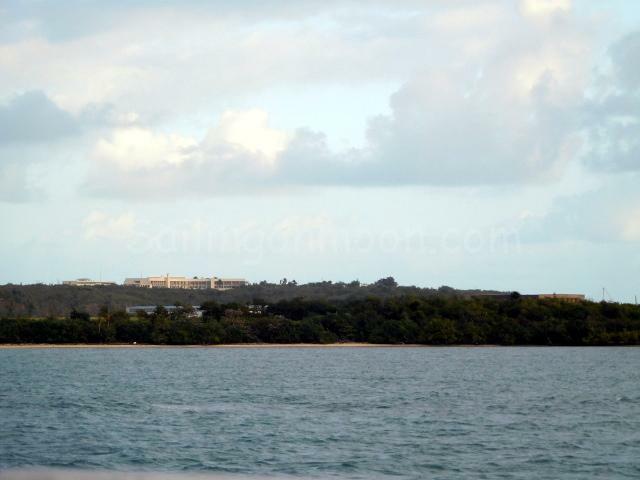 Approaching Roosevelt Roads in Main Land Puerto Rico. 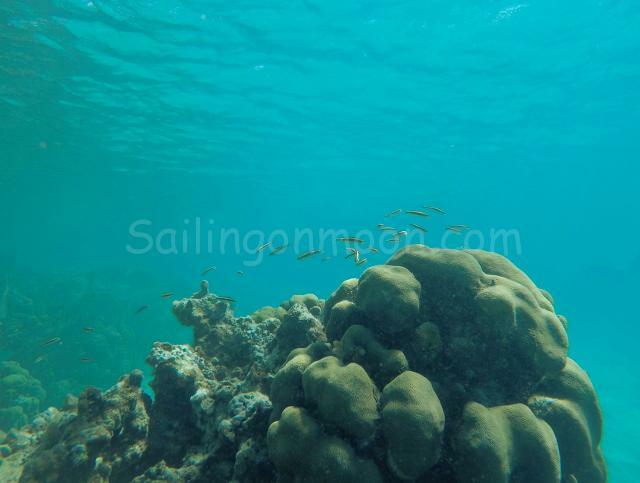 We move Moon every few days or so from behind the reef at Dakity to the main harbor to get groceries and ice and such. Still the same most days, working in the mornings and playing in the afternoon. Unfortunately we do not get to see the sunset on the water like we are used to back in our home in PCB. Here it usually sets behind the hills that we are by, but the sunrise is another story and we have a great view of it when we wake up early enough. It is an amazing way to start the day! 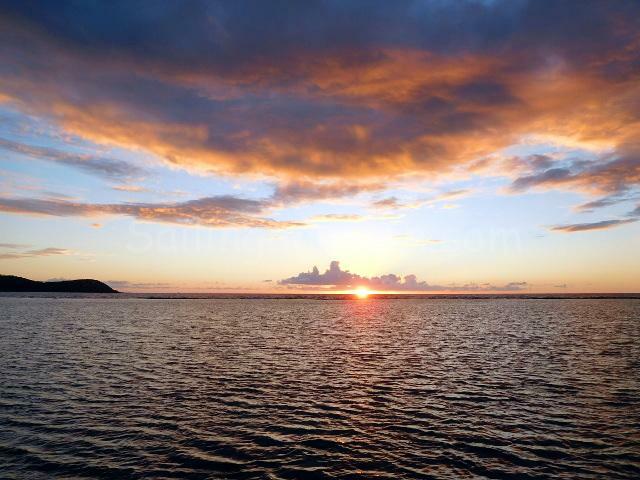 Sun setting behind the clouds looking towards the main island of Puerto Rico. Watching the sun set with a few friends and a pup. From where we anchor we can’t see the sunset 🙁 , but when we get up early the sunrises are spectacular! 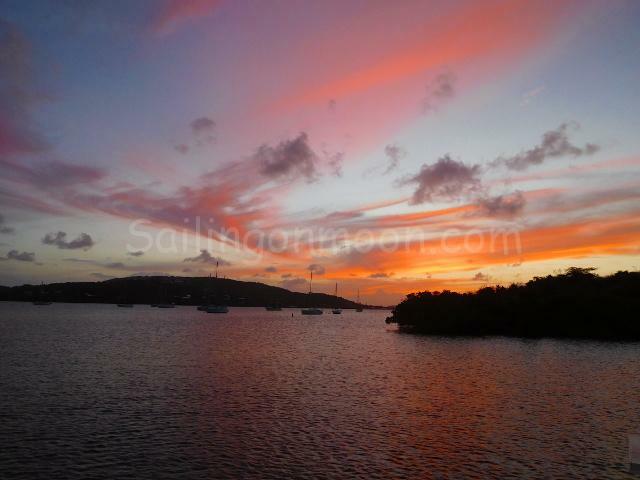 Looking towards the boats moored in Dakity at sunrise. 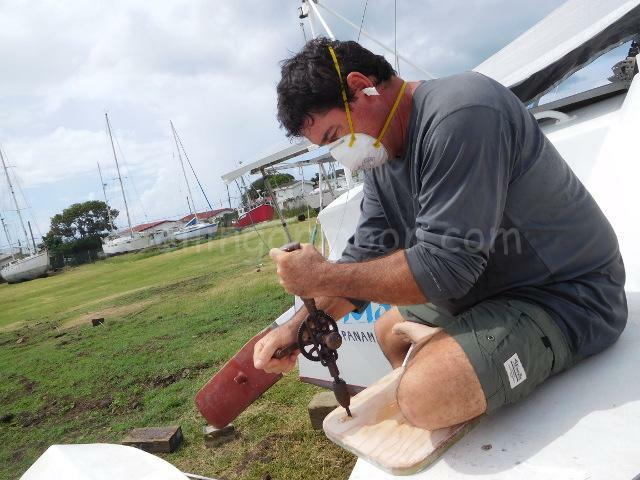 When we pulled up to this mooring ball the eye was completely worn through so Brian spliced a new one. Take care for now all until our next adventure…. OK sure we are already on an island, but that does not mean that we can’t go and visit another. 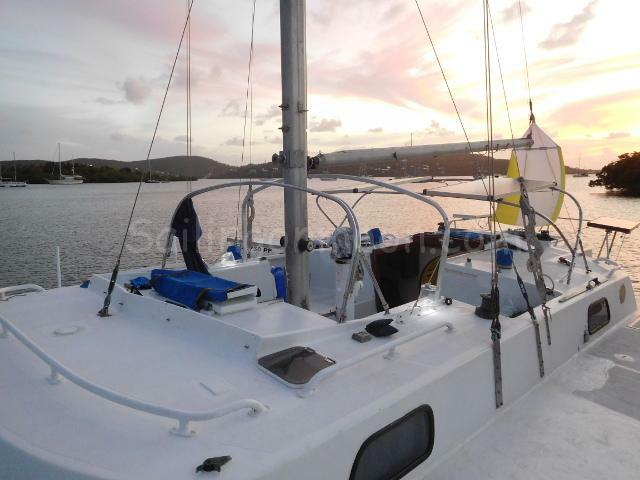 Looks like we’ve decided to stay in Culebra for this season. We’re getting lots of things done on Moon that we’ve not necessary neglected in the past, but put off because we were always on the move. 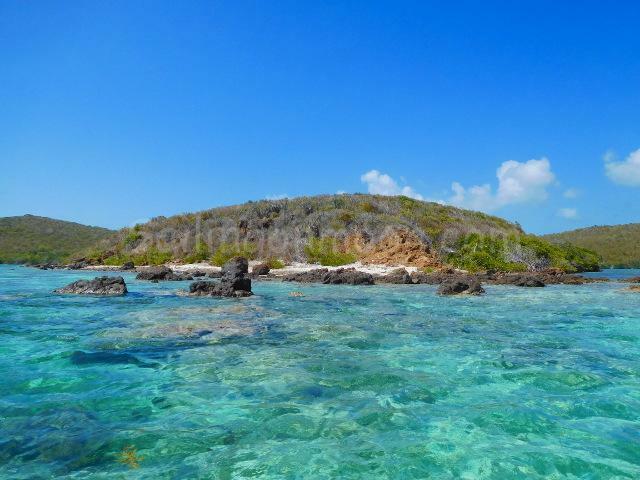 Plans now are to stay here and explore Culebra and its nearby smaller islands. So it’s kind of a sad and good thing. 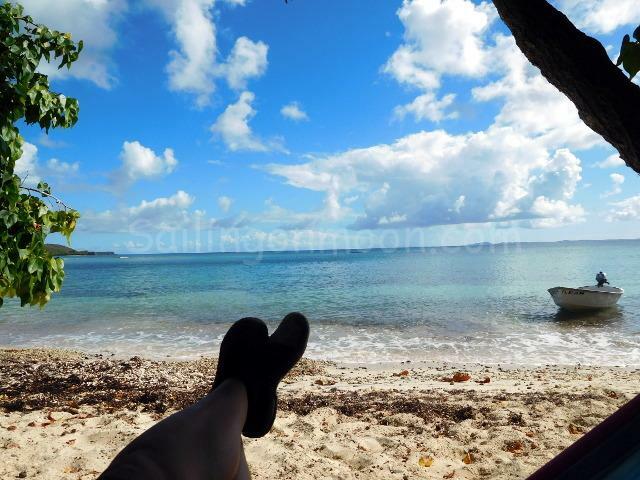 We won’t get to explore any new and exotic lands this round, but we will get to sort of plant our feet for a while and get to really know Culebra better. 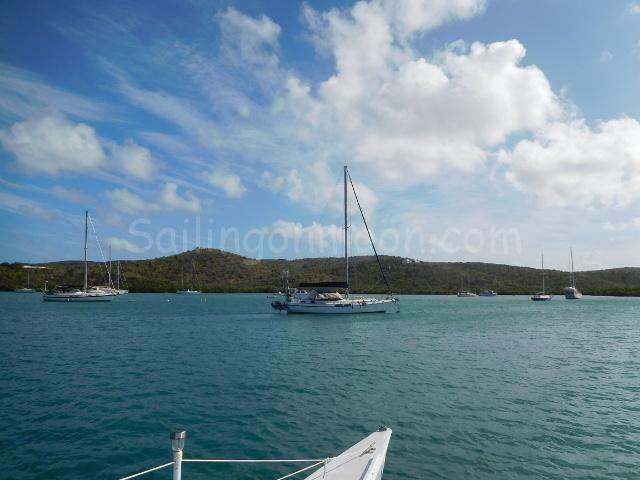 With that being said we decided to sail to the nearby island of Culebrita for the day. 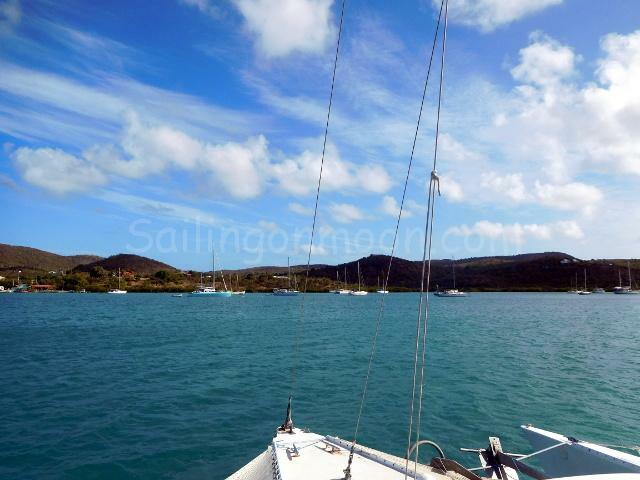 As we approach Culebrita. Lighthouse is perched on the highest point to the right hand side. 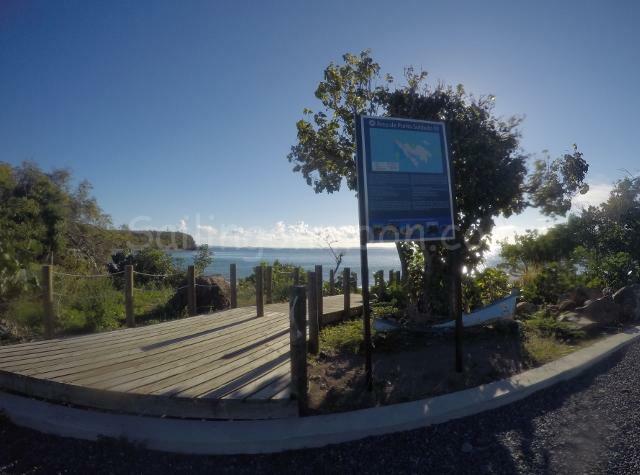 Path on Culebrita that leads from one side of the island to the other. Our first view of the beach as come off of the path. 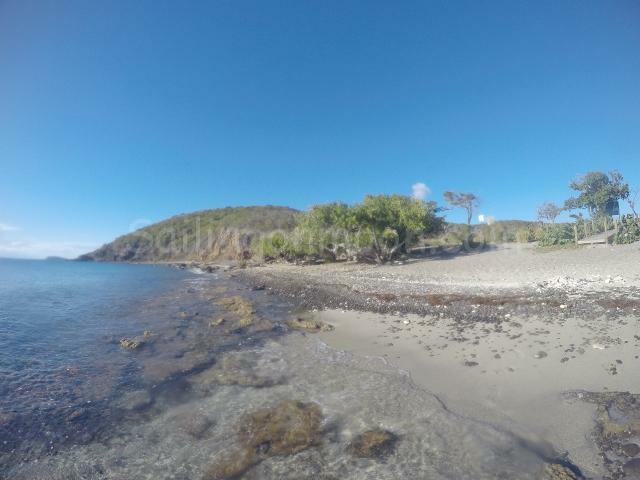 This small island is just east of Culebra. 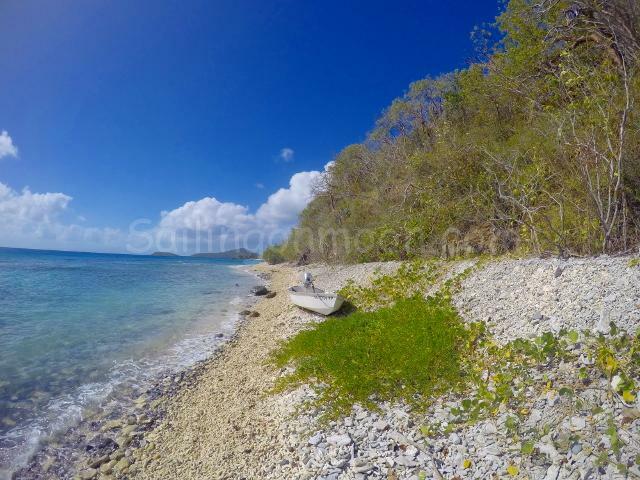 Measuring about one mile in length, the uninhabited island of Culebrita is part of the Culebra National Wildlife Refuge. 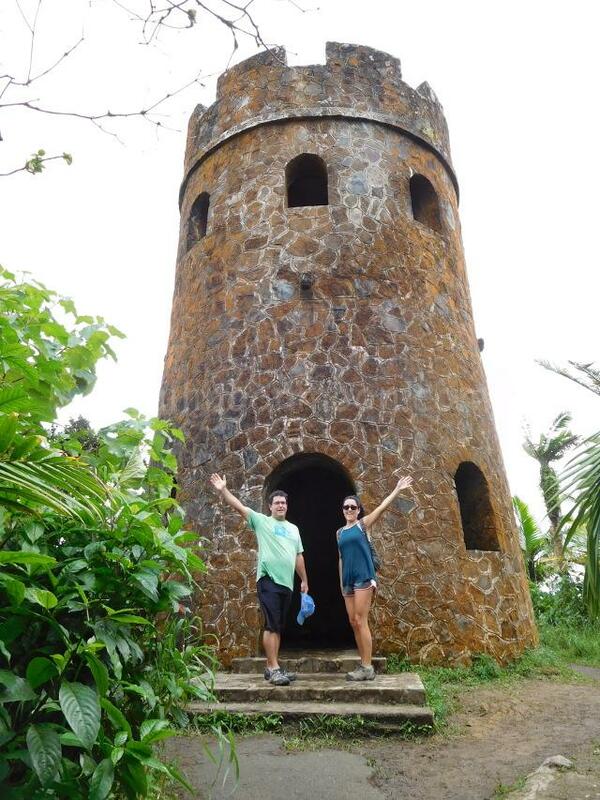 The Island is also home to a lighthouse called Faro Culebrita. 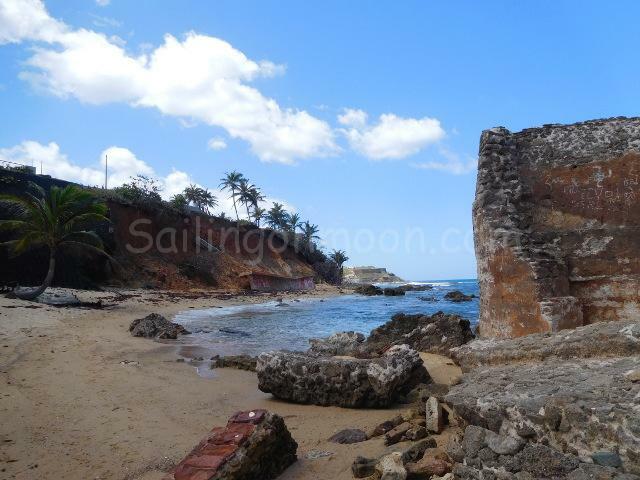 Built in 1886, it was one of the oldest operating lighthouses in the Caribbean when it was shut down by the US Navy in 1975. Currently it is in ruins, but it looks like it is in the process of getting some much needed repairs. We saw a work crew there clearing out what seemed to be a rather large roadway up to the lighthouse. I remember it being a beautiful brick structure the last time we were here. Brian, Rachel and I climbed up a rickety makeshift ladder to access the top. The views were amazing! 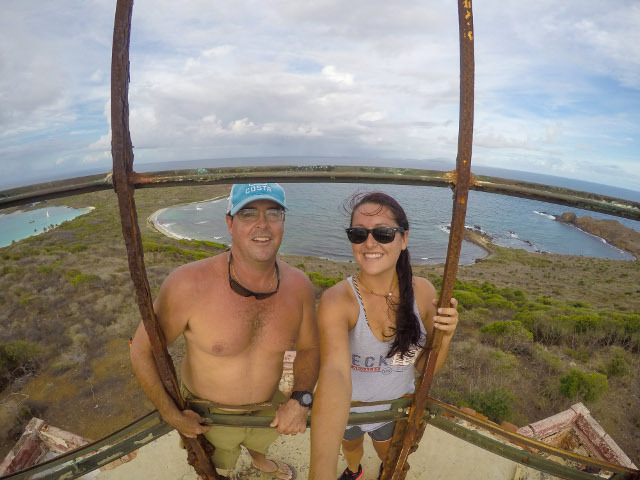 On top of what is boasted as the oldest lighthouse in the Caribbean…on Culebrita. Culebrita Lighthouse was the oldest operating lighthouse in the Caribbean until 1975 when the US Navy and Coast Guard closed it replacing it with a solar powered light beacon. 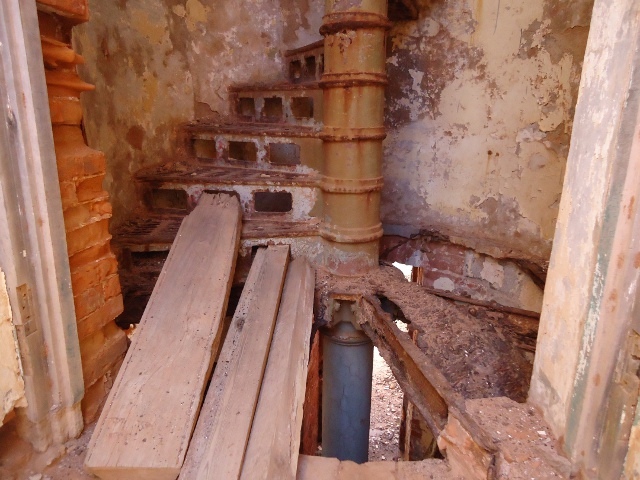 Yup, these are the stairs that you use to go up into the lighthouse! 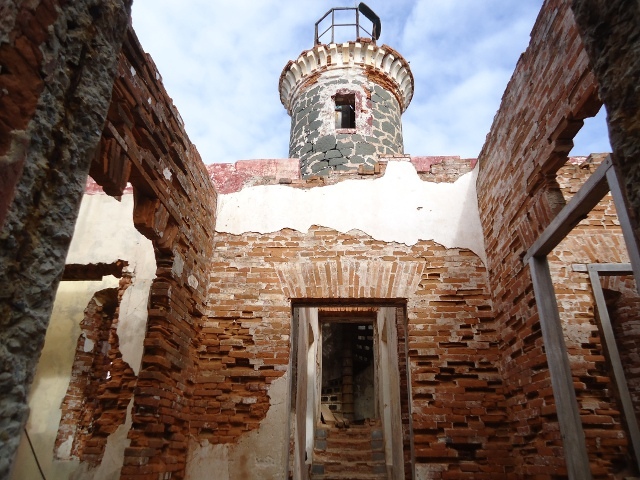 The Culebrita Lighthouse was built in 1886. In 1975, the Navy and Coast Guard closed the facility. Since then, the lighthouse has sustained heavy damage from hurricanes and vandalism. Since we’ve been here before we decided to skip visiting the lighthouse this time and went to the beach on the north side of the island and visited the beautiful tide pools. 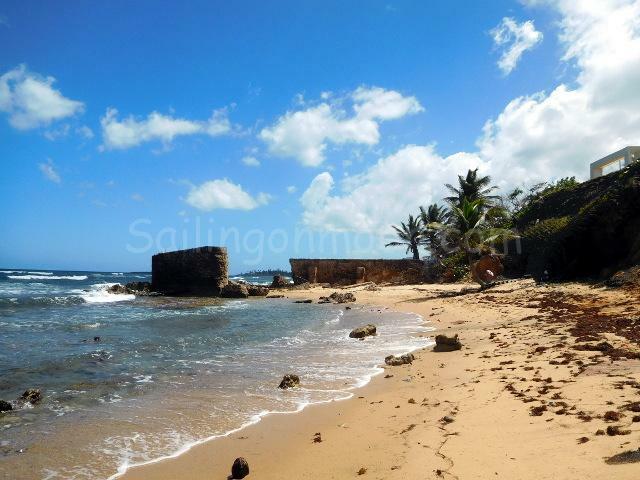 We anchored the boat on the south west side of the island and walked the path to the main beach. By anchoring where we did it cut out in total about three miles of travel, which in a boat is a lot! It was nice to walk anyways since we spend so much time on the boat. We enjoyed looking at the trees and hearing all of the little creatures run for shelter as they heard us coming down the path. When we finally reached the other side of the island the views were incredible! 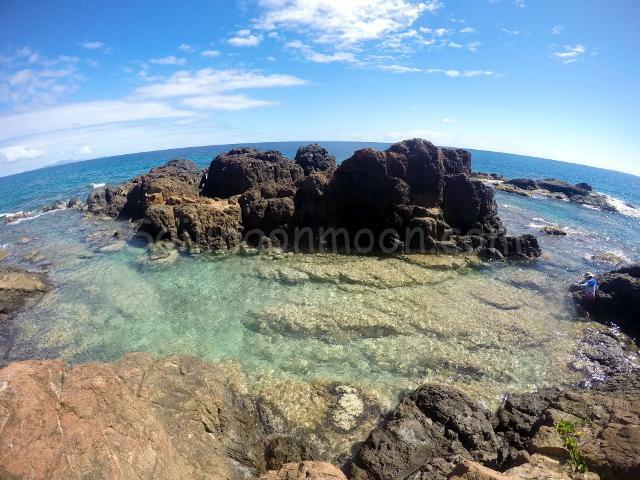 The water here is amazing, so blue and crystal clear! The sand is powdery white and soooo soft! This day was perfect, little to no waves making it a great day for swimming. 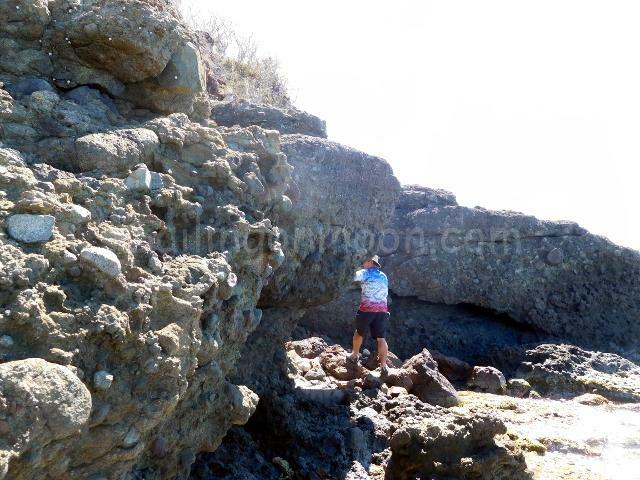 Scrambling through the big rocks to the tide pool. Almost to the tide pool. 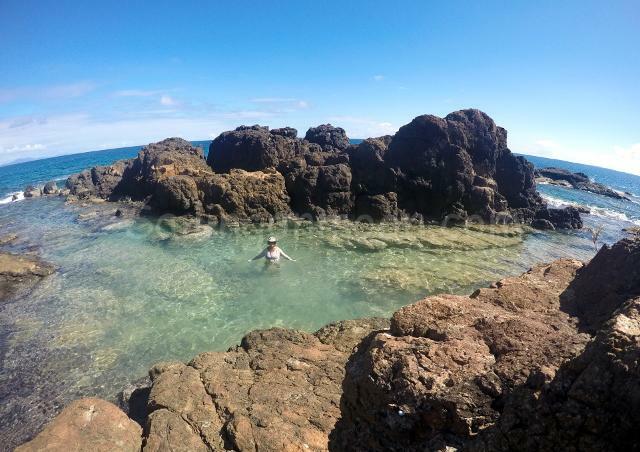 Last time we were at the tide pools the waves were much bigger making it lots of fun when they came crashing over the rocks. 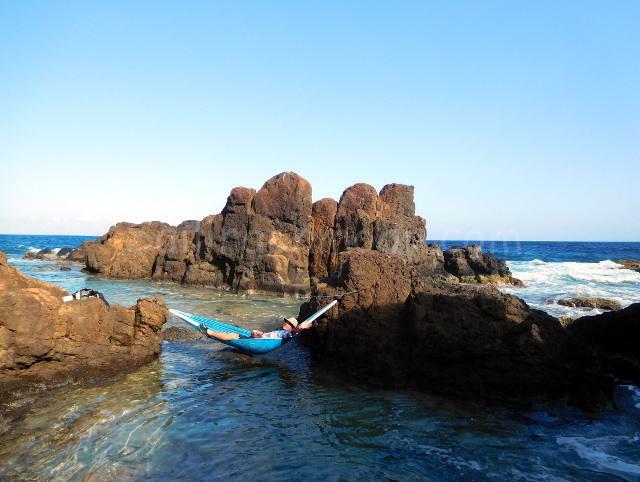 This time we had a couple of waves come over but it was mostly calm making it a nice spot to just chill out. When we walked back to the beach we were glad that we had made it to the island early. 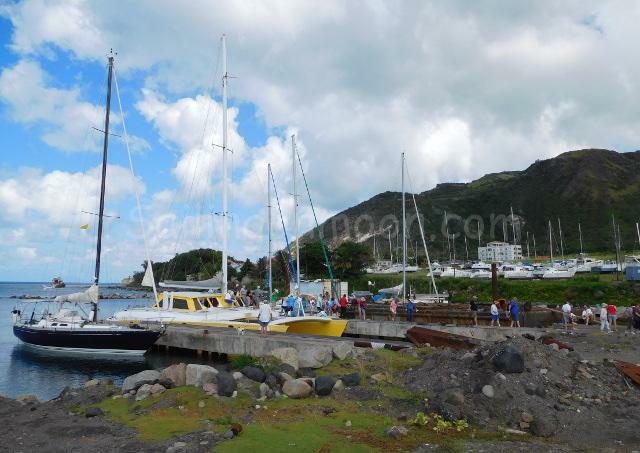 Now the harbor was full of boats, locals and tourists alike all enjoying this slice of heaven. We were surprised that we had the pools to ourselves the whole time. What a fun day! 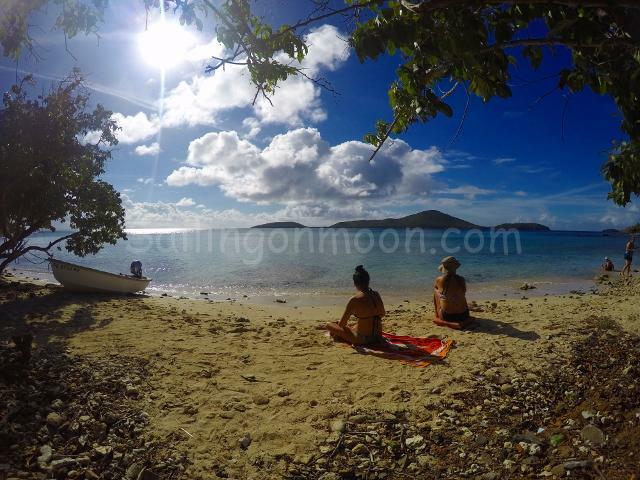 We paddled our kayaks back out to where Moon was anchored and set sail back to where we like to be snugged in behind Dakity Reef. 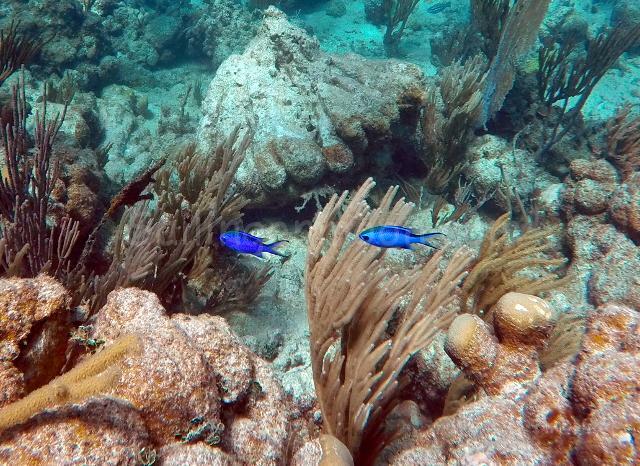 We like it here behind the reef. 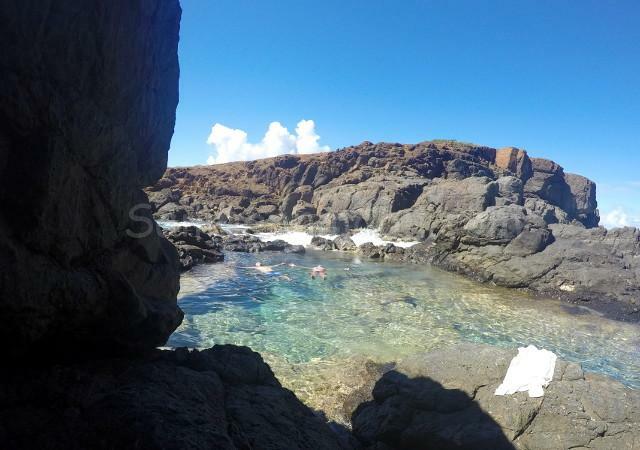 Nice protected spot, not too much going on and a beach close enough that we can dinghy to for swimming and snorkeling and of course we can just jump off of the boat and swim in the water. It is crystal clear here too. Oh by the way, the lunar eclipse, super moon that I was so excited to see was awesome! I did not get any photos though unless you want to see some blurred bright thing in the dark sky. Hey, at least I tried 🙂 . We sat on the deck and watched it disappear, and as it got dark the stars came out, and it was so beautiful! Hope that you got to enjoy it too. I have a bit of photo envy, I saw the pictures that some of you posted on FB! Full moon rising on the night of the lunar eclipse. OK, enough for now. Hope all of you are staying warm. News shows it a being a bit nippy out there! 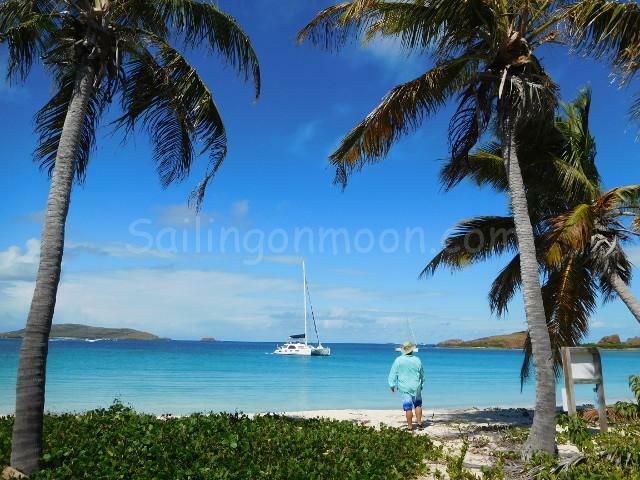 If it makes you feel any better we’ve had a few cold nights here too…low 70’s can feel pretty cold on a boat especially when you’ve been snorkeling all day! Lol! 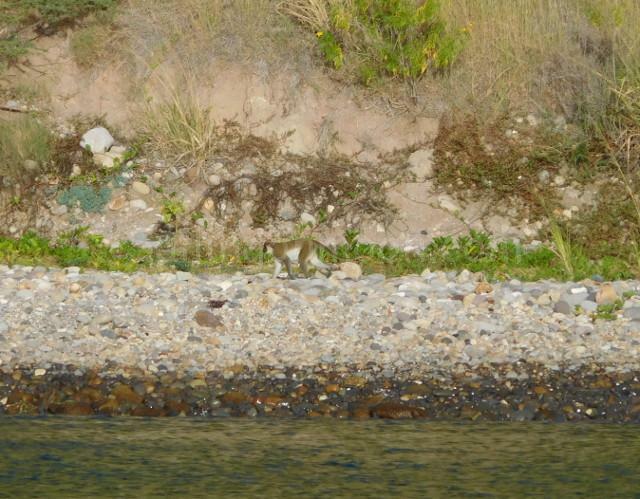 Last we left off we planned to go snorkeling at Melones Beach and were hoping to run in to the resident nurse shark. 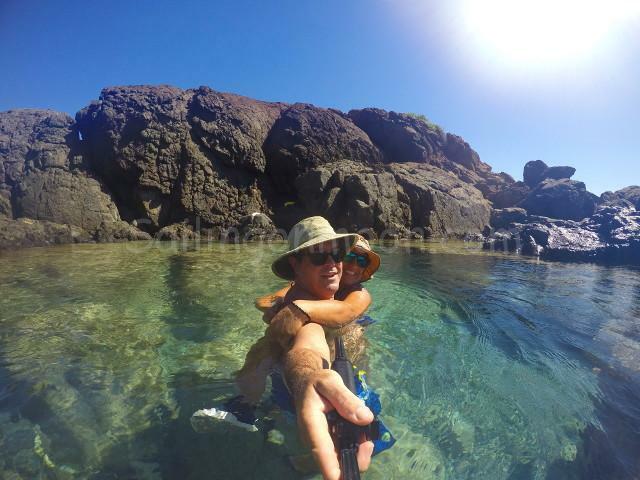 However, when we motored over to the other side of the island to pick up a mooring ball it was so calm that we decided to go just a bit further to the north to one of my favorite snorkel spots on Culebra, Tamarindo Beach. 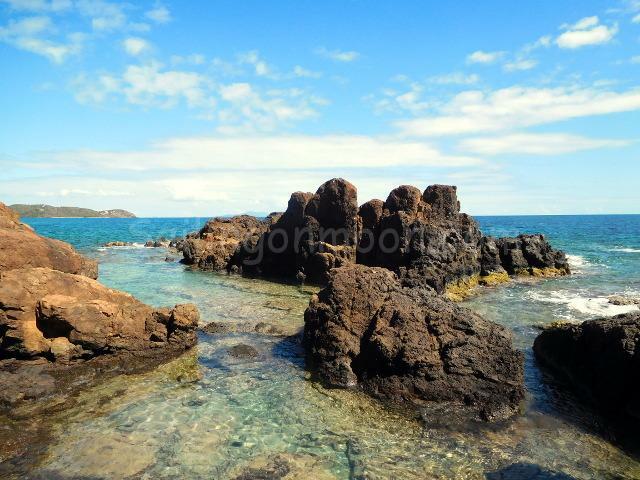 Tamarindo is a shallow snorkel spot where the reef runs right along the shoreline. Easy to get to either from the beach or by boat. 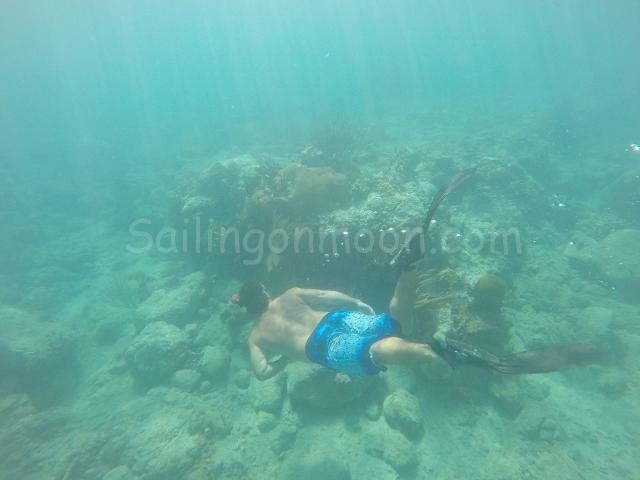 We picked up a mooring ball and jumped into the crystal clear water. 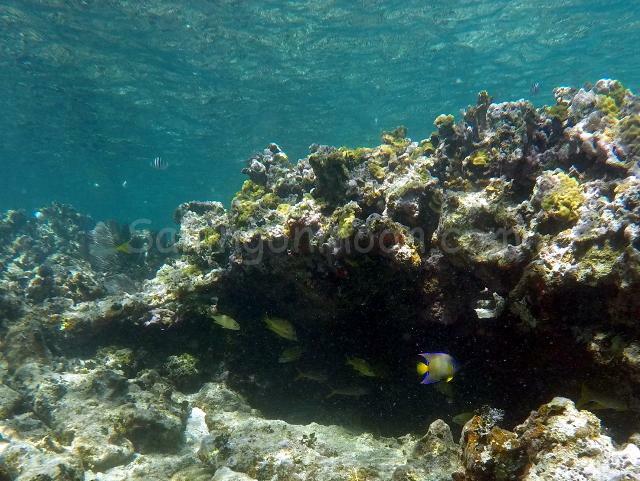 The fish were smaller than the other reefs that we’ve been to lately but there were so many more to see and enjoy! 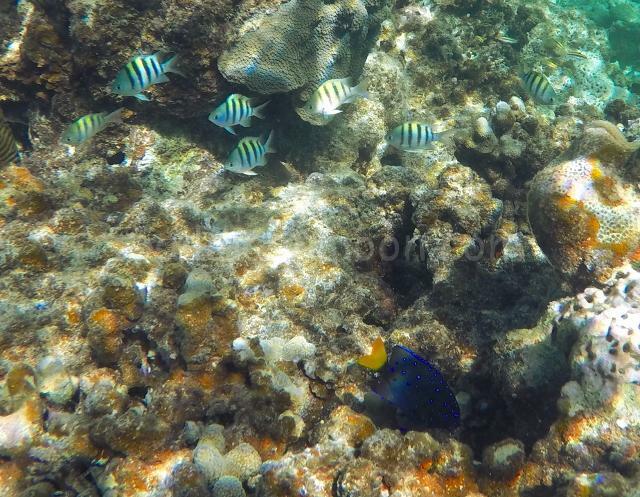 The damage to the corals from last years hurricanes was still obvious but the fish did not seem to notice as they happily swam in their paradise. 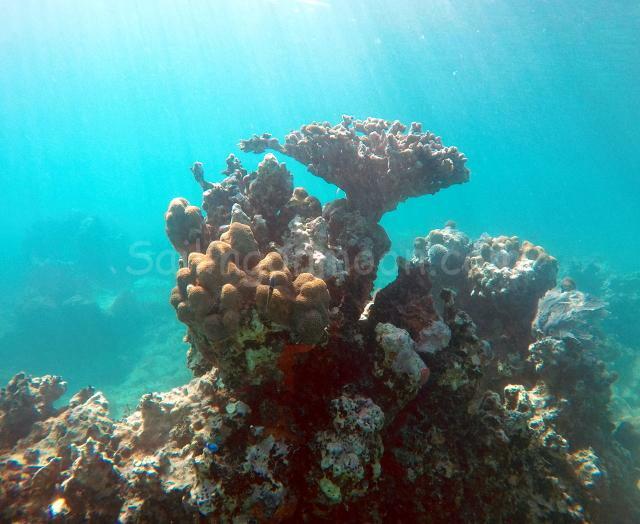 The sun was in an out of the clouds as we snorkeled along taking it all in. 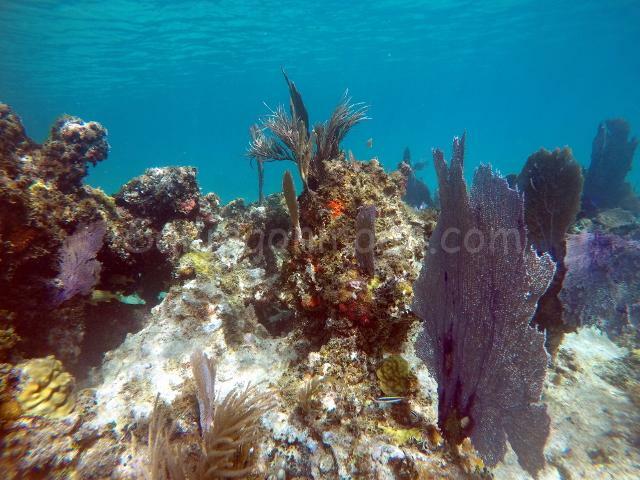 The reef here consists mostly of soft coral and many colorful sea fans but the further that you snorkel along the shoreline heading southward you start to see more coral heads full of life that seemed to go on forever! Did I say that I love this spot? 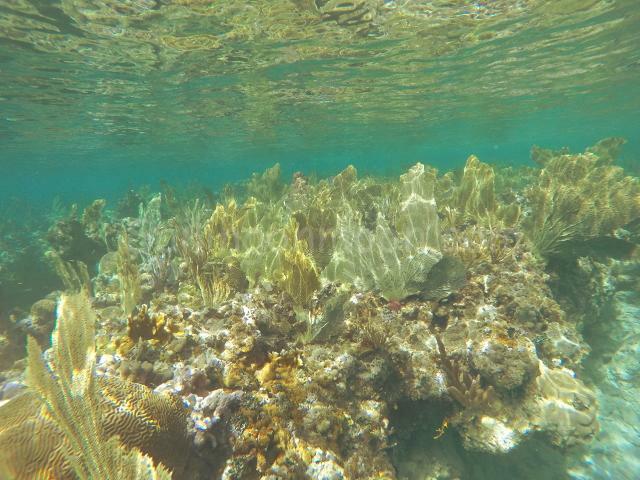 I snorkeled until I could not stand it anymore. 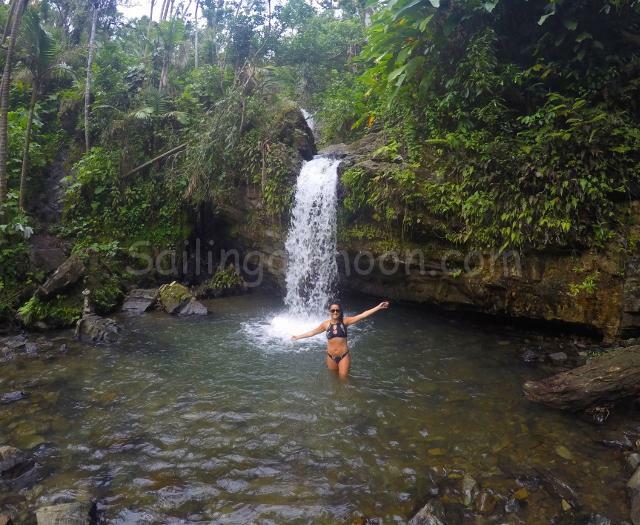 Even though we are on an island in the tropics the water is still chilly this time of year. My teeth were chattering and I was frozen by the time I finally decided to get out. Yea, I know your feeling pity for us… We did not see any sea turtles this time although this is a popular spot to swim with them. It was still a great day! 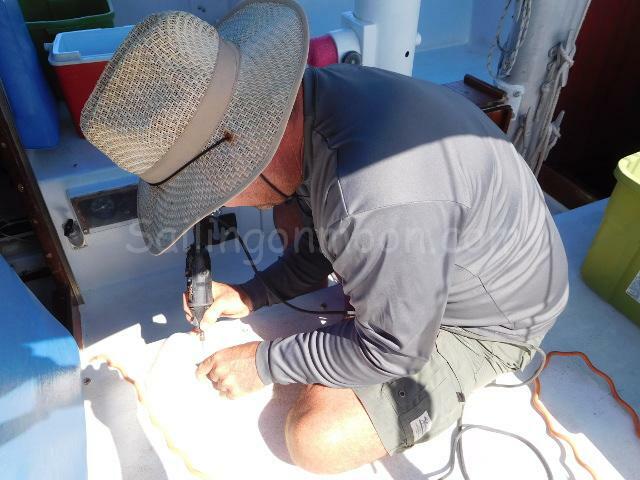 Now just to prove that it is not all fun and games here I have to include a few pictures of Brian working on projects around the boat. Typically we work on a project or two and then take the afternoon off to have some fun. 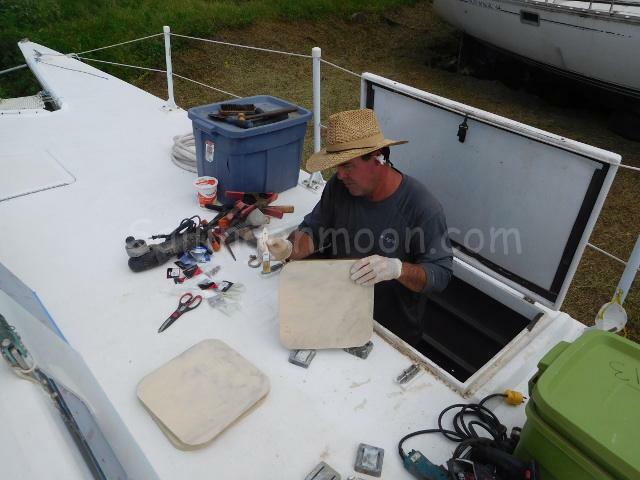 Brian has become a master at sanding and fiberglassing in what seems like an instant. Hope all is good in your parts of the world and that everyone is managing to stay warm…we hear that it is a bit cold out there! We are really excited the Super Moon Lunar eclipse is tomorrow night. 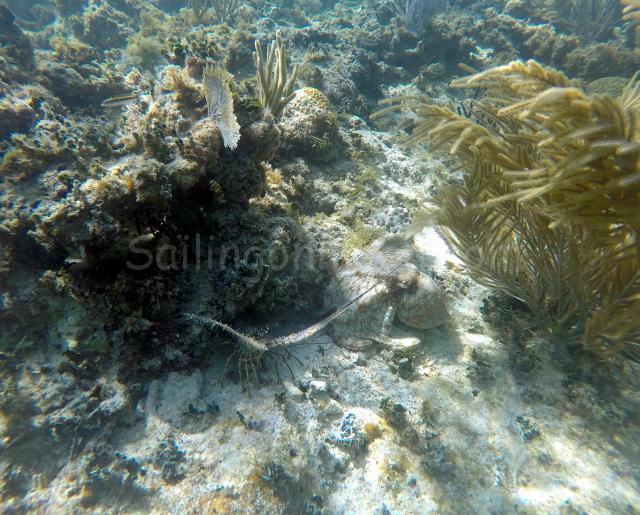 We’ve anchored out at Dakity Reef a particularly dark spot and hope that we get a good viewing. 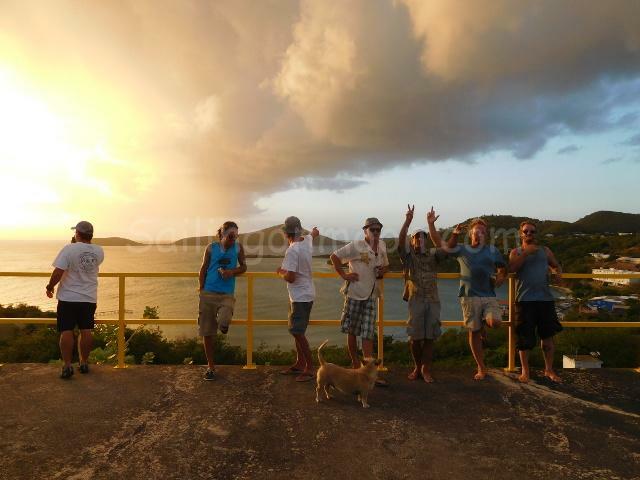 We were in Culebra a few years ago, I think 2013 for a full moon lunar eclipse and it was awesome! Take care for now and stay tuned for more fun in the sun from the Nelsons. In between our chores we still find time to have some fun. 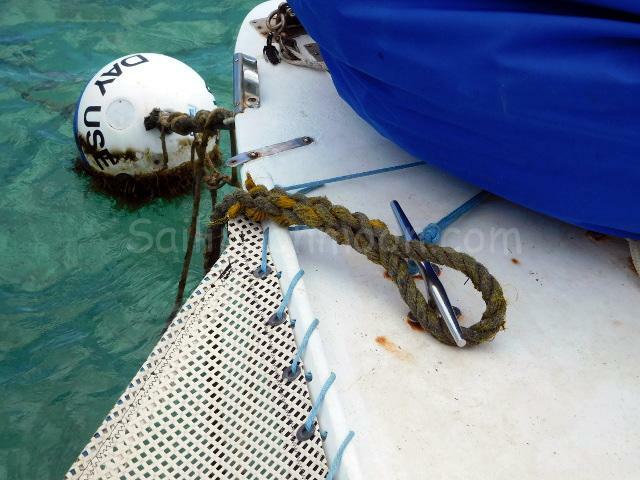 When we’ve had enough of the rat race of being anchored in Culebra’s main anchorage (Ensenada Honda) we then we head out and grab a mooring ball behind Dakity Reef that runs along the entrance to the harbor. 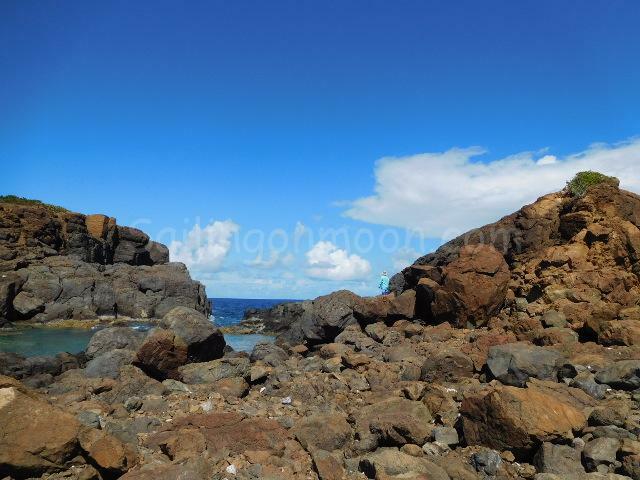 Dakity is a very protected and mostly quiet spot (unless it is the weekends when locals come over from mainland PR to have some fun) and without any ambient light it is a great place to star gaze! 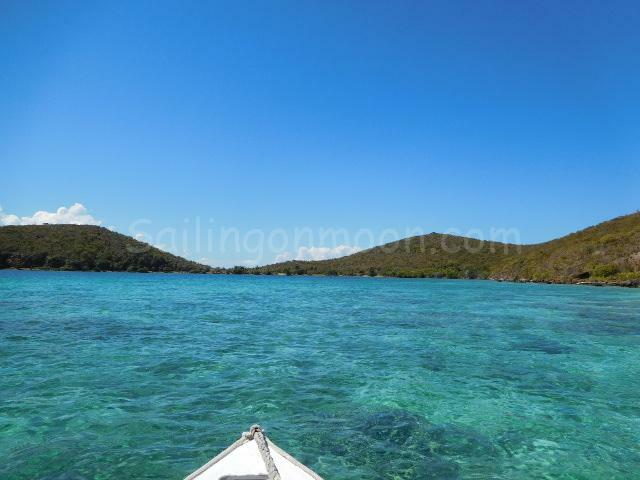 It’s also a pretty close dinghy ride to Punta Soldado Beach. Boardwalk to Punta Soldado Beach. Down the boardwalk and looking to the left hand side. Down the boardwalk and looking to your right hand side. 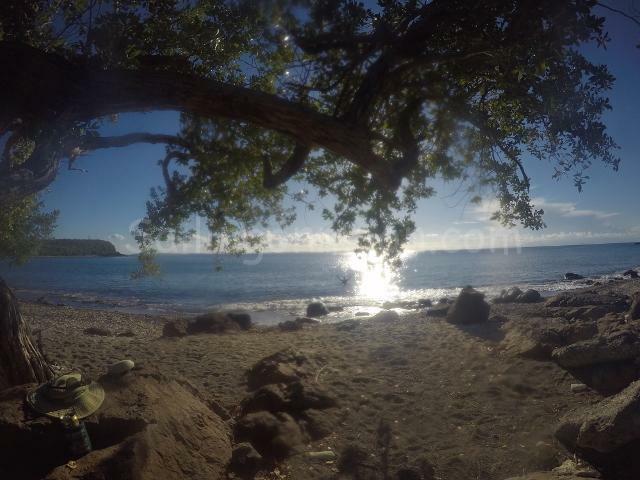 Shady spot with a beer watching a pretty girl snorkel, who could ask for anything more? 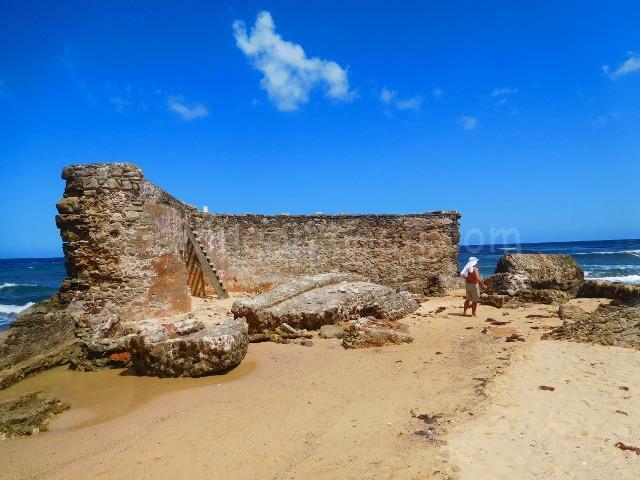 Punta Soldado Beach is a bit out of the way for most. It is on a peninsula on the island’s southwestern most corner and because it’s out of the way it is usually not crowded. We had the beach to ourselves most of the day. View of the water from our shade spot. Brian is there just to the left of the sun reflecting on the water. Brian captures me wondering on the beach looking for treasures. 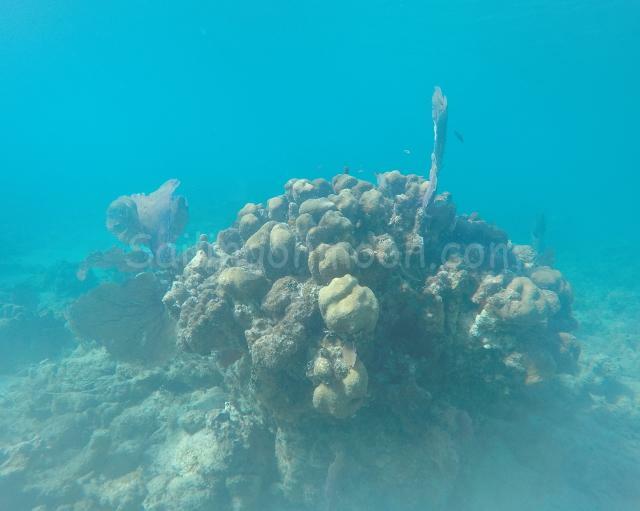 The water was sooo clear! 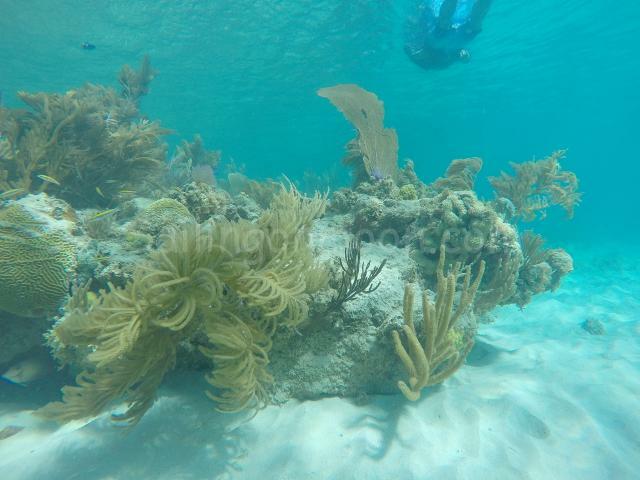 The snorkeling here is OK, I bet was great before last years hurricanes. 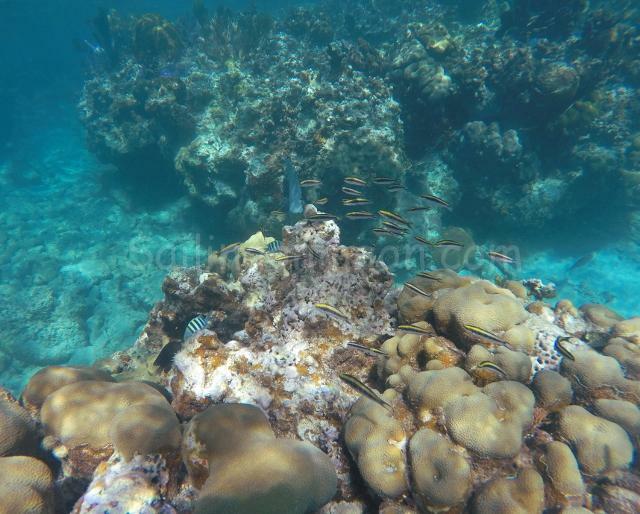 Hurricanes Irma and Maria, both Category 4 storms, caused extensive damage to the reefs around Puerto Rico when they made landfall in September 2018 and its obvious that the corals and reefs are still recovering. 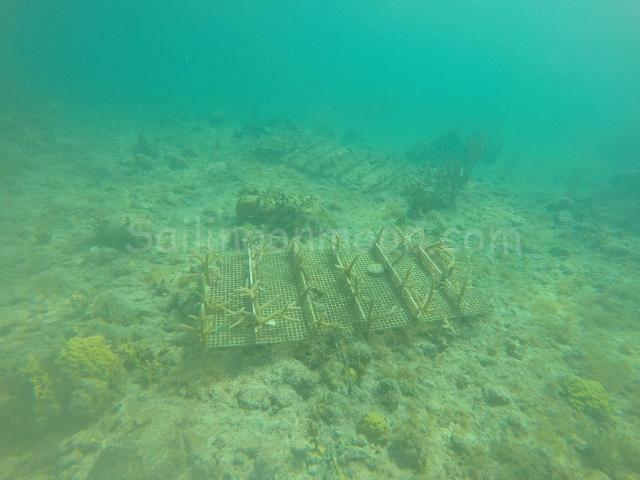 One of the coral nurseries where researchers grow young corals to restore damaged reef areas. 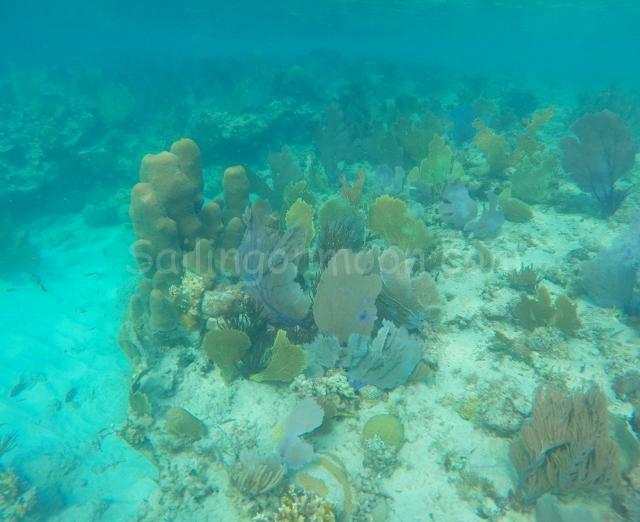 Another coral nursery where researchers are growing young corals to restore damaged reef areas. 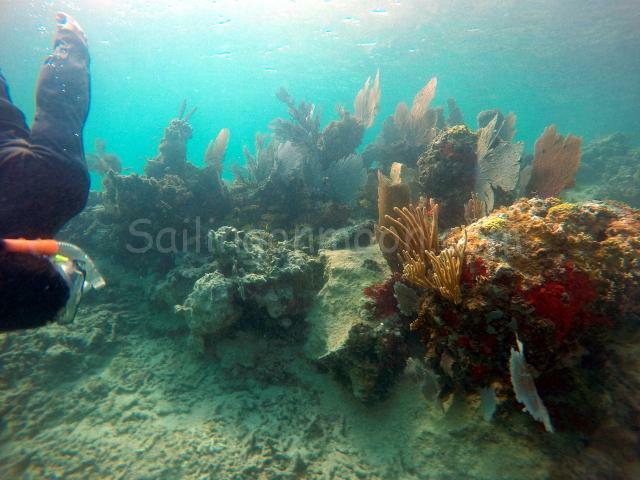 The storms snapped hundreds of thousands of corals from reefs around the island. 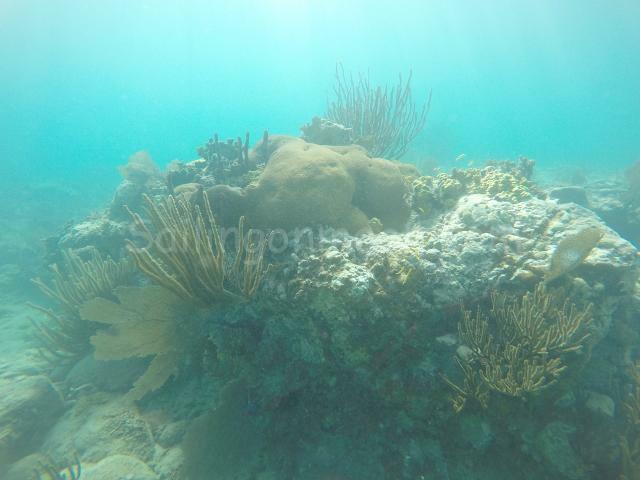 Assessment teams found structural damage to individual coral and the reefs as well as heavy sediment accumulation, which can prevent corals from getting enough sunlight. 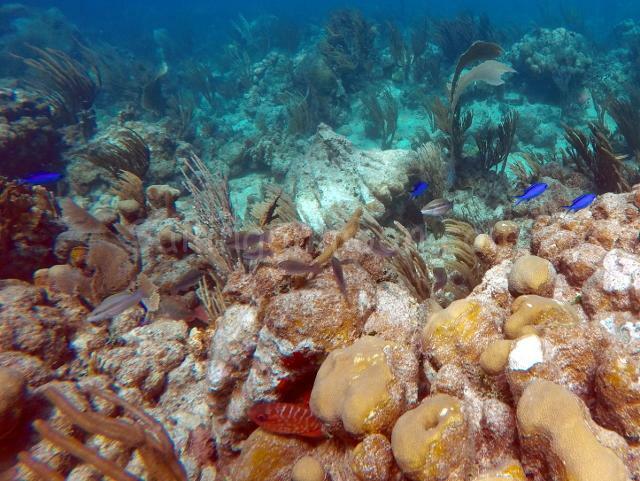 One quarter of all ocean species such as red snapper, lobster and octopus depend on coral reefs for food and shelter. 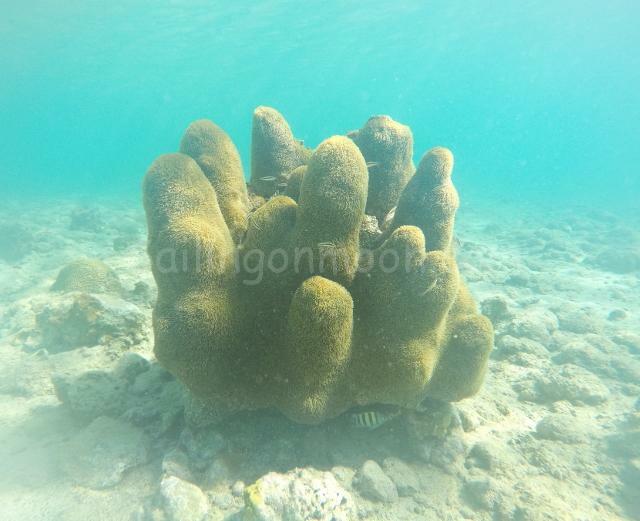 Coral also contains natural chemical compounds, and also serve as treatment for different diseases including cancer. 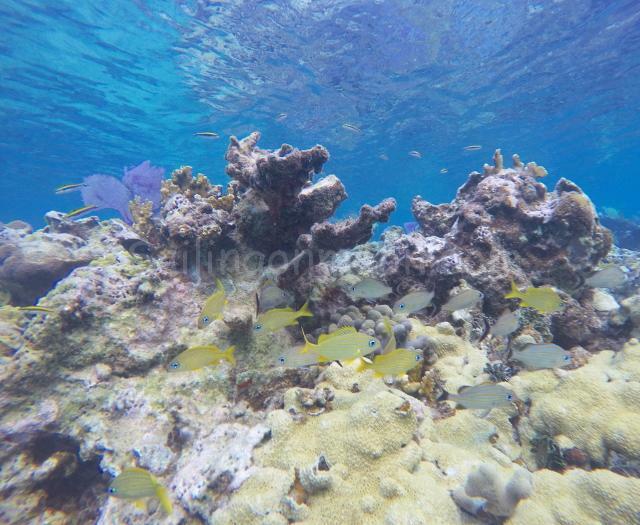 And perhaps most relevant to us humans, coral reefs can minimize wave energy up to 97 percent, reducing destruction from floodwaters to mainland. 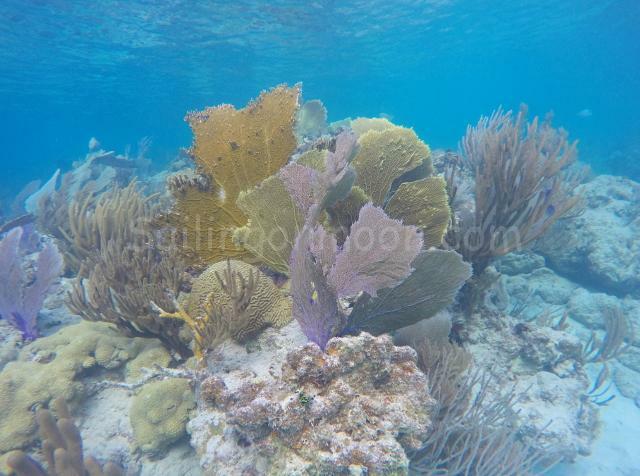 Obviously corals and reefs are very important to us! 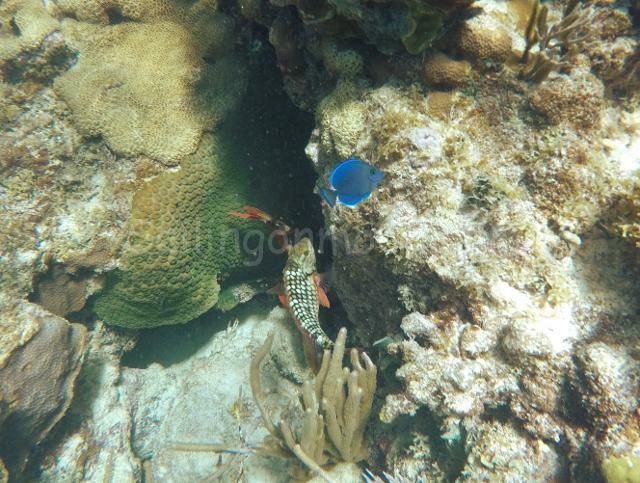 Beautiful life amongst the coral rubble. We enjoyed our beach day now back to some chores for us. 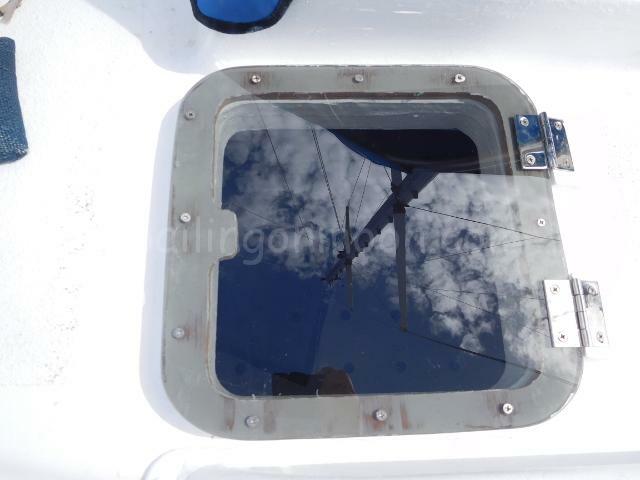 Brian has a repair that he is working on under the window in the nav station that had some rot because of a small leak and then back to the never ending list of other things to do. 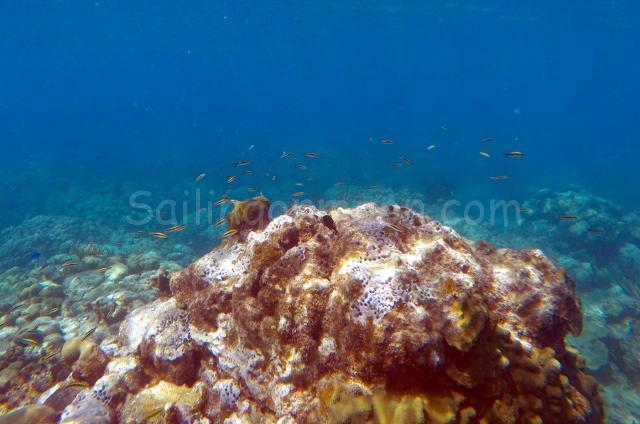 There is a small beach just across the pass from us and we hope to anchor their and do some snorkeling soon. 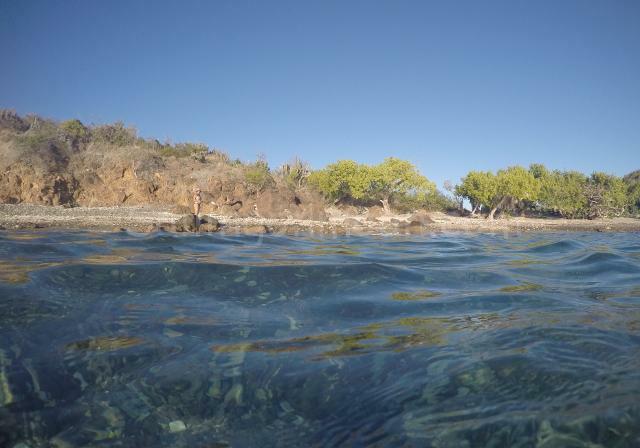 We also plan on heading back to Melones Beach on the west coast of Culebra in a few days too to do some snorkeling. 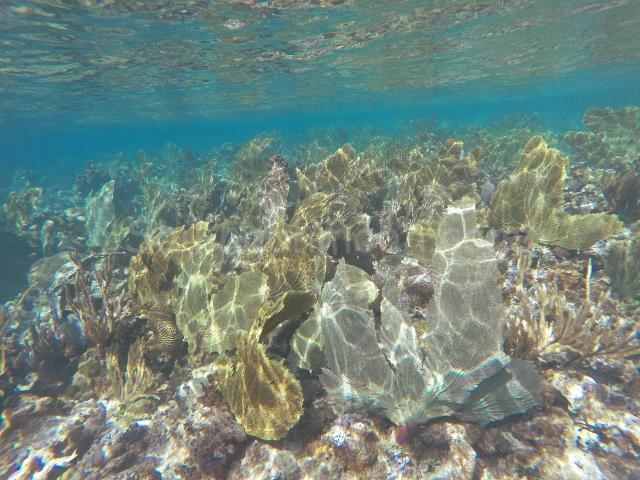 Maybe we will get lucky and see the resident shark that hangs out there….no worries though it’s just a nurse shark so we should survive. We’ll take more pics to share as we go. Take care for now. We hope that everyone had a great Christmas and New Year. Ours was fabulous! Rachel came to visit us so need we say more? She spent almost two weeks here, it was the best Christmas present ever! 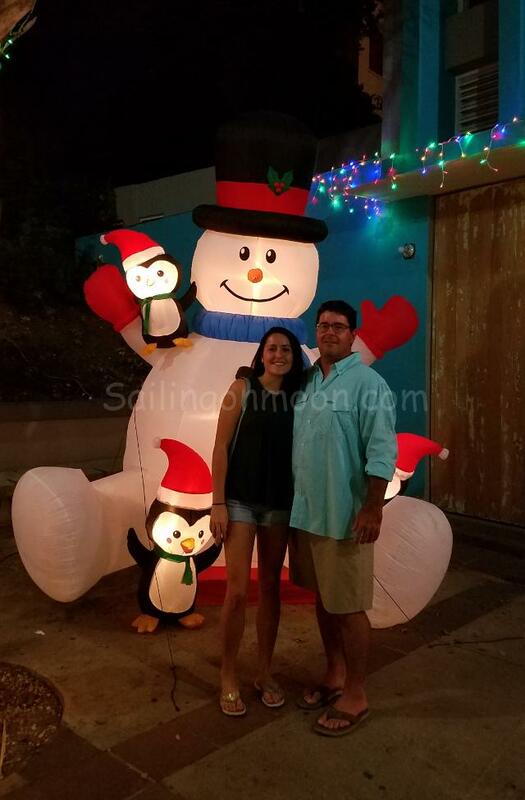 It’s started to become a tradition with her visiting us for the holidays and so far she’s spent time with us in the Bahamas, Dominican Republic, St. Croix, St. Thomas, St.Kitts and Nevis, Antigua and now Culebra and San Juan Puerto Rico. We always have an amazing time and this year was no exception. We picked her up at the airport Puerto Rican style. The airport was filled with families singing and banging on drums, maracas and tambourines welcoming their loved ones home. It was a loud and fun start. 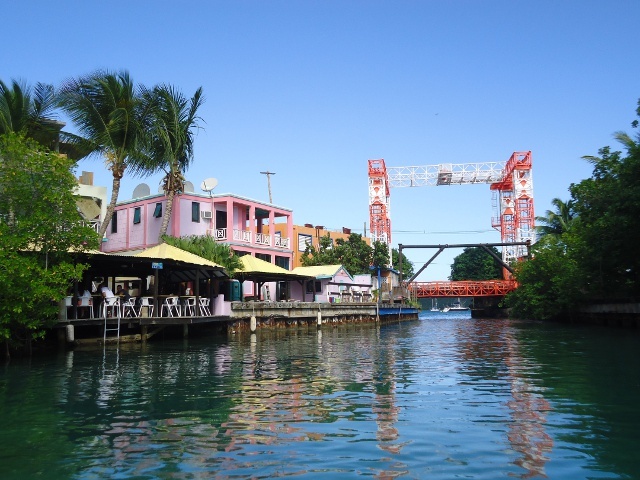 View of the non lift bridge from the canal in Culebra Island. 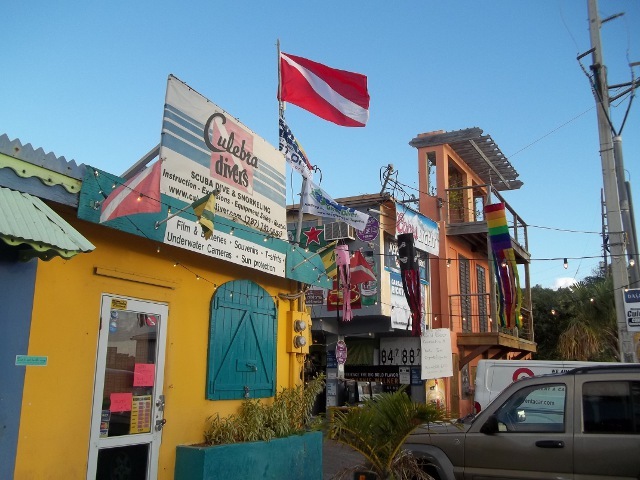 Culebra dive shop near ferry dock. We spent the first night in Condado Beach, San Juan and then off to the beautiful island of Culebra where we are calling home for now. (We even got a PO Box so it must be official!) 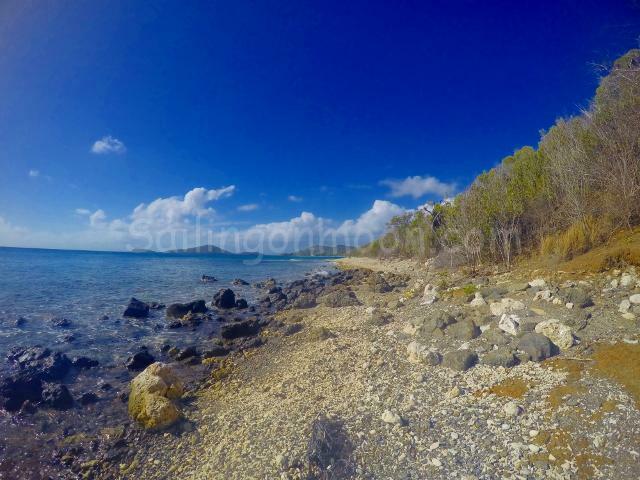 Culebra is located 17 miles east of Puerto Rico and 12 miles west to Saint Thomas, its dimensions are about 7 miles long and 3.5 miles wide. 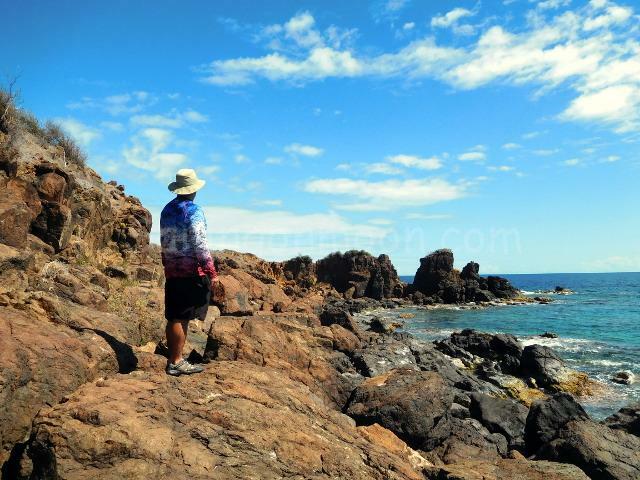 This small island is known as “Isla Chiquita” (small island) and “Ultima Virgen” (last virgin). 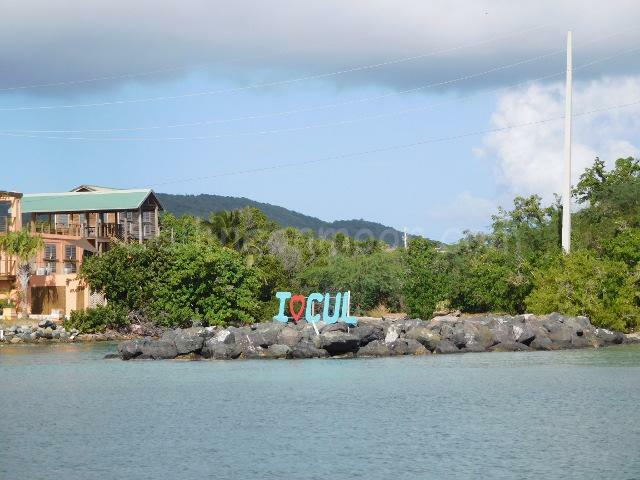 Culebra is probably more famous for what it doesn’t have than for what it actually possesses. There are no major hotel chains or stores, no golf courses, no casinos, no fast-food chains and no rush-hour traffic (unless you count the ferry dock). 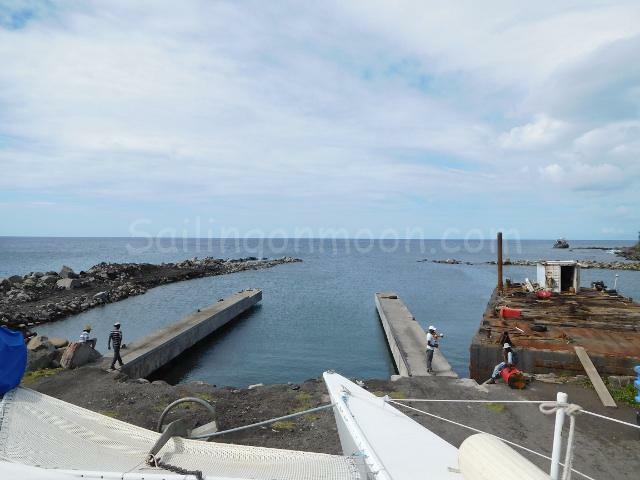 The ferry dock can be a bit busy at times as it is the only way on or off the island unless you arrive by small plane or a private yacht. 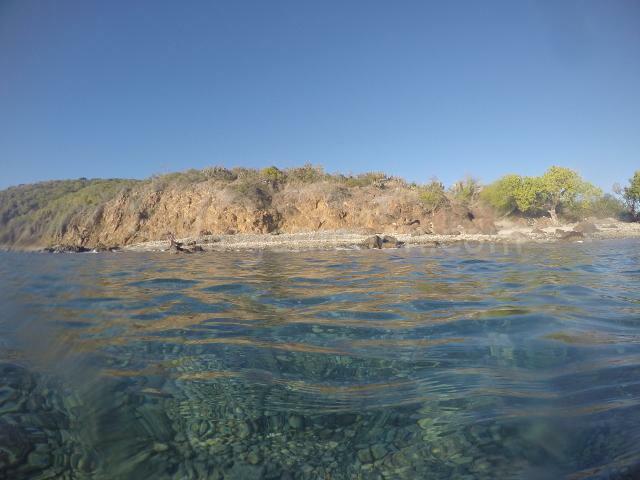 We spent some time one day in Culebra at Melones beach soaking up what sun we could between rain clouds and snorkeled a bit too…we even saw a turtle! Uninhabited Cayo Luis de Pena off in the distance. Looks like someone got too much sun! 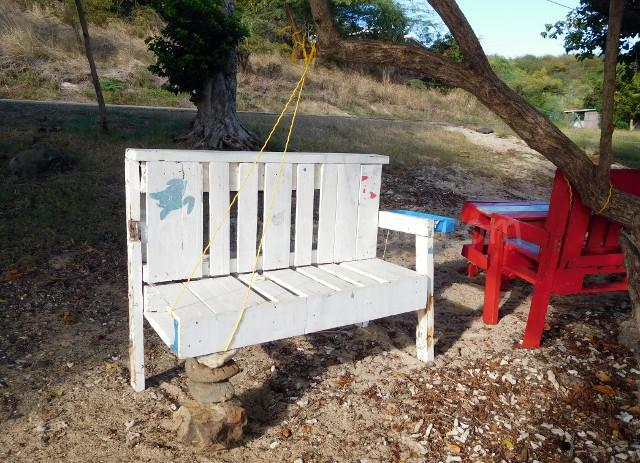 Culebra also has history mixed with a bit of quirk. 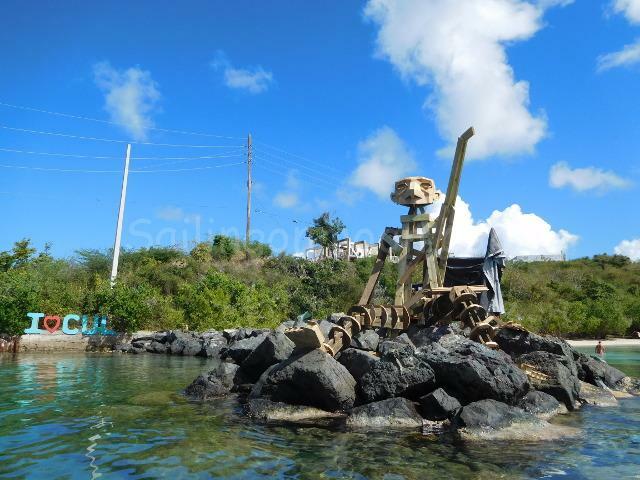 A rusty, painted tank resting on the shore is a beautified marker of Culebra’s time as a US Navy gunnery and bombing practice range. 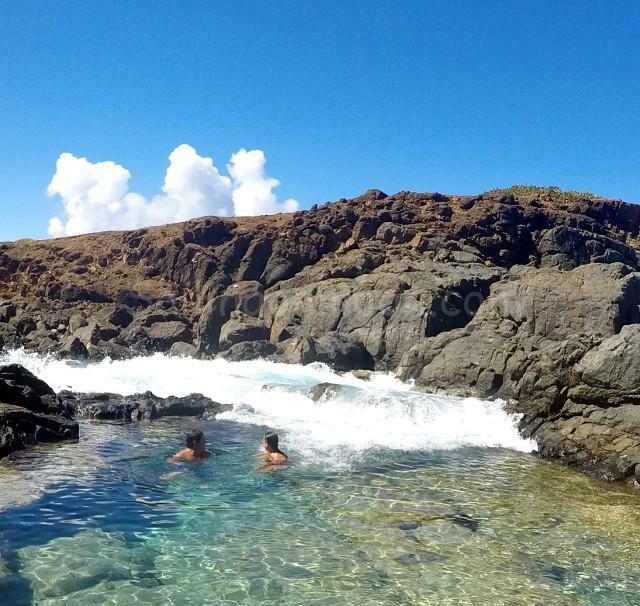 With the outbreak of WWII in 1939, Culebra and its small surrounding islands became the primary gunnery and bombing practice site for the U.S. Navy and continued to be used for these purposes until 1975. 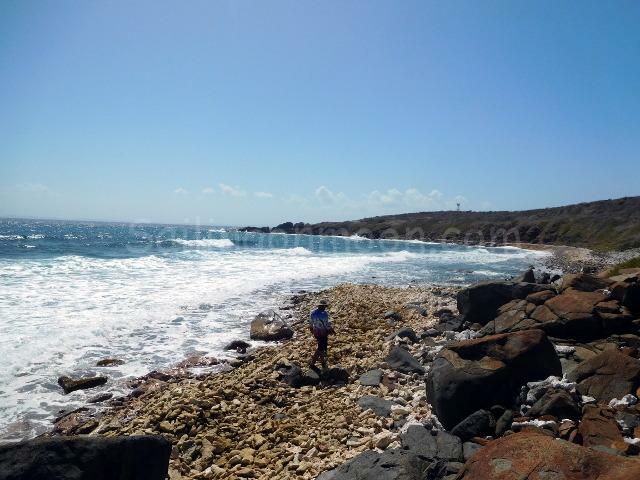 As of today the government is still in the process of removing unexploded ordinances from around the island and regularly sends out notices to its residents on its progress! 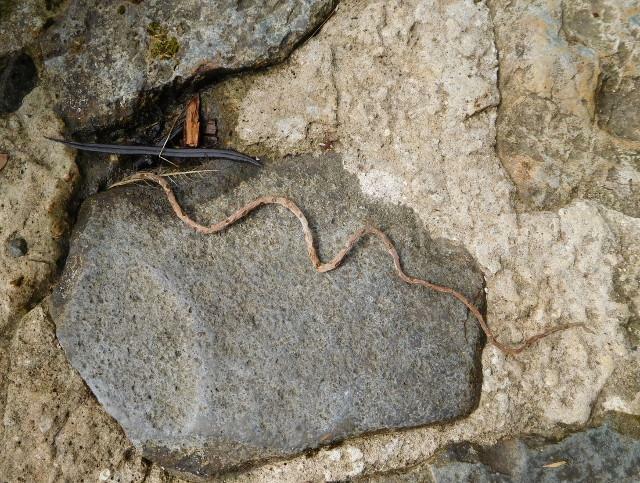 Um-mm…yup, watch where you step when you are hiking! Even though the winds were up and it rained quite a bit while Rachel was here in between the clouds we still got in our beach time. 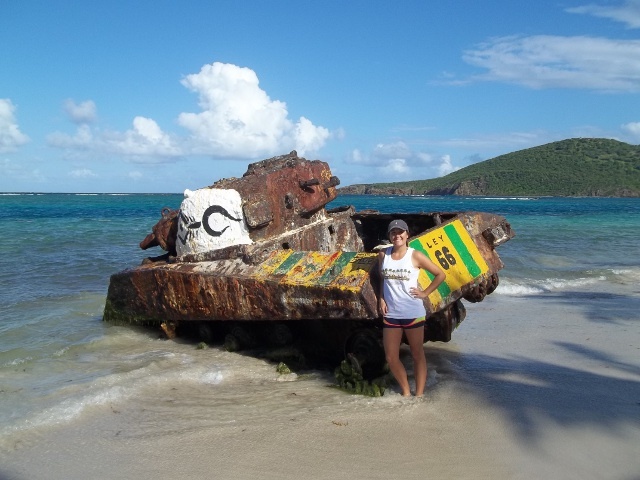 At Flamenco Beach (Culebras most famous), we enjoyed a Christmas potluck and Rachel got some pics with a long abandoned military tank. 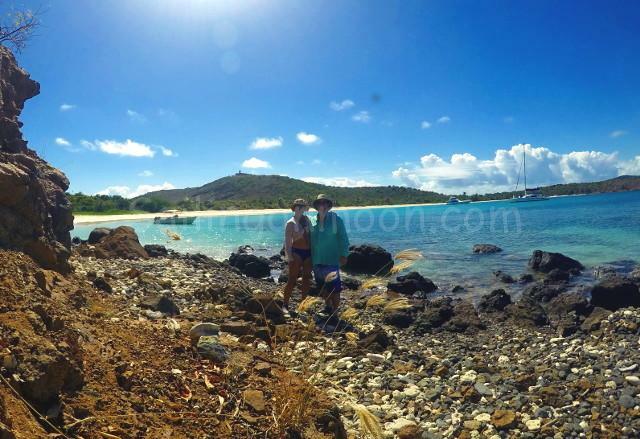 We also visited Salado and Melones beaches where we were able to soak up some sun and snorkel a bit. 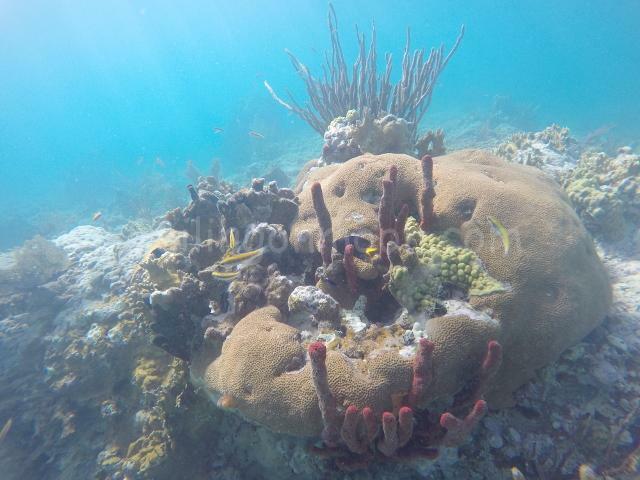 Even though the coral is still recovering from the damages of last years hurricanes there were lots of fish and we even got to spend some time with a turtle, just wish that I had my go pro with me! On Christmas night we joined the town for their annual Christmas parade where we saw some old friends and met some new. This was our second time here for the parade, Rachel included and it was a blast! Next for us it was off to the mainland. 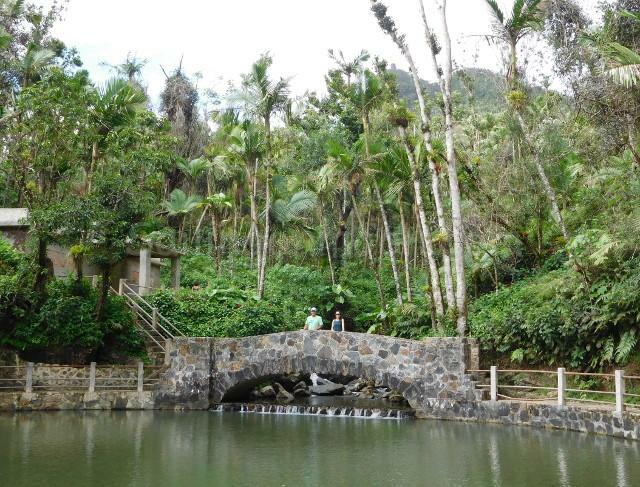 Here we visited the El Yunque National Forest. 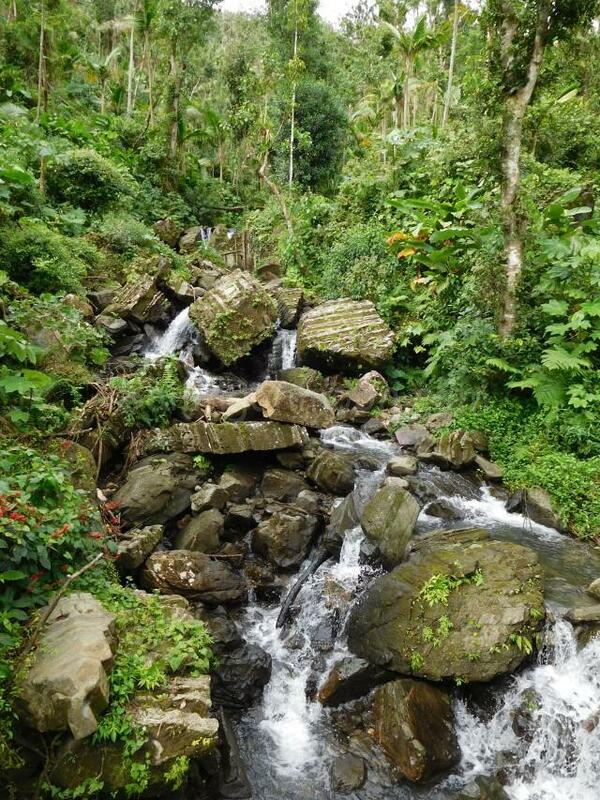 The El Yunque National Forest is the only tropical rain forest in the national forest system. Puerto Rico was hit hard by both hurricanes Irma and Maria. 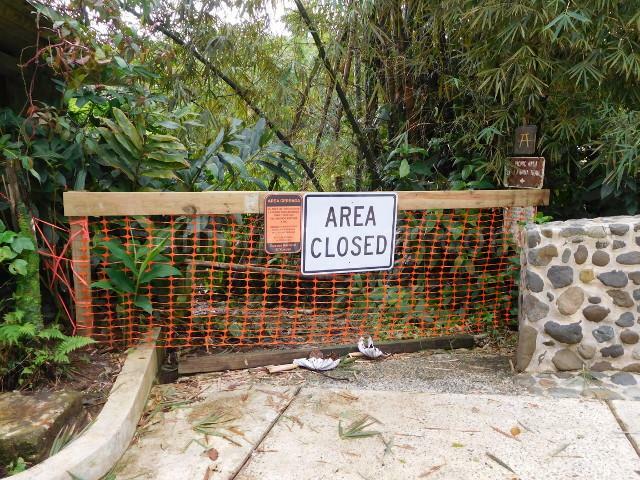 Seems that the rangers have been working hard here to restore paths and trails but unfortunately some were still closed to the public. 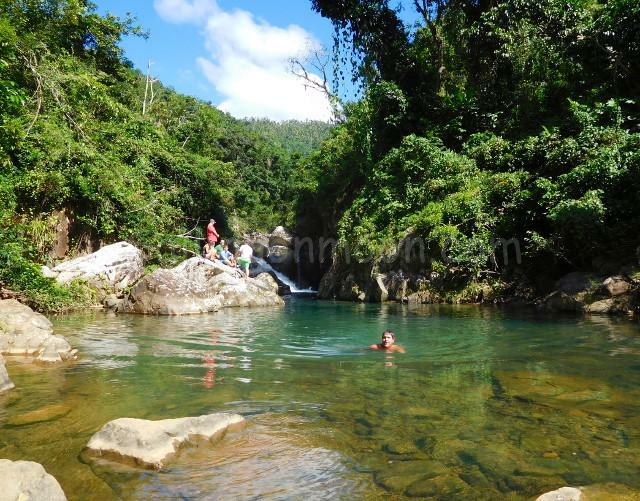 DLa Coca Falls. 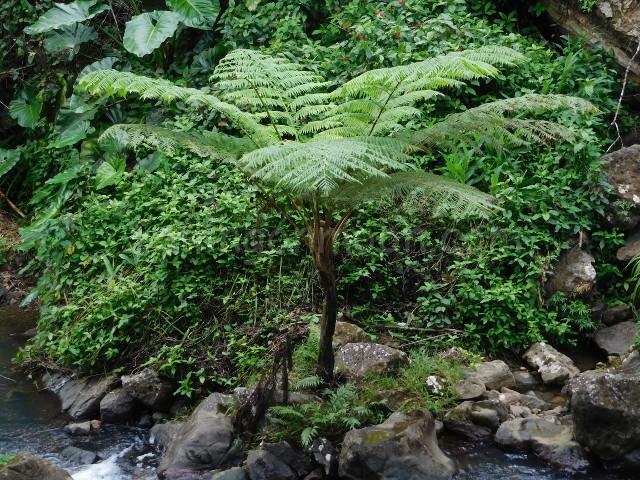 This 87 foot tall cascade stands out in staunch white compared to the dark stone behind it and the lush green forest around it. 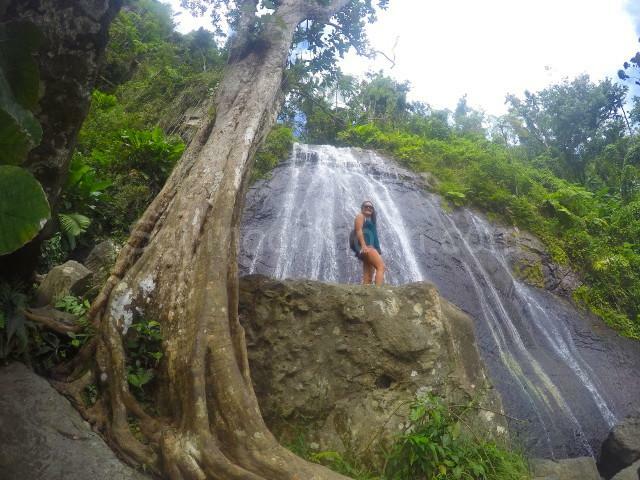 Rachel enjoying El Yunque, Juan Diego Falls. It was too cold to get in! 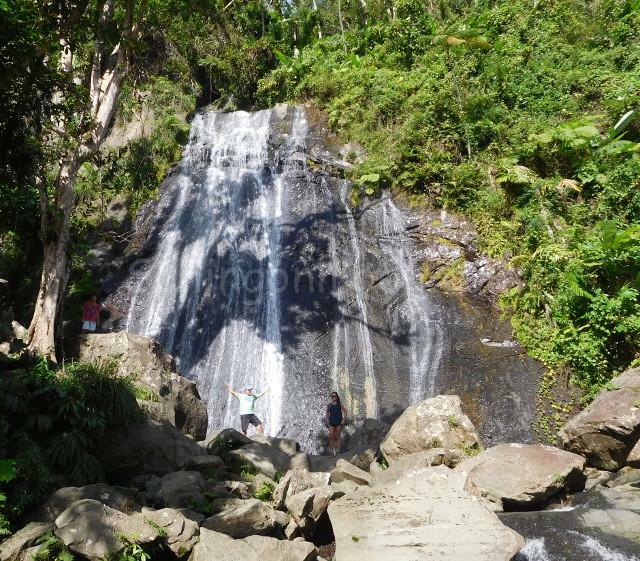 Juan Diego Falls, too cold for Brian…never! 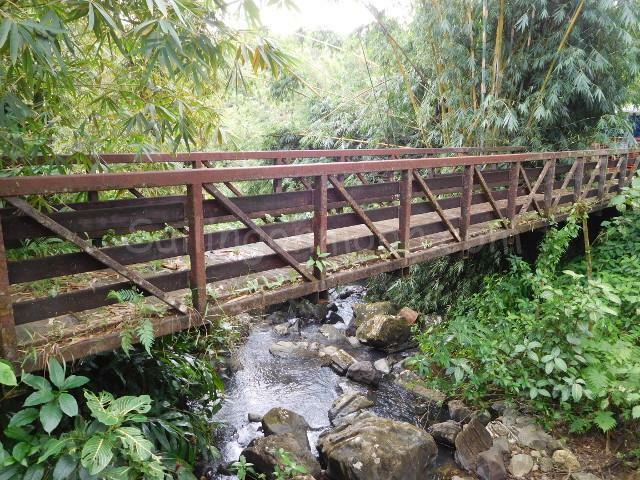 Some of the trails that we wanted to hike in the El Yunque National rain forest were still closed due to Hurricane Maria. I was sure that I was about to step on a snake as we were hiking one path but no worries…it was only a small, vicious looking dried up vine on the ground! 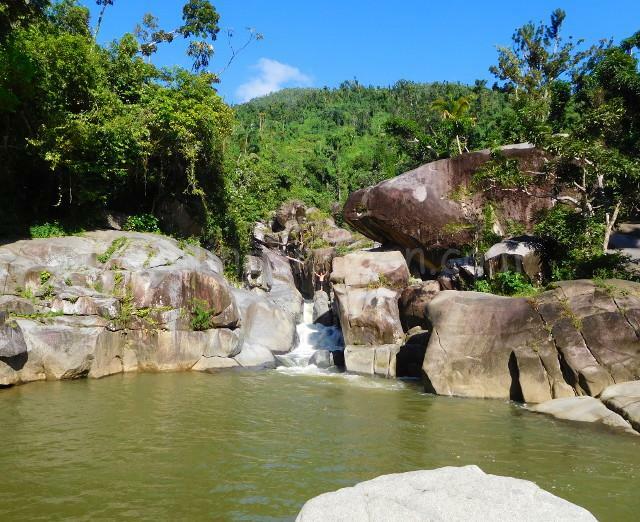 We were in it for the waterfalls but the park has a interesting history… This reserve was first set aside by the king of Spain, which then transferred to the federal government in 1898. The present lookout towers and trails first become established by the CCC. The Civilian Conservation Corps operated in the years between 1933 and 1942. President Franklin D. Roosevelt established the CCC as part of the New Deal Initiative, a program to end the Great Depression. Through this federally funded program, 3,463,766 young men found employment and much needed food, clothing and shelter. Using little else than shovels and axes, the young men of the CCC completed recreation and conservation projects on public lands throughout the United States, Alaska, Hawaii, Puerto Rico and the Virgin Islands. They built roads and towers, developed recreational sites and trails, and engaged in forestry and wildlife improvements. In all of these sites, people today reap the benefits of the work done by the CCC. I wonder if the men that worked so hard on these paths and improvements knew that so many would still be enjoying their labors? 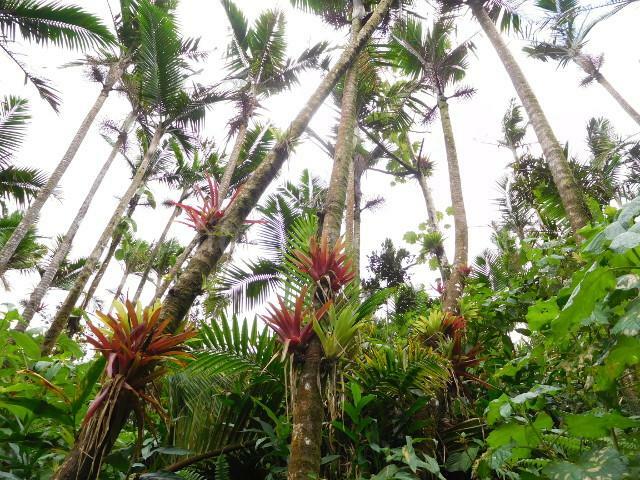 Sierra Palm Forest level of the forest, just below the dwarf forest. Walk through the Sierra Palms on your hike up to Mt. Britton. We hiked up to MT. Britton Tower. 3,088 ft. high. 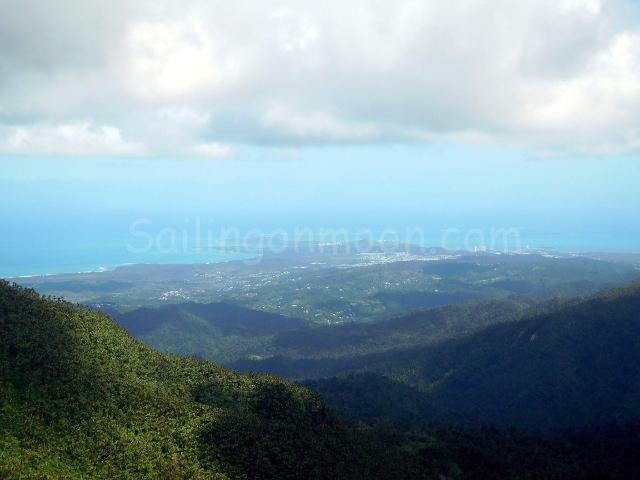 It is a wonderful overlook of the El Yunque Rain Forest, you walk through the Sierra Palm forest as you climb. The path itself is paved, a bit narrow and full of lots of tourists like us on this day! 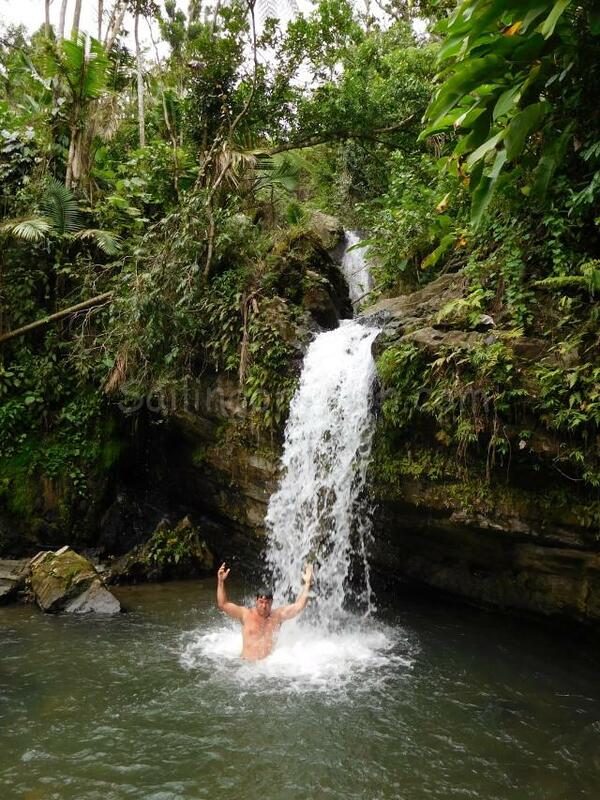 Hippie’s Waterfall, or Salto del Hippie…Look for Brian there way back in the middle. 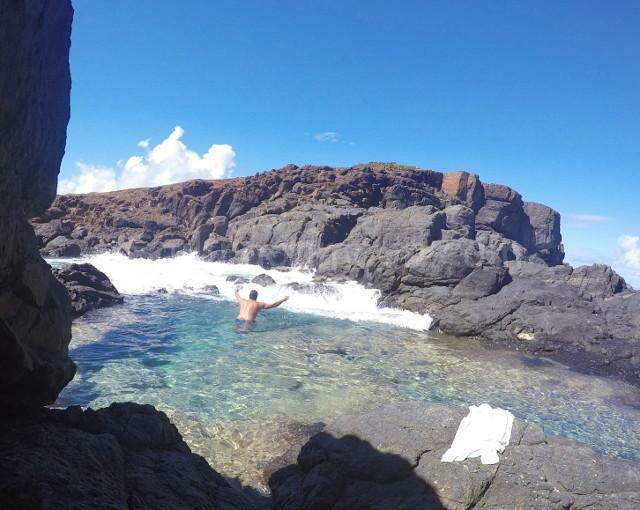 He swam out and climbed over some big boulders for this shot! Survivor Falls (or Cascada SobreViviente) Brian swam all the way over to the falls he said that the flow was pretty strong. 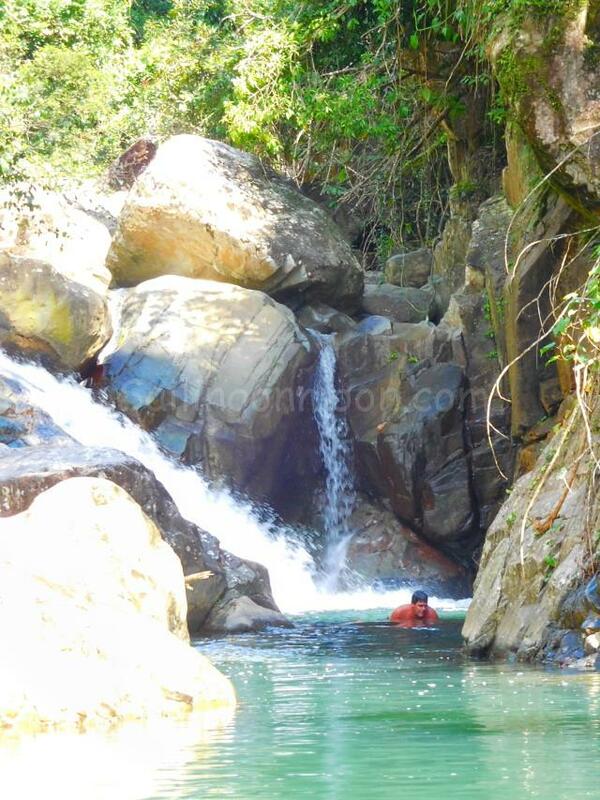 The locals call this place Survivor Falls (or Cascada SobreViviente). 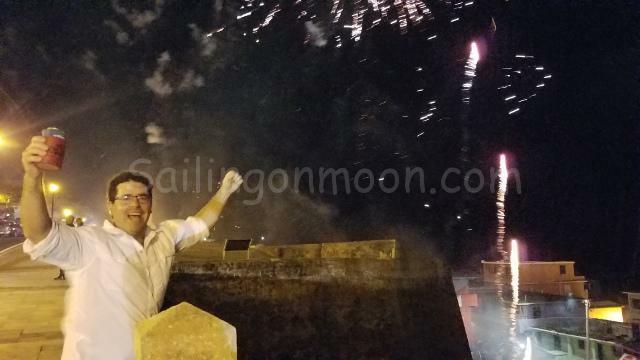 With our fill of waterfalls and hiking up, up and away with aching and tired muscles we headed to Old San Juan to celebrate the new year. 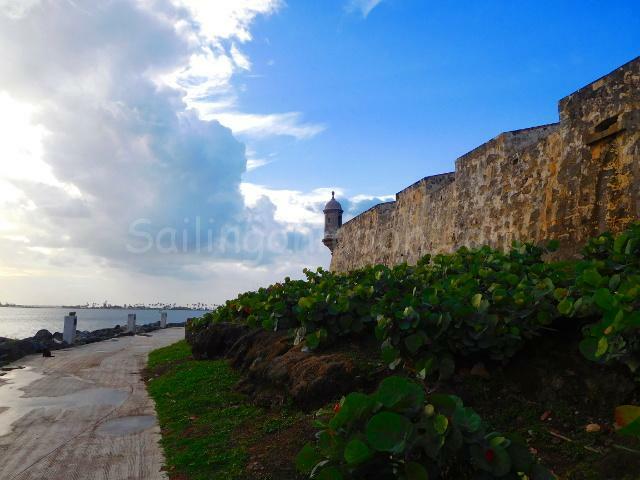 We love Old San Juan! It’s buildings, architecture, town parks and statues, the blue cobblestone roads and oh yea, the cool BIG forts and walls! There is so much to do here that it is impossible to see it all in just a few days. We stayed in the town center and had walking access to all that was offered. 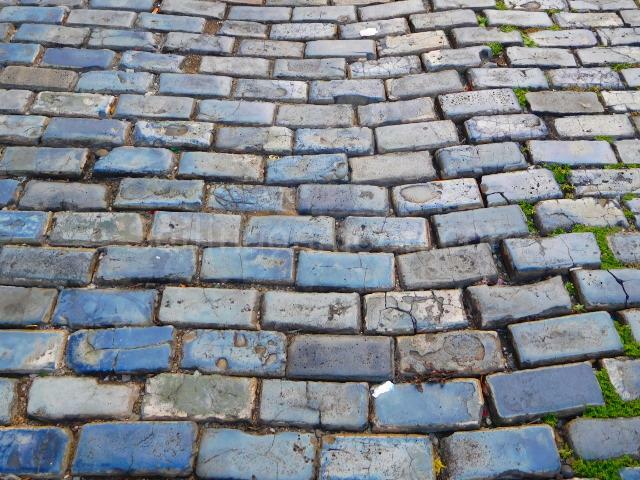 Most of the narrow streets in Old San Juan are paved with adoquines, or blue cobblestone pavers, which were made with iron furnace slag that, according to historians, was part of the ballast of Spain’s sugar-carrying-ships. 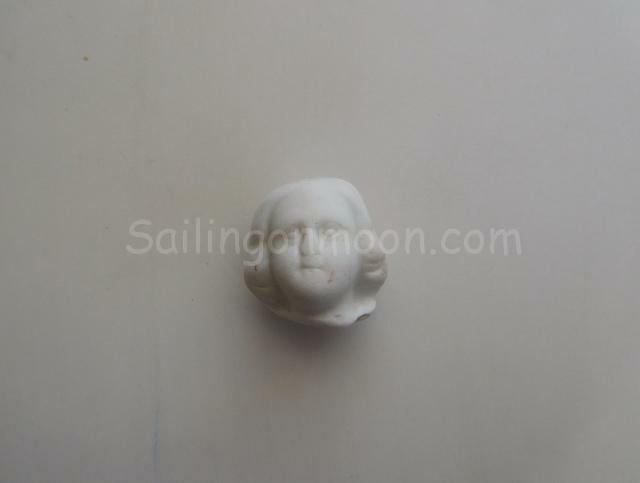 They were brought as ballast in the bottoms of European merchant ships in the 1800s. They were first used as road pavers in 1784. 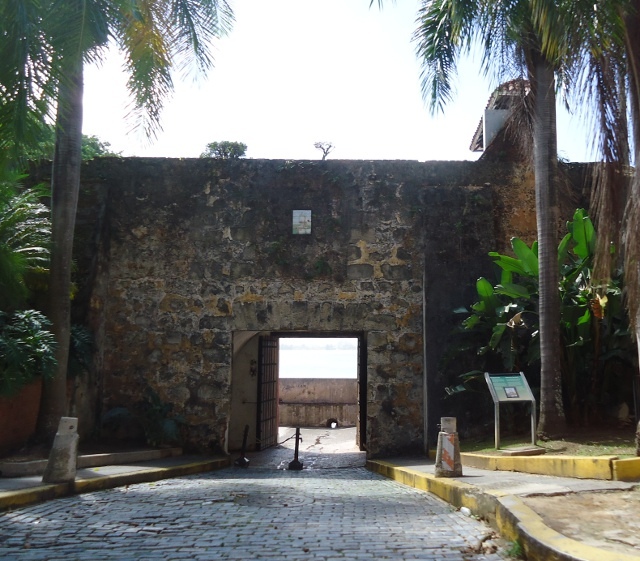 The Puerta de San Juan (San Juan Gate) was built in the late 1700s, is one of six heavy wooden doors in the wall which for centuries were closed at sundown to cut off access to the city and protect the city from invaders. The wall is up to 20 feet thick and up to 40 feet tall. 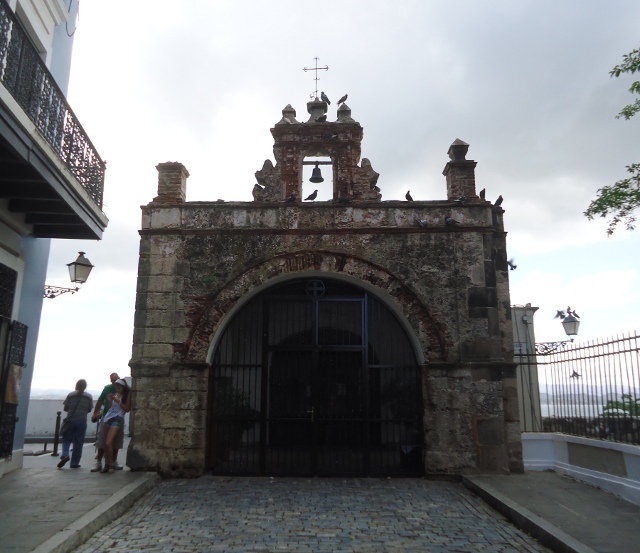 This beautiful old chapel is Capilla del Cristo (Cristo Chapel). It was built in 1753. There are different versions of the story of why it was built – either by a thankful father whose his son lived after his son and his horse fell over the wall, or by a sad father whose son died after falling over the wall on his horse. Either way, the altar is made from thousands of the silver “promesas” that are given as offerings for a wanted miracle. We had a blast trying to take in as much as we could. Sadly the time came for it all to end and Rachel was due to fly home. We dropped her off at the airport with lots of hugs and kisses and a few tears. We had so much fun while she was here! 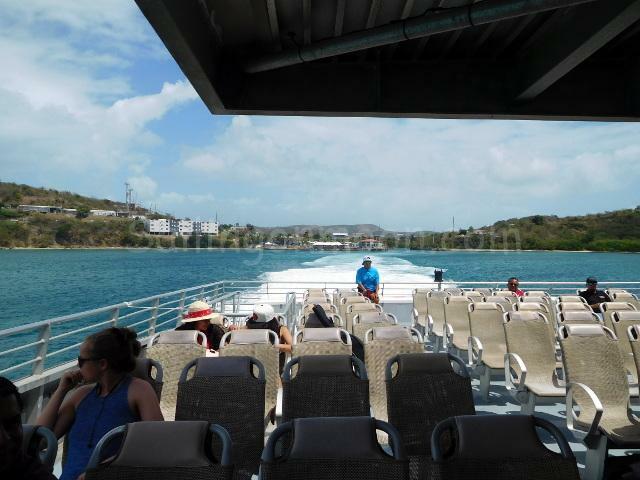 Now our next adventure was to get back to Culebra on the ferry. We knew that the ferry was going to be busy so we had pre-bought our round trip tickets. We thought that we could get some shopping in on the main land before returning home. The shopping did not take as long as expected so we decided to see if we could get an earlier time slot. When we arrived at the ferry dock it was as expected very busy. We soon found out that there were no earlier boats available so we found a nice spot on the grass to make our home while we waited. After sitting a while and listening to others we found out that they had canceled an earlier ferry. We knew that this was not unusual. The ferry is after all public transportation and is not always reliable. I think that their motto is “We reserve the right to make changes at any given time for any reason!”. After a bit a worker came over to some people by us and had a conversation with them…in Spanish of course which we are not yet fluent in. 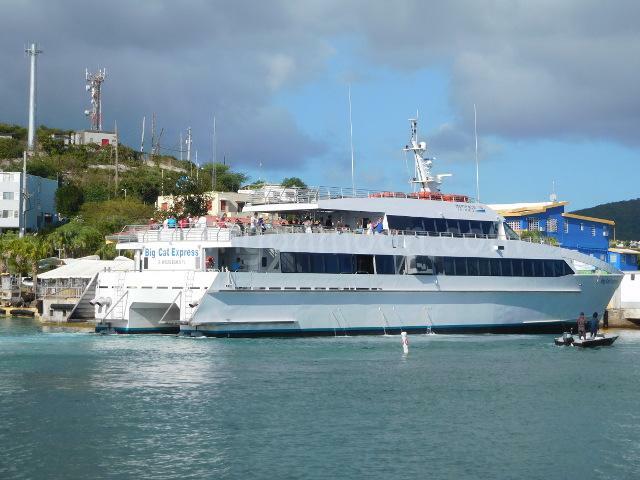 Brian caught her as she was leaving and asked if the three o’clock ferry was still on schedule and she said yes but to take notice and when they called the next Culebra ferry to get in line. 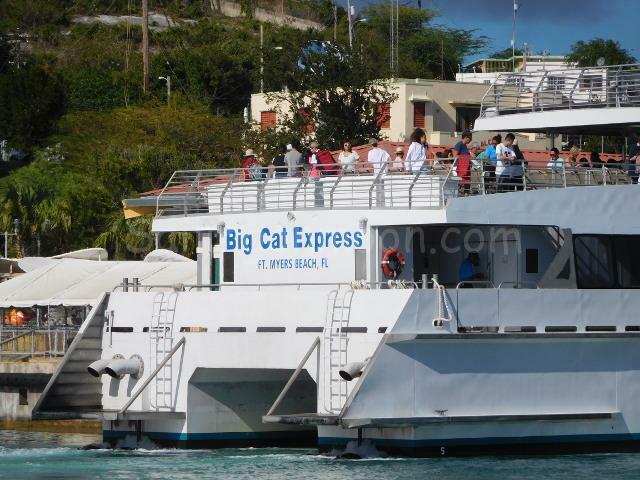 Well, at one o’clock they called a Culebra ferry so we jumped up and got in line. As they were counting the people entering the boat we saw that we were the last ones they that they let on. Don’t tell anyone but somehow we ended up or “snuck” on an earlier ferry. Well, the gate keeper knew that we had tickets for the three o’clock so I guess all was good. After all I kinda think that it was her suggestion anyhow. Yea! We did not have to sit for two more hours or more I mean who knows if the last ferry was delayed or even canceled. We were just glad to be home! Lots of folks waiting for the the delayed ferry to Culebra. So here we are back on Moon. No Rachel 🙁 But I know that we all had a blast while she was here. 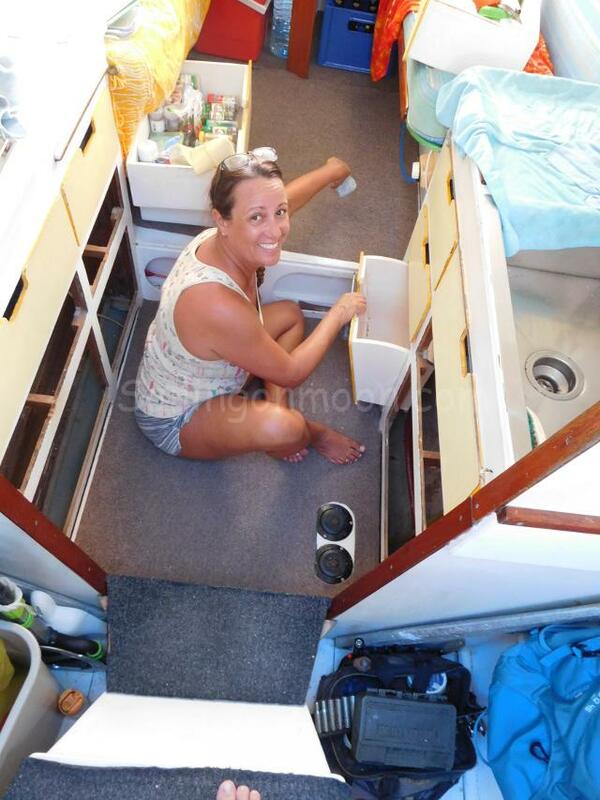 We are back to normal doing small chores around the boat. Lots of things to do and an endless list so no problem there. 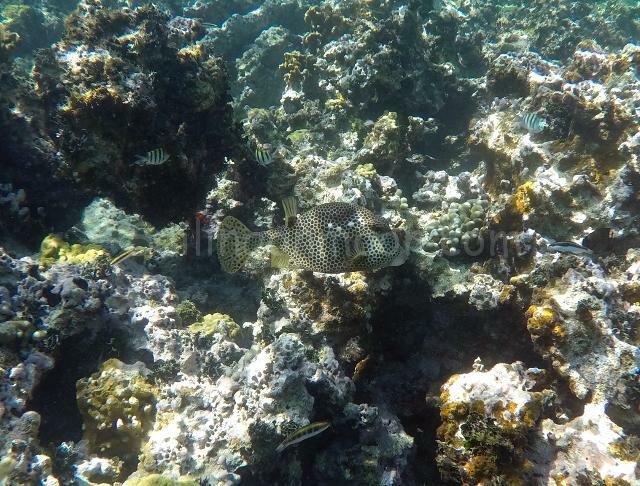 I think that we will plan too snorkel again some time soon and this time I will bring the go pro and hopefully that beautiful turtle will be waiting for us to share with you. Take care all until next time. It’s happened…we are salty again…we think that deserves a BIG Woo Hoo! It is so nice to be back in the water. 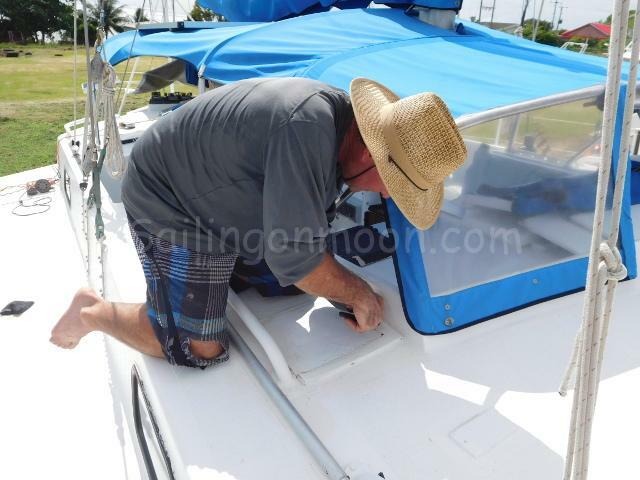 This was the first time that we have stayed on the boat in a dirty, dry, dusty, buggy, yucky boatyard…oh, with the exception of when we first sailed to Key West and I was pregnant but I guess that I did not know any better then! 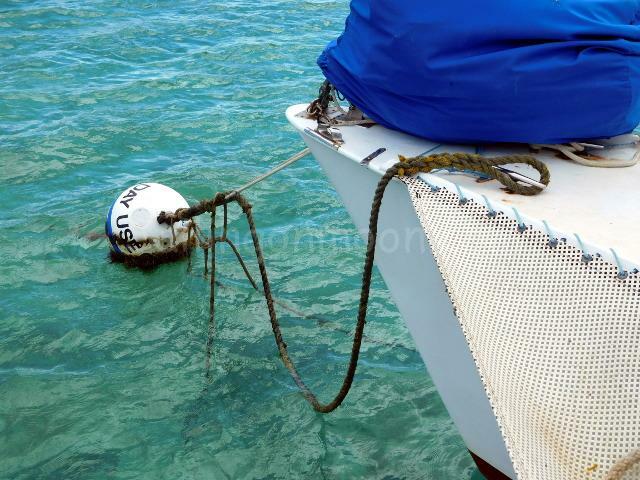 Oh and wait, we stayed on the boat in the yard in Jamaica but somehow it was not as bad…must have been all of the Red Stripe that blurred my memories…lol! Anyhow we are out of there! Don’t get me wrong the yard was just what it was supposed to be a great place to store and work on our boat and it served it’s purpose. 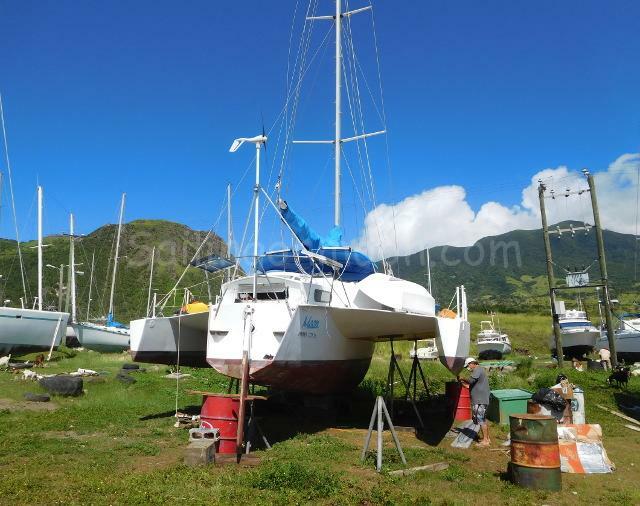 The nice thing about Saint Kitts Marine Works Boatyard is that they allow you to work on your own boat. 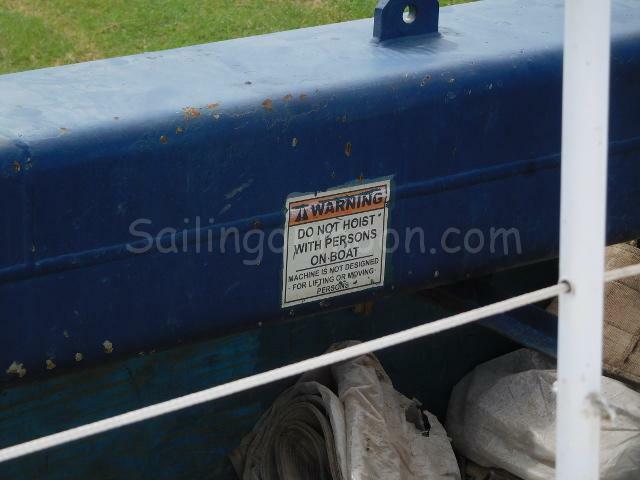 Most other yards don’t allow this and you have to hire workers. Not only is that costly, who knows what the quality of their work might be like. We like to be certain that it is done right and that is why although painful we like to do the work ourselves. 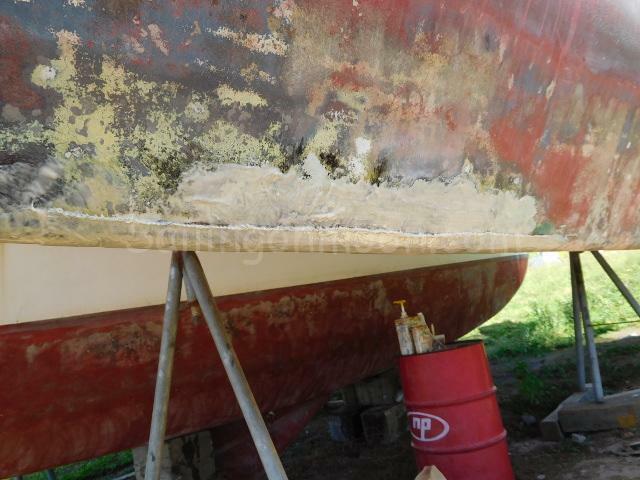 Brian added some fiberglass for extra strength on the bottom of the hulls where the lift puts its straps when we are hauled out. 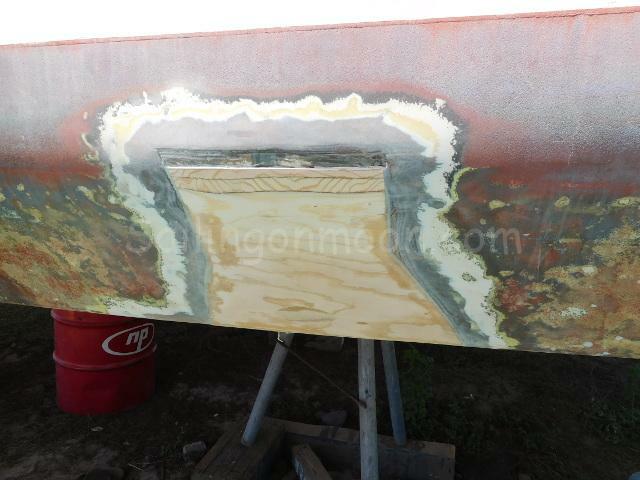 Almost done painting the bottom. Brian had his work cut out for him too. 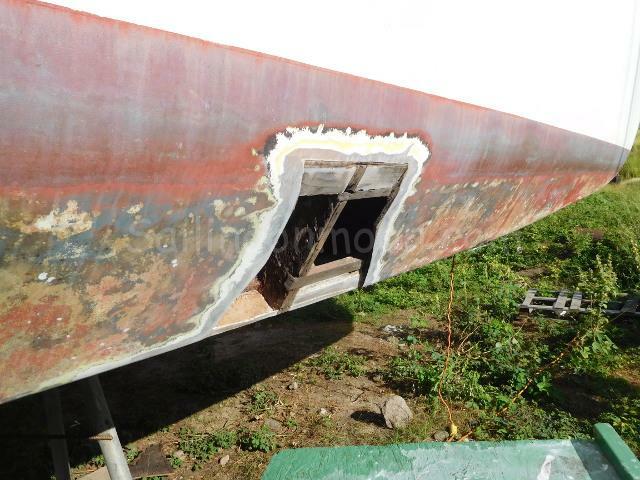 Last season we had trouble with a small leak in our starboard ama. We figured that it had happened when the travel lift had put us in the water. 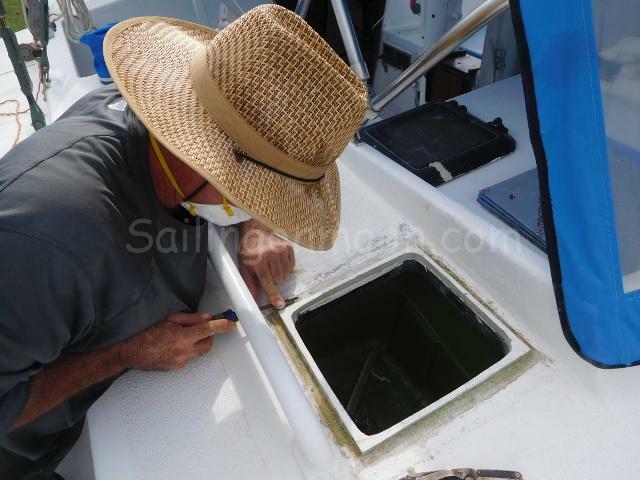 Brian did some underwater repairs as a quick fix but the spot needed further investigating. 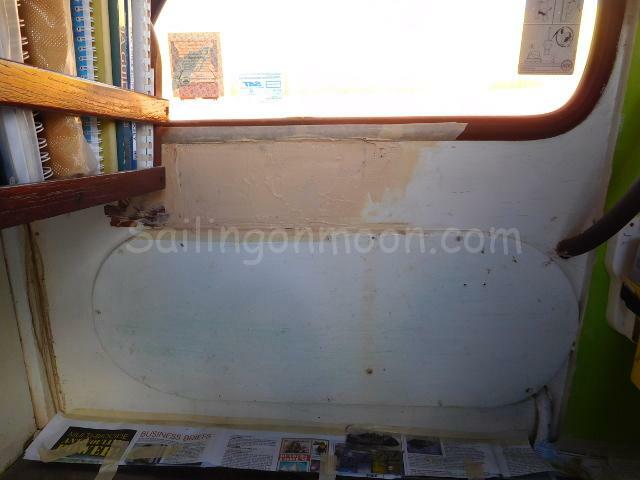 He opened up the crack and removed all of the weak wood and replaced it with marine plywood and light foam board making the spot stronger than ever before. We had a weak spot that had a small leak. 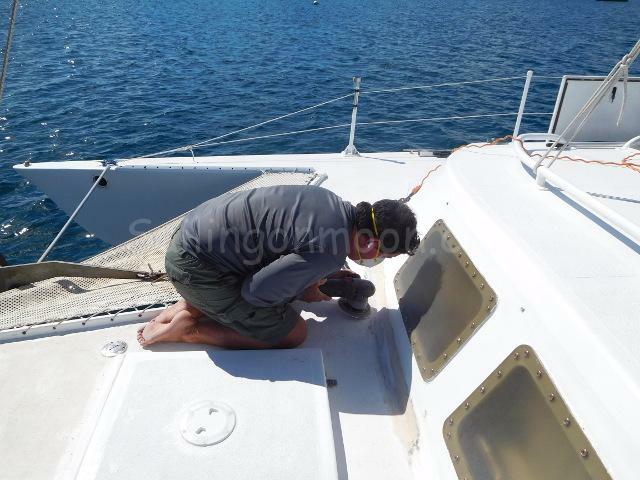 If you read through some of our past posts Brian had to make repairs at sea on this spot before. 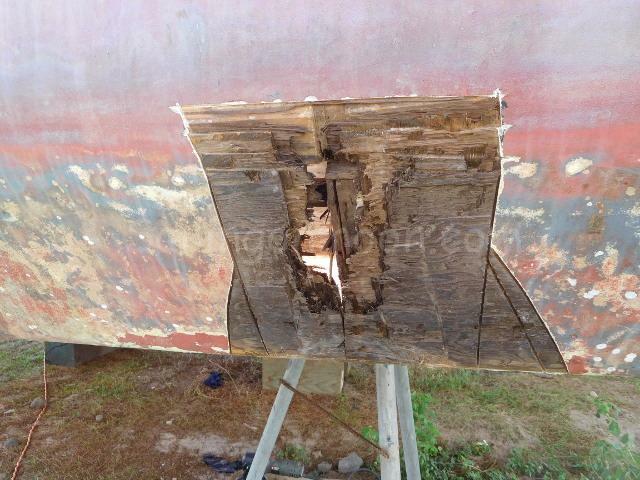 While we are hauled out Brian removes all of the weak wood, installs some marine plywood and foam board and fiberglasses it for a strong repair. 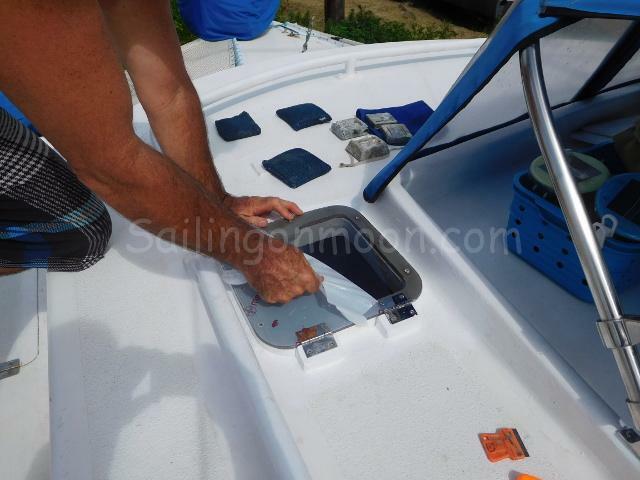 He also put some fiberglass tape on the bottoms of the hulls where the lift puts most of it’s pressure when taking us in and out of the water to give the other amas more strength. Now Moon is good and strong in these key areas. 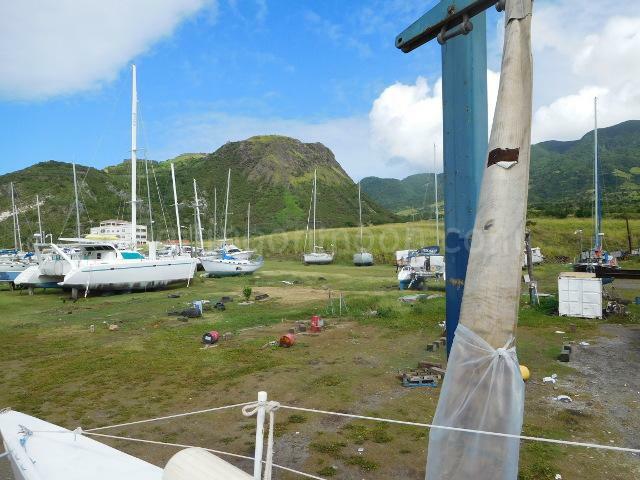 Leaving our dusty piece of land at the boatyard. 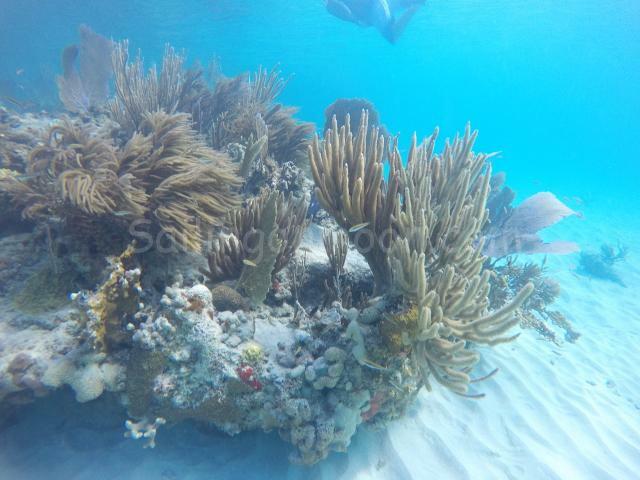 On our way to the Caribbean Sea… prepare for splash down! SPLASH! We are in the water! Woo Hoo! 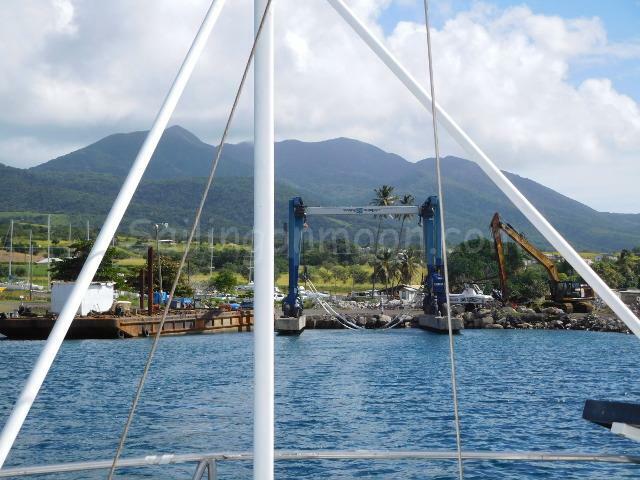 See ya later Saint Kitts Marine Works! 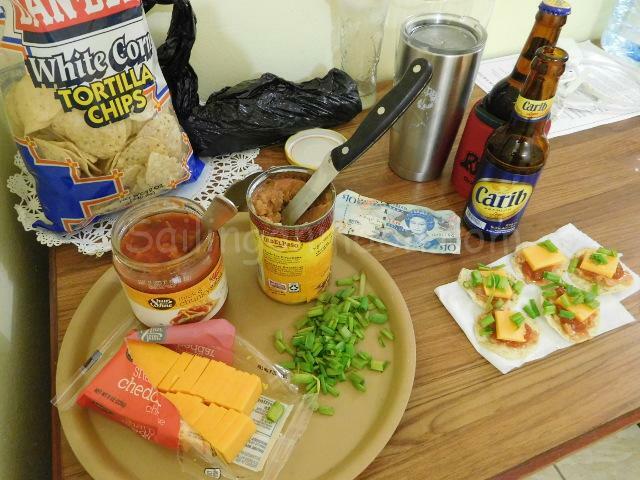 We made our last few trips to the local supermarket to load up on some supplies that we knew would cost more on the islands and we were ready to splash down. 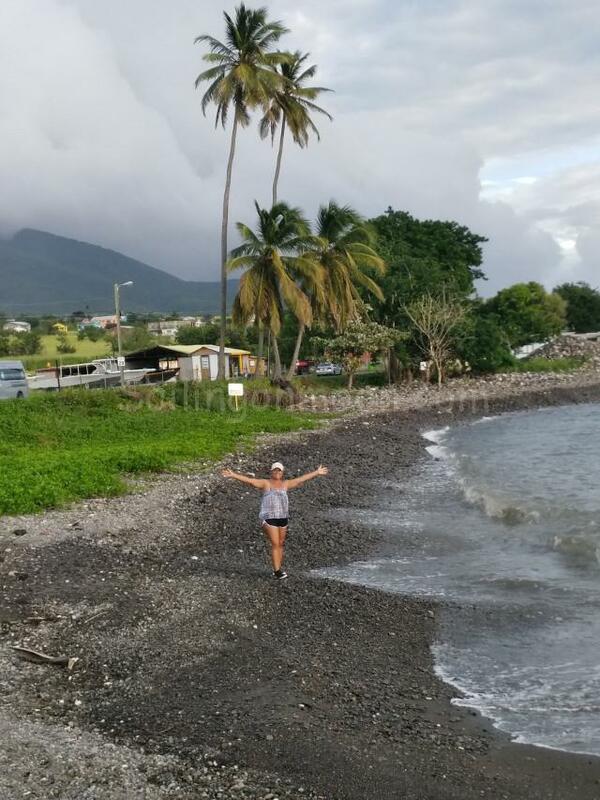 Now I will not miss the boatyard one bit but I will really miss the beach out front that I have had so much fun beach combing. 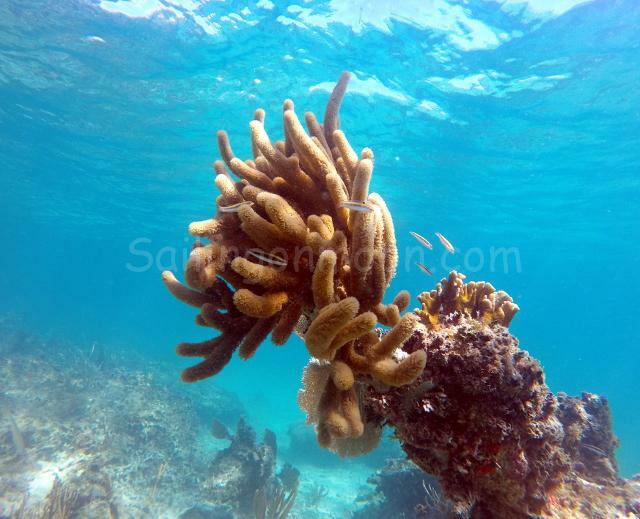 In my opinion it is one of the best in the Caribbean (for beach combing). I can’t wait to start making stuff from the things that I have found there to share with you all. The treasures that I found on that beach are just outstanding! 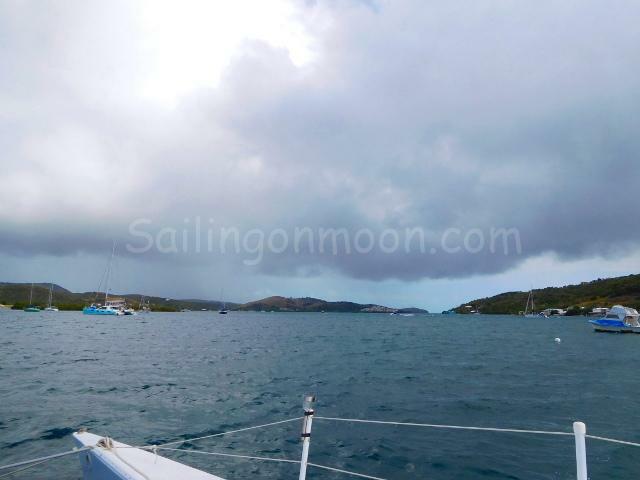 When Moon was finally wet again it was about mid afternoon and we wanted to make sure that all was good with her before we got too far away from the boatyard, just in case. We decided to motor up against the wind and waves to Whitehouse Bay. 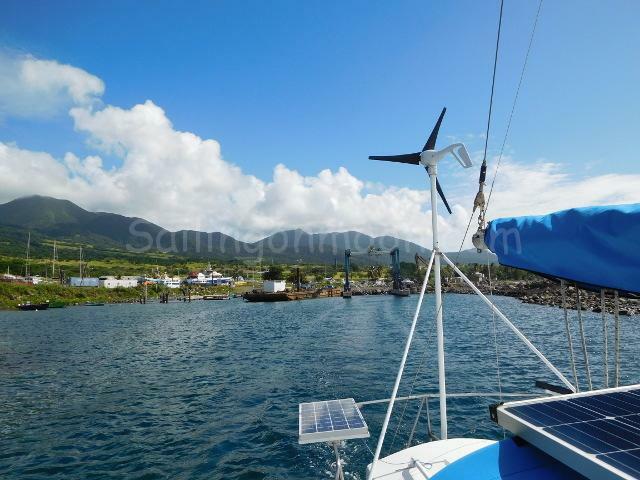 This is one of the few protected bays that St. Kitts has to offer and it happens to be a favorite of ours. It rained a monsoon on us that night and the winds howled but we were as snug as a bug. It was a great first night back on the water. All of the repairs held fine, no new cracks from the lift, engine was running just as it should and we were good to go. 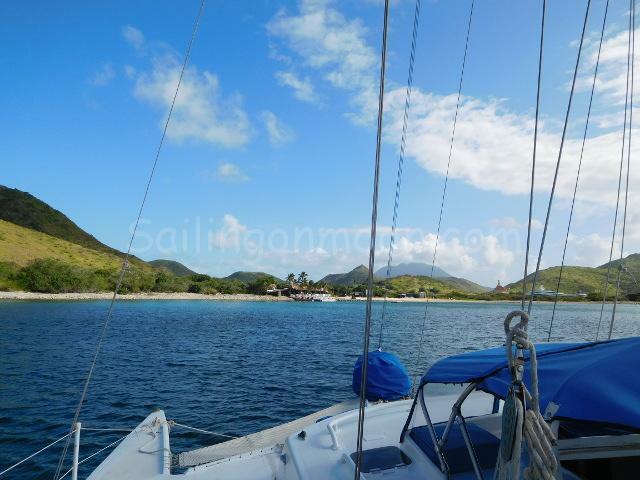 Our first stop after leaving the boatyard was one of our favorites: White House Bay, St. Kitts. 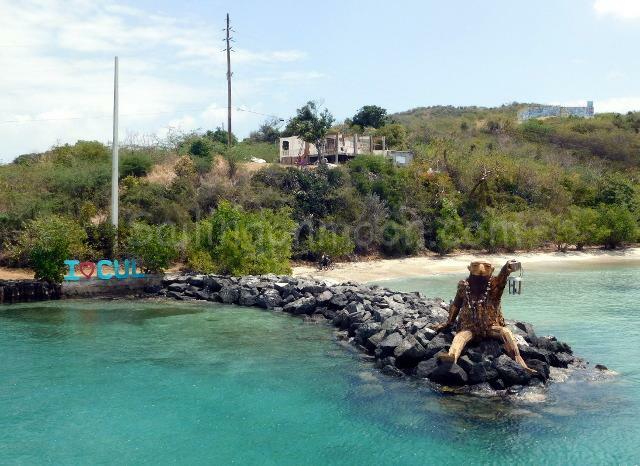 Monkey running along the shoreline in White House Bay, St. Kitts. 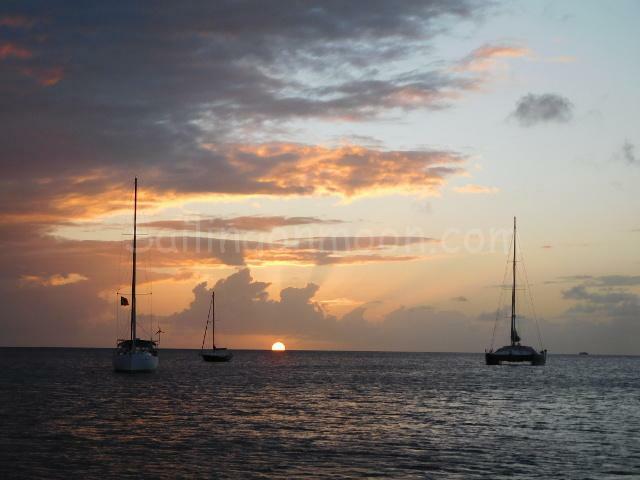 At the crack of dawn we set sail for St. Maarten. Lucky us we were sailing downwind and it was a fast and uneventful ride. 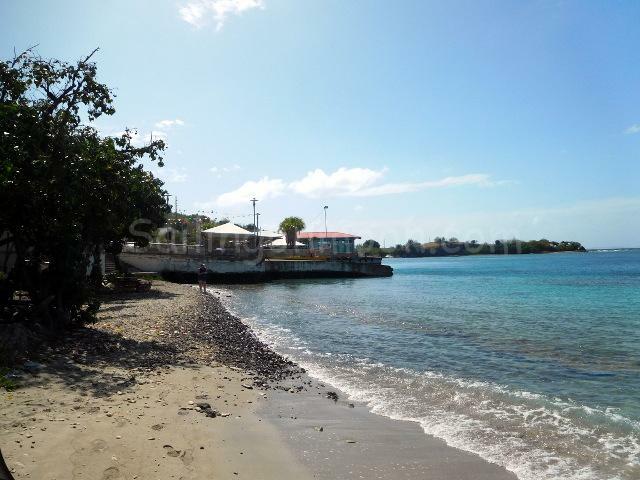 We arrived in Simpson Bay around four in the evening found a spot and it was anchors away. We’ve only anchored in this bay twice now and it was a bit rolly this time just like the last but we still got a pretty sound sleep. 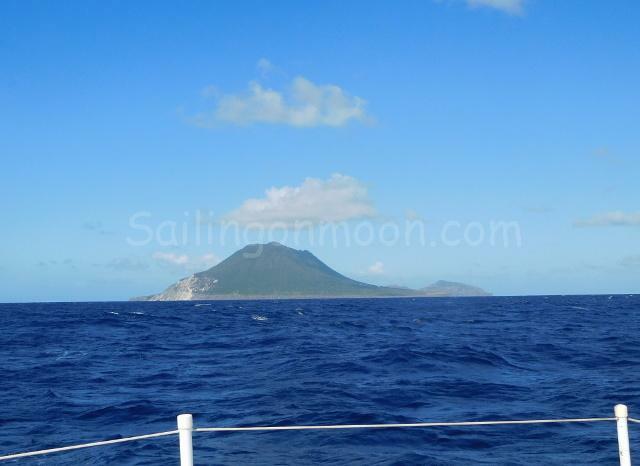 Sailing from St. Kitts to Sint Maarten we pass by the volcanic island of Sint Eustatius, also known affectionately to the locals as Statia. 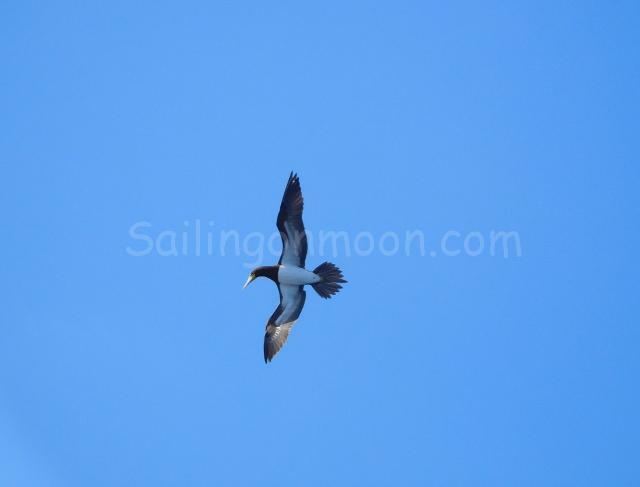 The flying fish were really jumping and these brown booby birds were taking advantage of it. 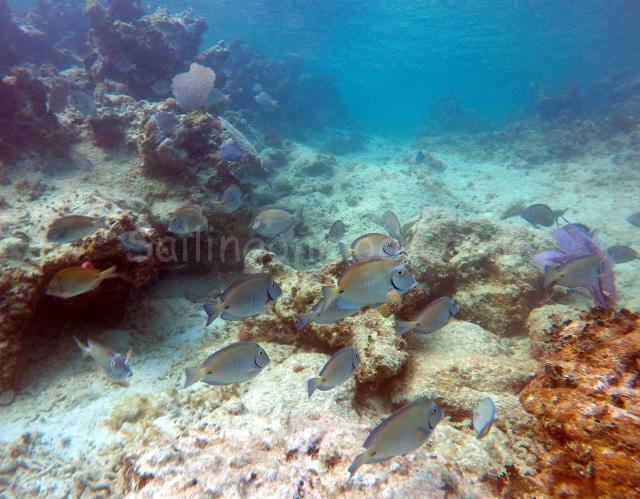 They entertained us for quite some time diving for their lunch as we sailed along. 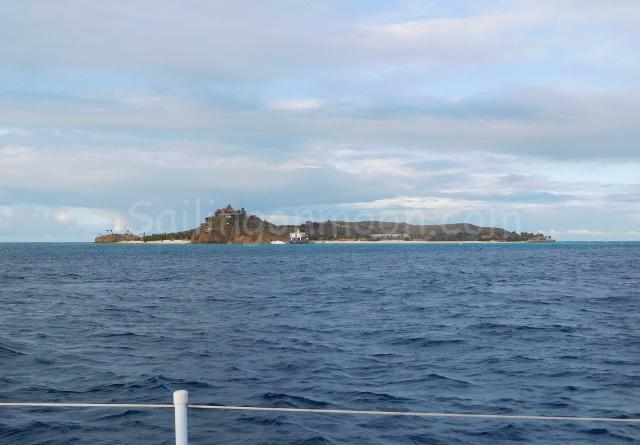 Approaching the two island nation we are heading to the dutch side to anchor in Simpson Bay, Sint Maarten. In the morning it was the same as the day before we were up early. 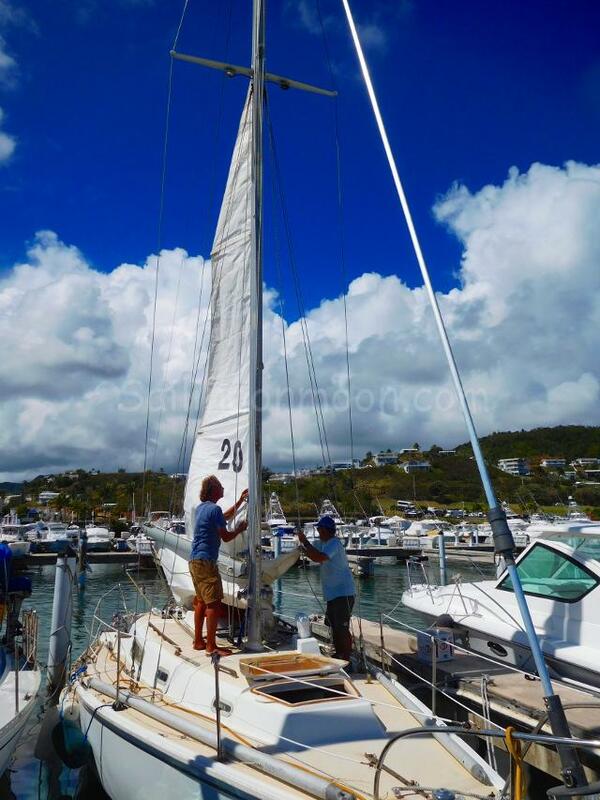 This time we got started about 5:30 because we had a longer sail ahead of us…about 80 miles. Downwind again it was like a sleigh ride, very comfortable and very fast. 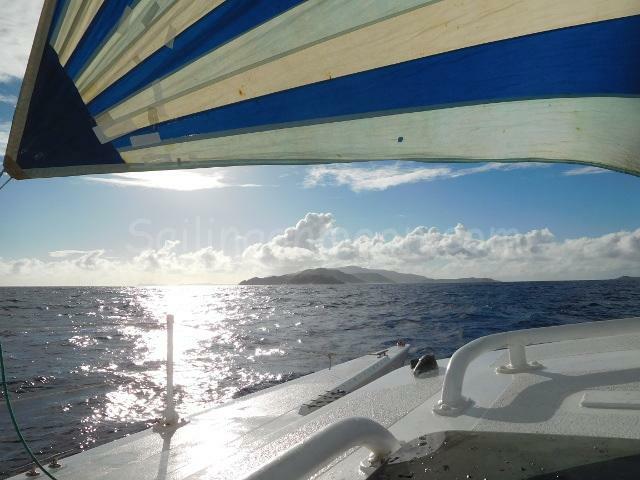 We made the trip in about 11 hours where we anchored right before sunset in the protection of North Sound, BVI’s right across from Sir Richard Branson’s own Necker Island. 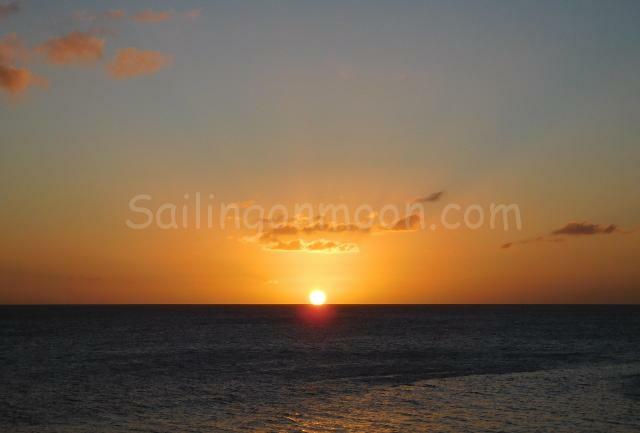 Approaching North Sound, BVI as the sun is going down after sailing around 11 hours from Sint Maarten. Necker Island. Owned by Sir Richard Branson and bought for $180,000 in 1979. 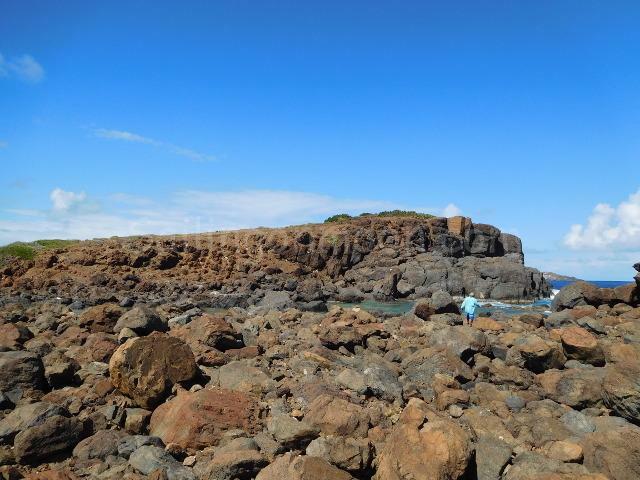 On first observing the islands, he envisioned using them to put up rock stars for his record label. Upon arrival, he was given a luxury villa and travelled around looking at islands for sale by helicopter. 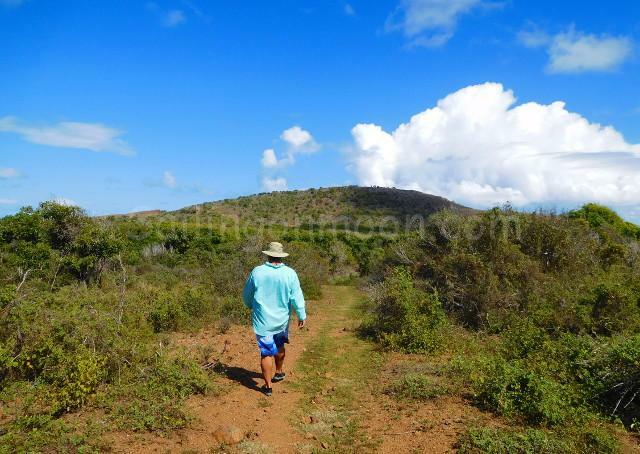 The final island he saw was Necker Island, and after climbing the hill and being stunned by the view and wildlife, he decided to purchase the island. 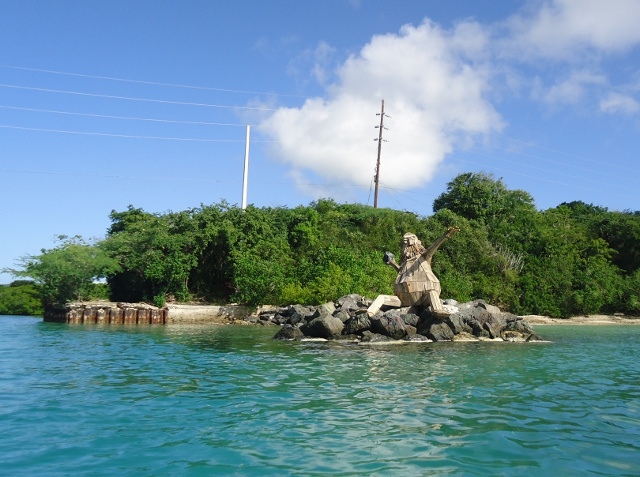 After making a lowball bid of $100,000 for the $6 million island (due to his relatively modest funds at that time in his career), he was turned down and escorted back to the mainland. A year later, the owner, John Lyttelton,in need of short-term capital, eventually settled for $180,000. 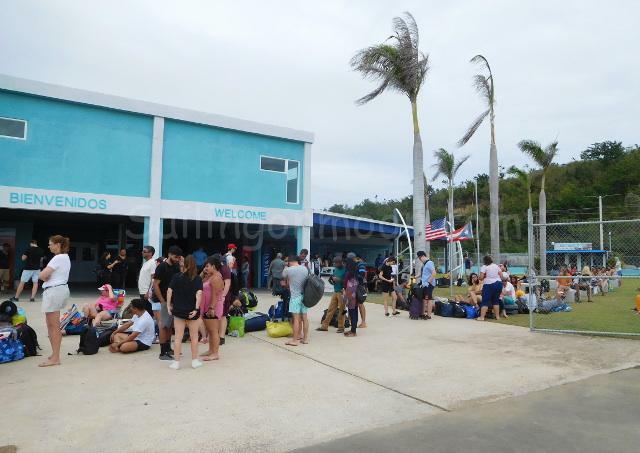 However, the government imposed a restriction on alien landholders: that the new owner had to develop a resort within four years or the island would revert to the state. Branson committed to build a resort on his tropical dream island. 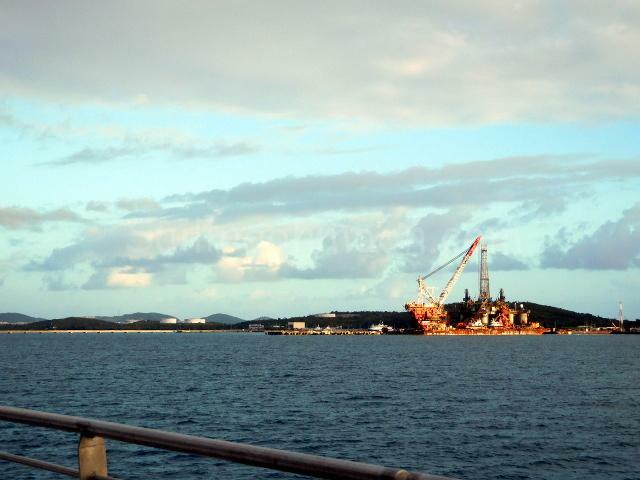 When Branson bought the island, it was uninhabited. He purchased the island at the age of 28, just six years after starting Virgin Group. 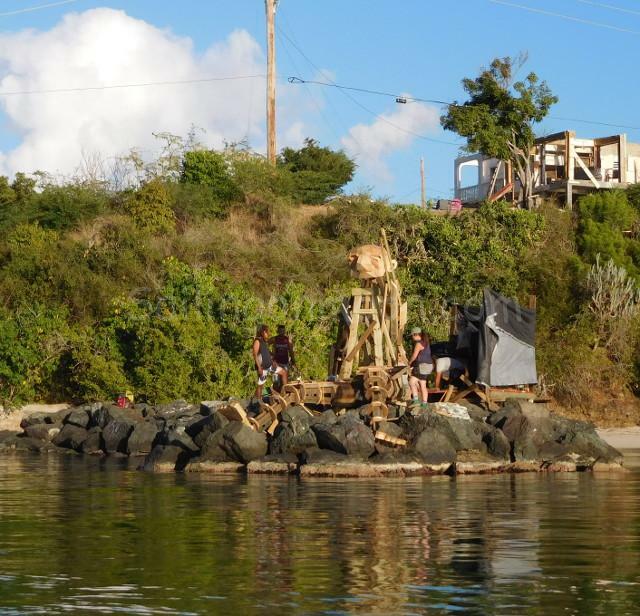 It took three years and some US$10 million to turn it into a private island retreat. 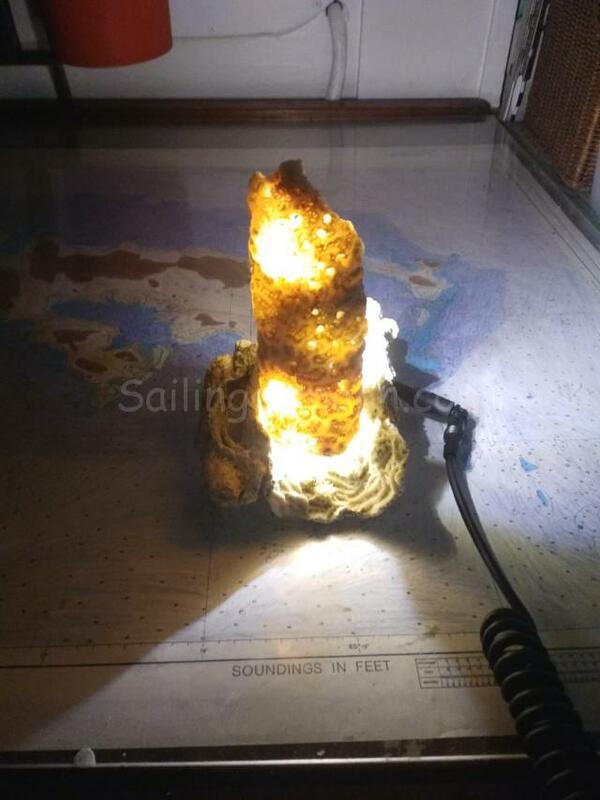 After another night of a bumpy anchorage behind a reef but we were golden. Out of the open seas we were now in the protection of the British Virgin Islands and the rest of our trip was going to be nothing but bliss. Being away for so long I had forgotten how nice it was to sail here, anchorages galore and mostly protected waters. Not like sailing from island to island in the West Indies where you are exposed to the elements of what can be raging waves and seas. Here it is heaven. 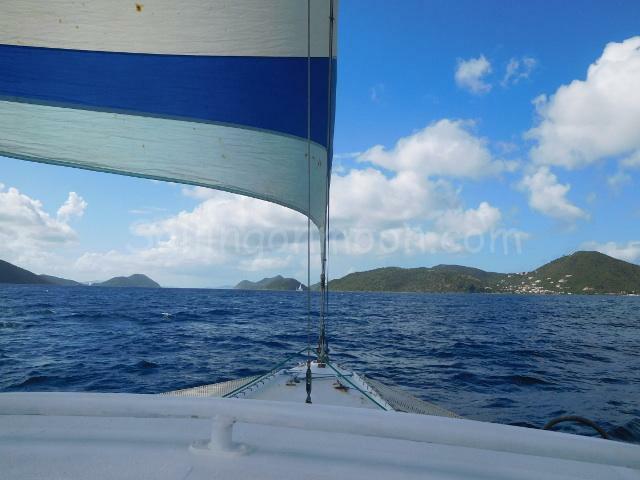 With not far to go and it being a downwind sail we were in our next destination in no time…Charlotte Amalie, St. Thomas. That’s it…we have arrived…all is good. It is such a good feeling when everything works out as planned. 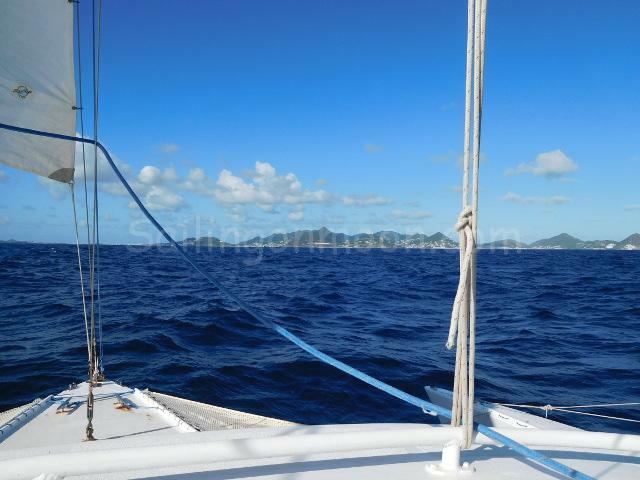 Sailing through the beautiful BVI’s. 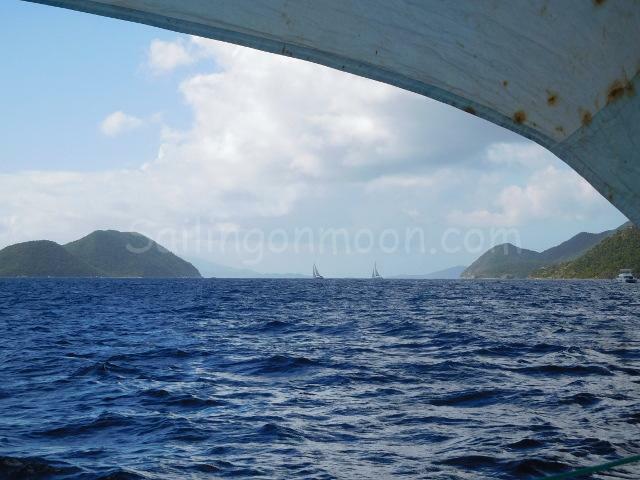 Looking back at Tortola, BVI as we sail by. 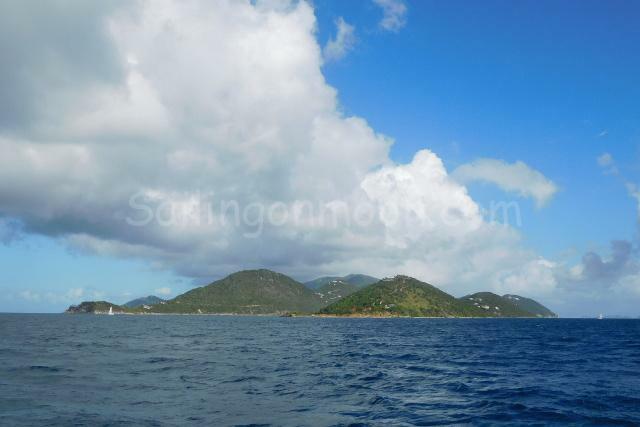 Passing through Sir Francis Drake Channel we have the island of St. John USVI on our left and Great Thatch Island, BVI on our right. St. Thomas is the hazy island way in the background left. Finally time to get off of the boat and relax a bit. 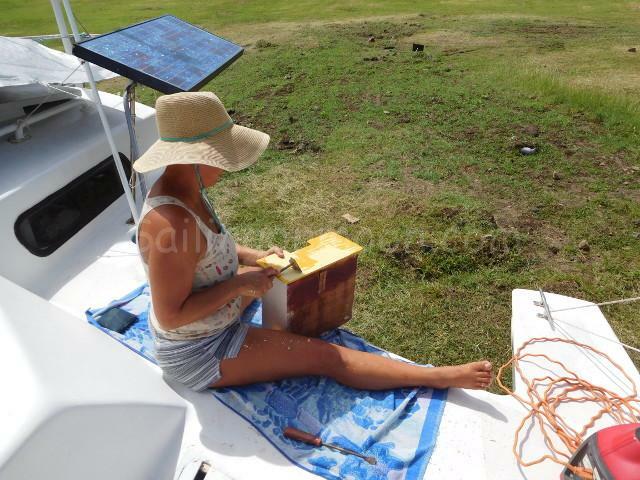 We spent some time walking around to get our land legs back after being on the boat for four days and we stocked up on supplies since we were on the “Big Island”. 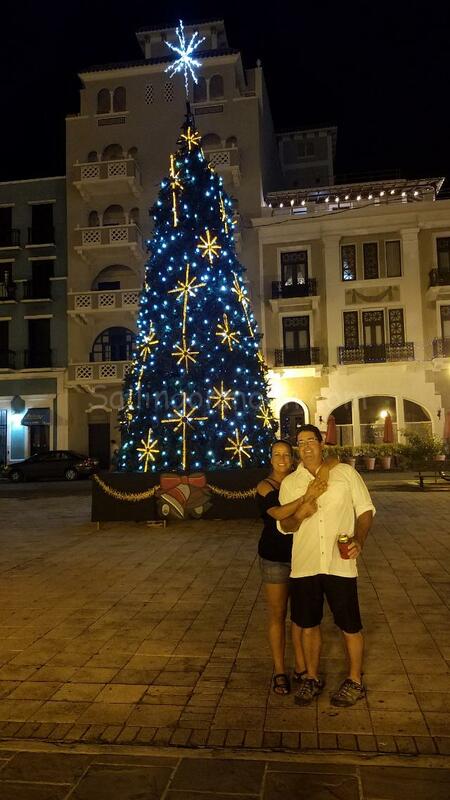 Next stop for us would be Culebra, Puerto Rico where we will be spending Christmas with our daughter Rachel. Not the most spectacular sunset that we have ever seen but it was our first after leaving the boatyard and that made it amazing to us! 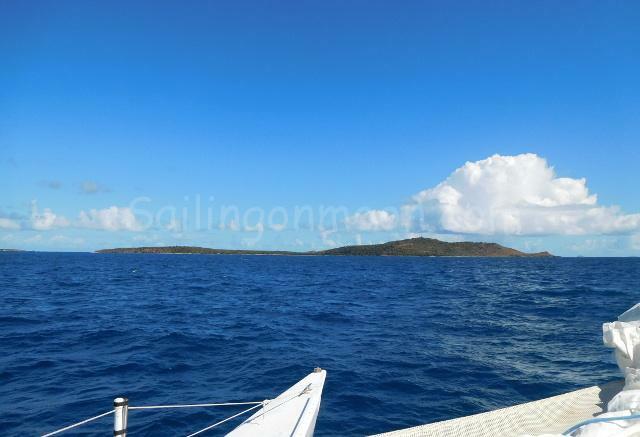 As we sailed off to Culebra again it was another sleigh ride downwind and we have arrived home, or for what we will call home for now. 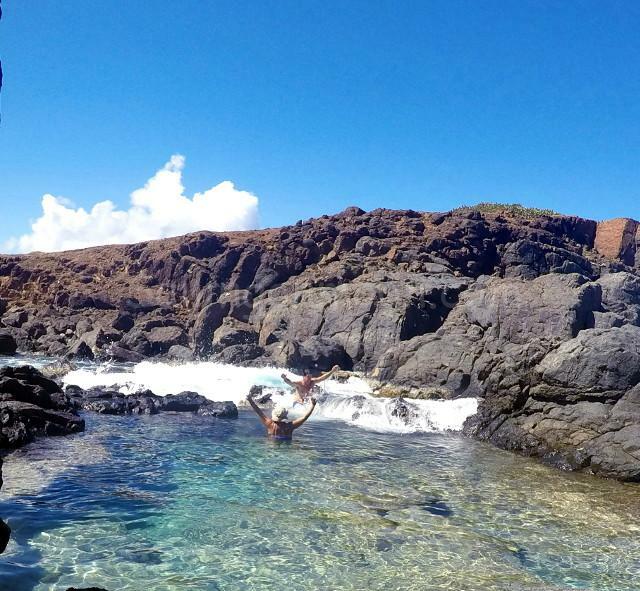 We love this island. The people here are wonderful and it is one of our favorite places to be. 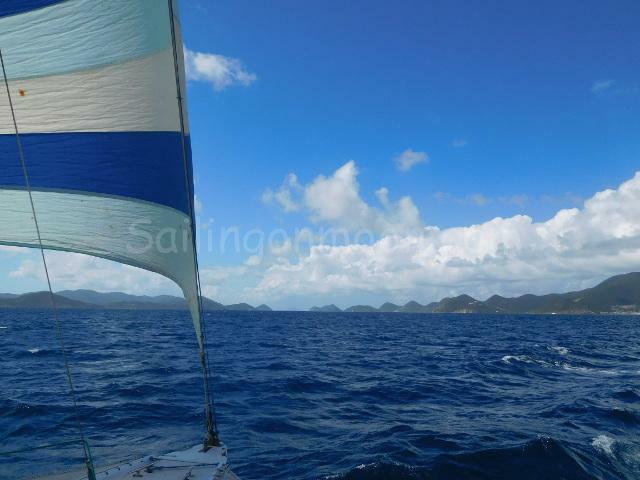 I can really get used to this downwind sailing stuff…it is what sailing dreams are made of. 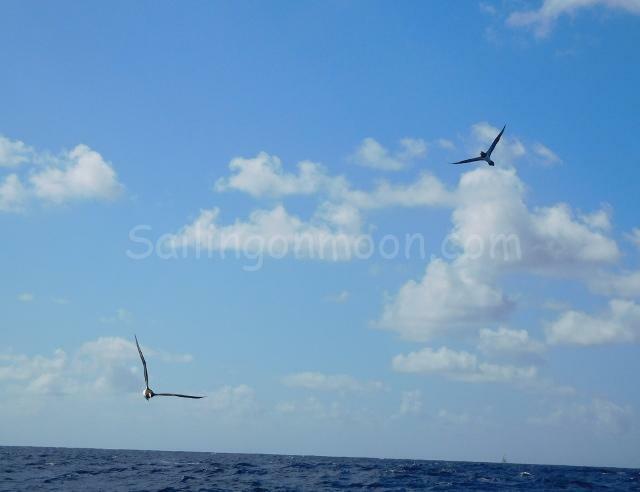 I told Brian that we should only sail downwind from now on. He said that the only way to do that would be to sail around the world…hhhmmm…it’s a thought! Take care for all now. If we don’t write again before Christmas we wish you and yours the best. Remember to hug the one that you love and be thankful for all that you have and cherish what a beautiful world this is. Hello again. 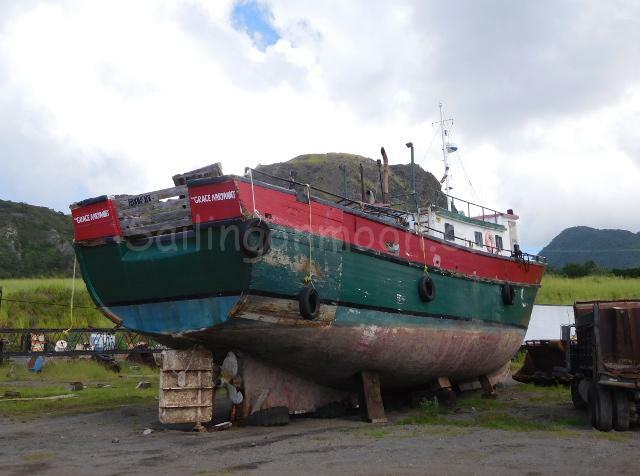 We are still in the boat yard and things seem to be moving at a slow pace. Brian was able to complete our new hatches and they look great! 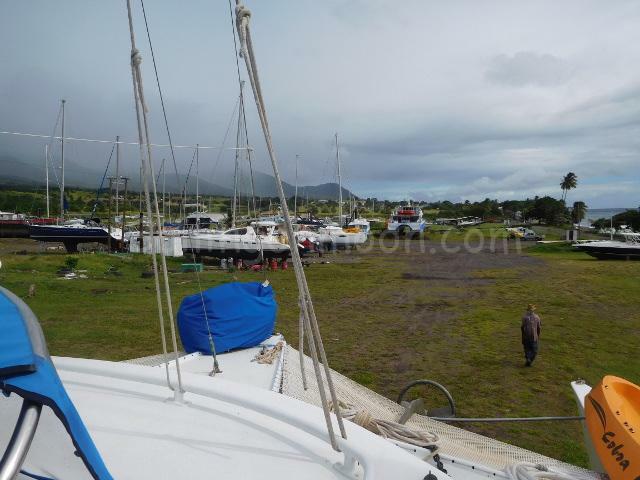 The mosquitoes and no see-ums have been unbearable here in the boatyard and we’ve had lots of rain and wind due to a tropical system that passed over us. We don’t have much room inside to move around or hang out so it’s been pretty depressing. 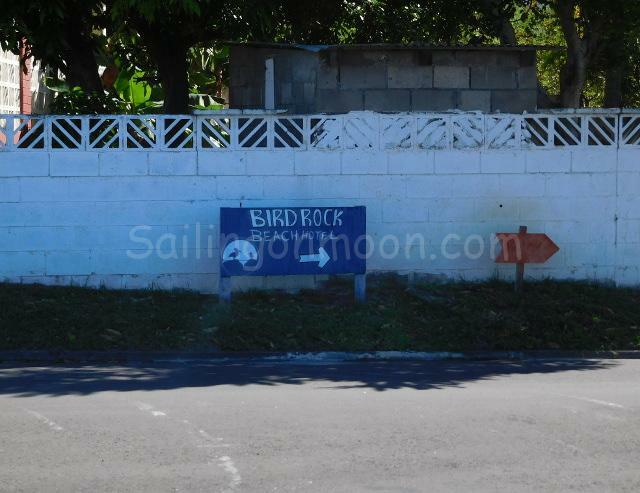 So much so that we decided to take a break and head to Bird Rock Hotel for a reprieve for a couple of days. 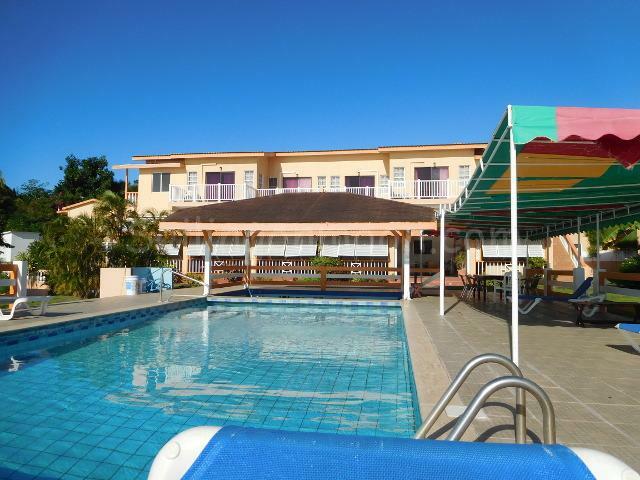 There is a guest house that we normally use when we are here at the boatyard that is convenient but Bird Rock Hotel has air conditioning and a really nice pool. More like being on vacation and that is what we really needed, after all we are in paradise! This is sort of an inside joke for Rachel…look mom’s camp side nachos are better than dad’s…you were right I over do everything! 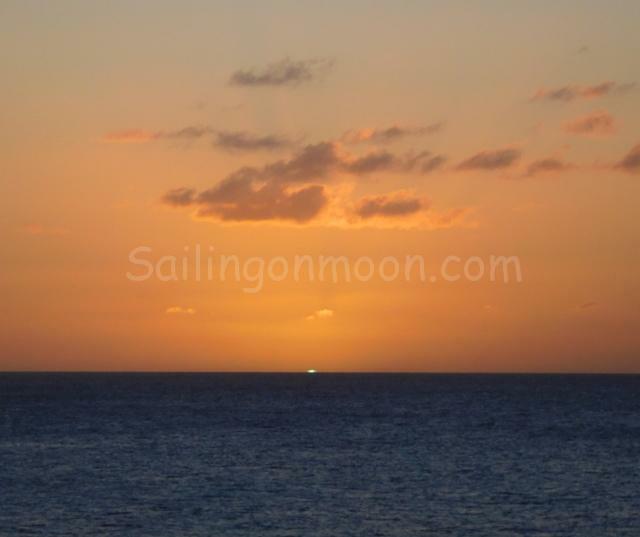 It might be small but this is the first time that I was able to catch the green flash with my camera! WOW! 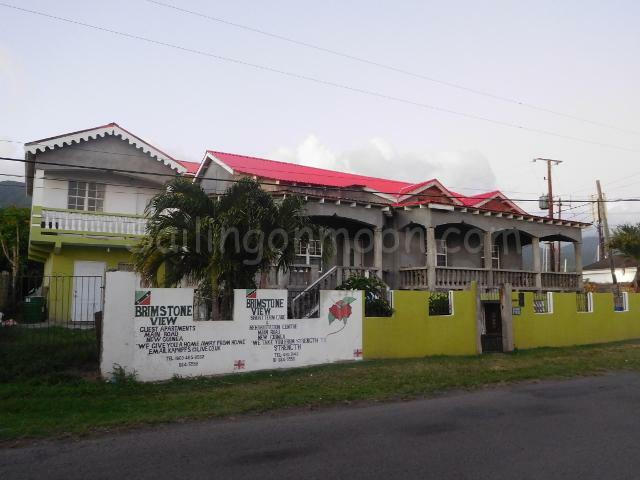 We have meant to mention Karen’s guest house before but haven’t. 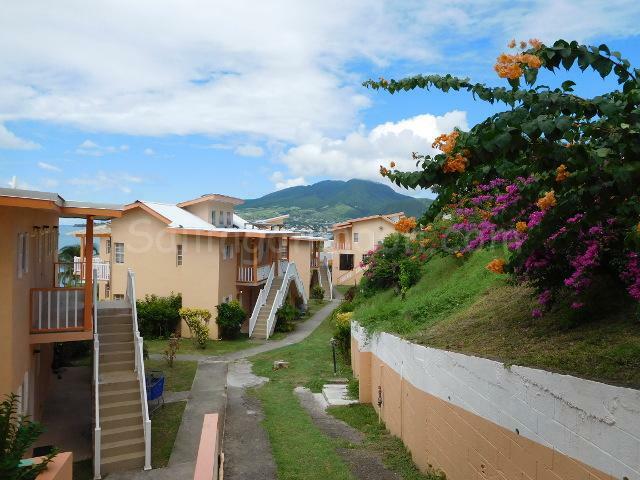 Brimstone View Guest Apartments. 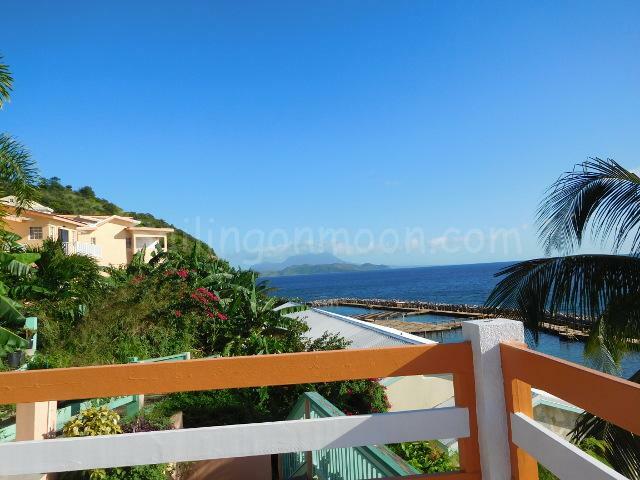 If you find that you are in Saint Kitts and staying at the boatyard here, Saint Kitts Marine Works even for a couple of days that Karen’s Guest house is a great spot! 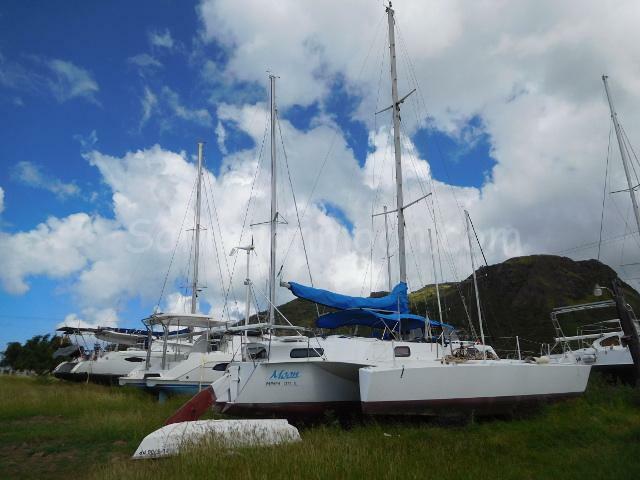 It is very close to the marina and can accommodate even large crews if needed. Her prices are reasonable and it has a nice kitchen, comfortable beds and a washing machine. If you would like to give her a call here is her contact info: email: kaphipps@live.co.uk or kaphippswork@outlook.com , PHN: 869-465-8592 or 869-664-5558. 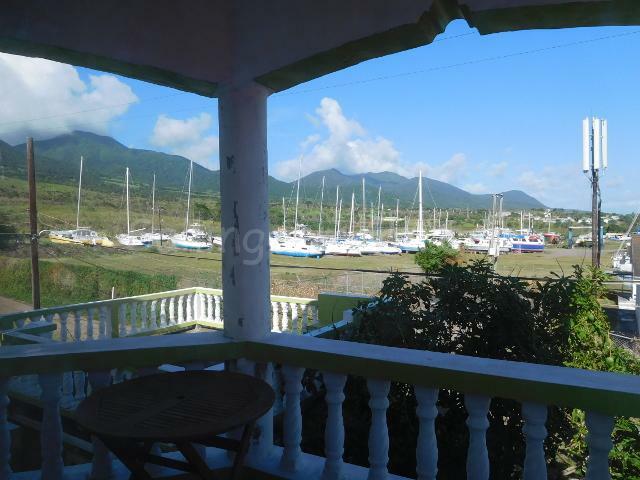 Brimstone View Guest Apartments right next to the boatyard. 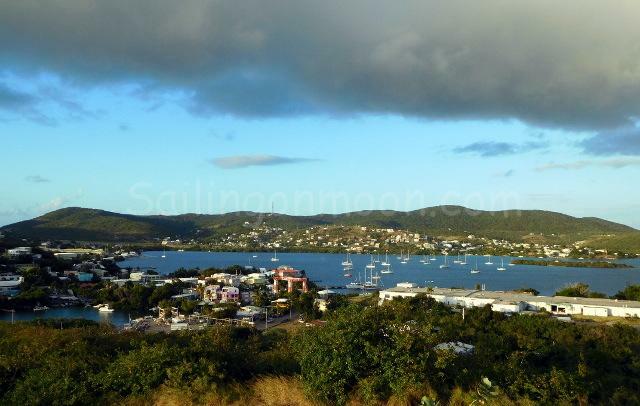 View of boatyard from the Brimstone Hill Apartments. 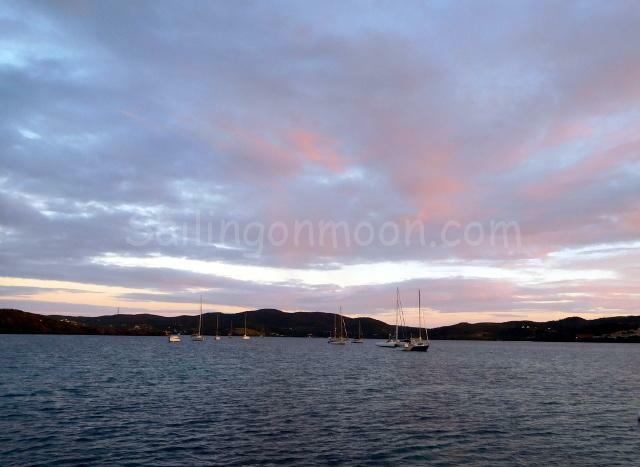 You can just see our Moon…she is the boat with the red bottom. Now that we have had a chance to refresh our attitudes we are back at it. Moon has been moved to our next step. 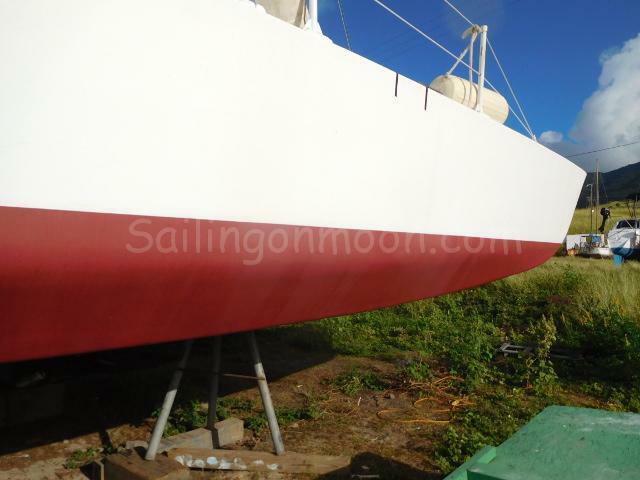 She is up on stands and we are getting ready to sand and paint. 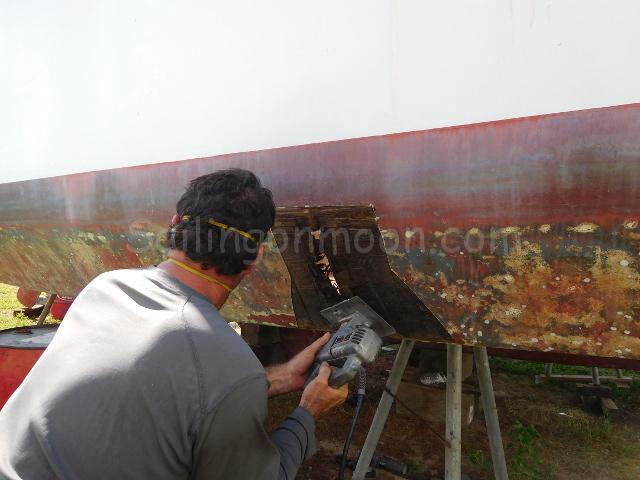 Brian is also working on removing our old cutlass bearing and installing a new one. I can tell that it’s not going as easy as it could be because there has been a bit of cursing involved. I’ve been tearing everything apart and cleaning areas that have not seen the light of day for sometime. 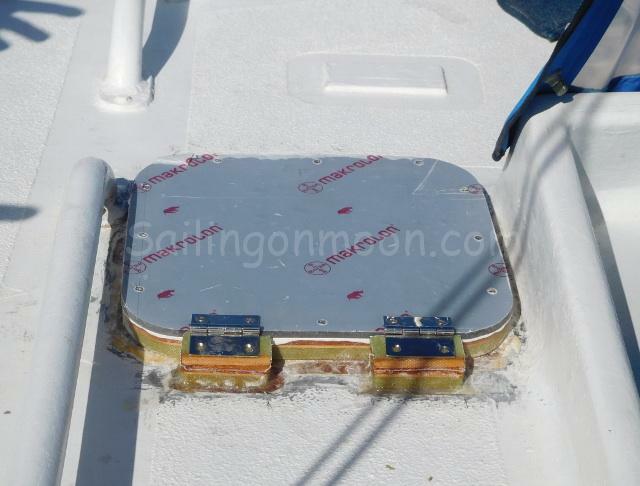 Moon is on the lift and on the move in the boatyard. I always love seeing this warning sticker as I am riding on Moon as she is being hoisted! Moons new spot up high. Nothing unsafe about these stairs! We still find ourselves at the beach for a swim most afternoons and I am as always with my eyes down, looking to see what treasures I can find. Recently I found my second body part…a head! Yup, just a head. 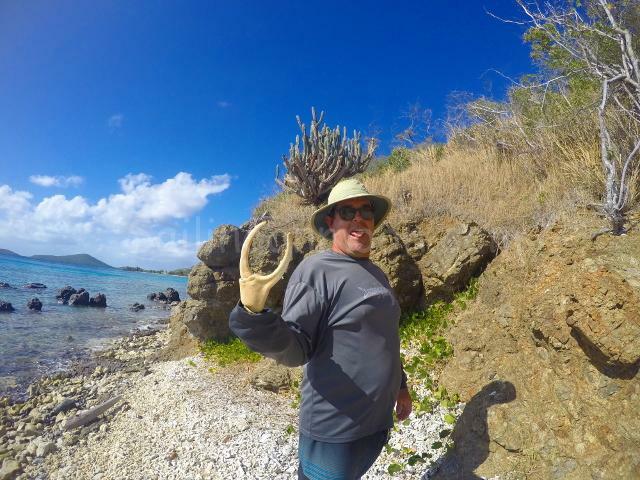 I had found a porcelain arm a few years ago in a parking lot here in Saint Kitts but this was my first head. Pretty cool! 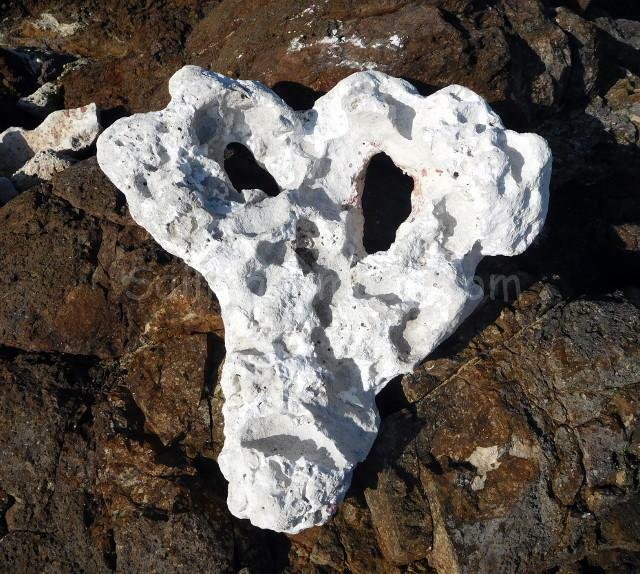 Found this head on my treasure beach. It’s about the size of a quarter. It’s always so strange to be away for the holidays. Here it is just another day and nothing seems different. No family or friends to share time with. It’s kinda sad. 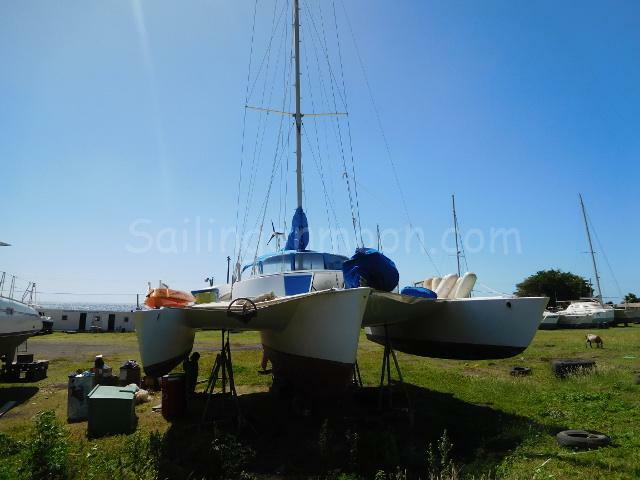 I know that we are “living the dream” so to speak, (or at least we will be once we get out of the boatyard). It’s just not the same and the holidays don’t seem as special. They just make us miss everyone more. We hope that everyone has a great Thanksgiving and hopefully you will think of us just a little, have some of that special casserole or pie and and know how lucky you are to have friends and family close by. We will think of all of you and think of how thankful we are to have you in our lives too! Love and miss you all…especially you Rachel!!!! Look What the Sea Made! 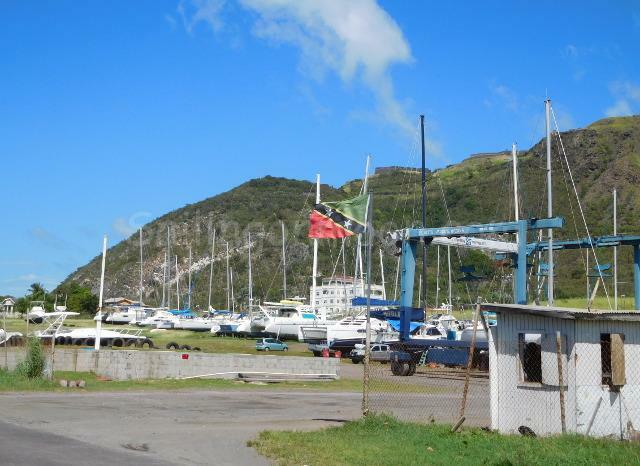 A view of the boatyard from the street with the guard shack on the right side. Moon is along the row there to the left. 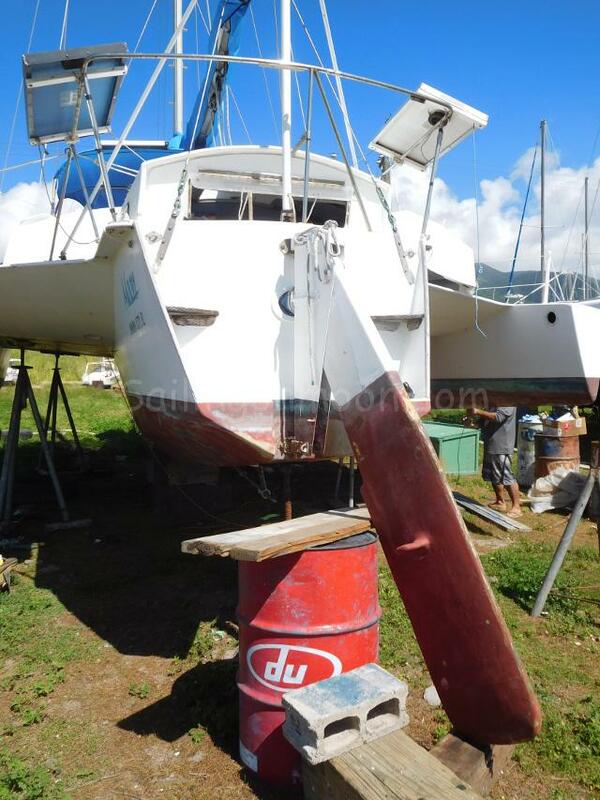 Another view of the other side of the boatyard. 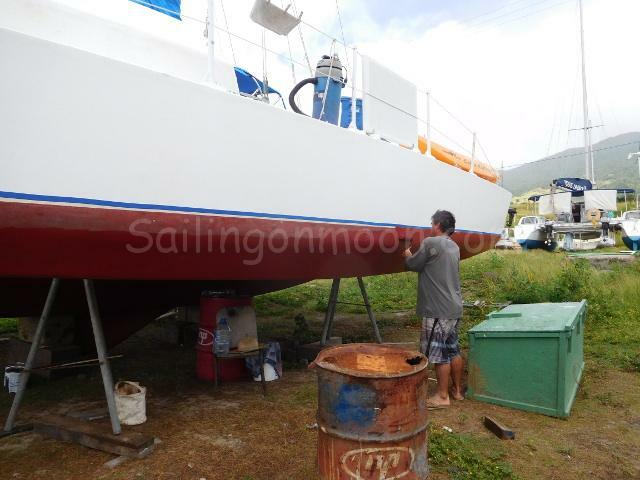 It was the first of the month and a busy day for the boatyard….we had never seen five boats in their launch area! 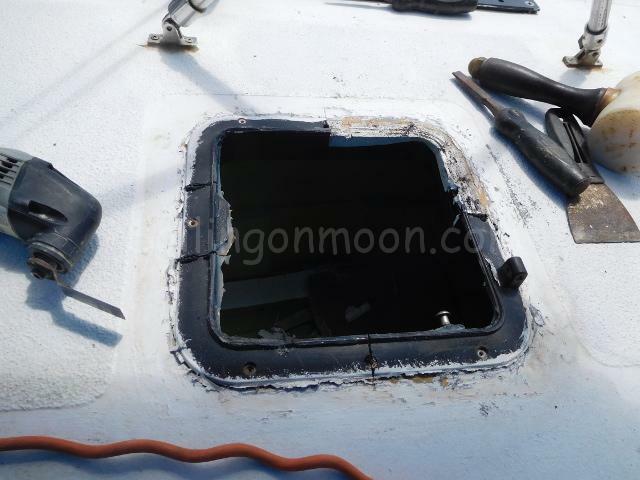 We have been busy getting Moon back together from being put away for hurricane season. 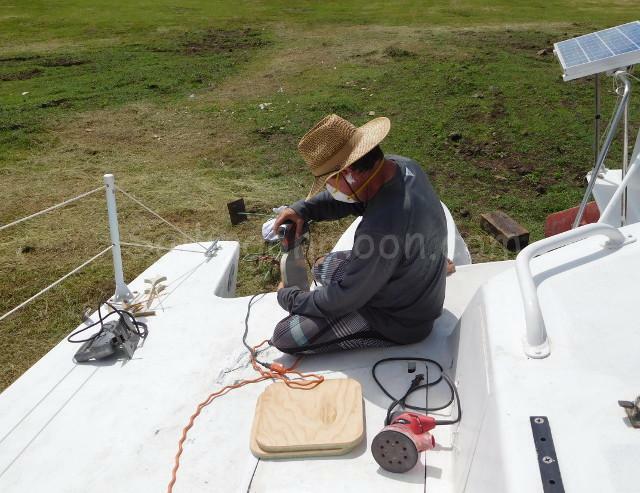 Here is just some of what we’ve done so far…We ran the halyards back up the mast, put the main sail and cover back on, put the jib back on, restitched the bimini top and put it and the dodger back on, mounted the solar panels back on the bimini, reinstalled the wind generator, put the forward nets back on, oiled our chains and anchors, cleaned in all of the nooks and crannies and I’m sure that there is lots of other stuff that we have done that I have already forgotten about! As you can imagine we have been busy! 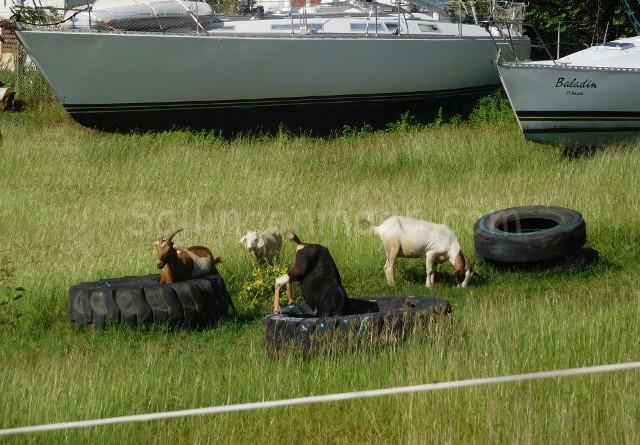 The goats love the grass growing from inside the tires! 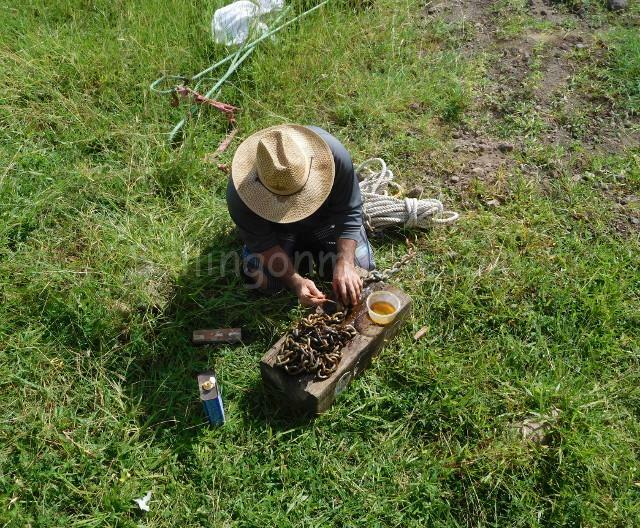 Brian putting linseed oil on the anchor chain. 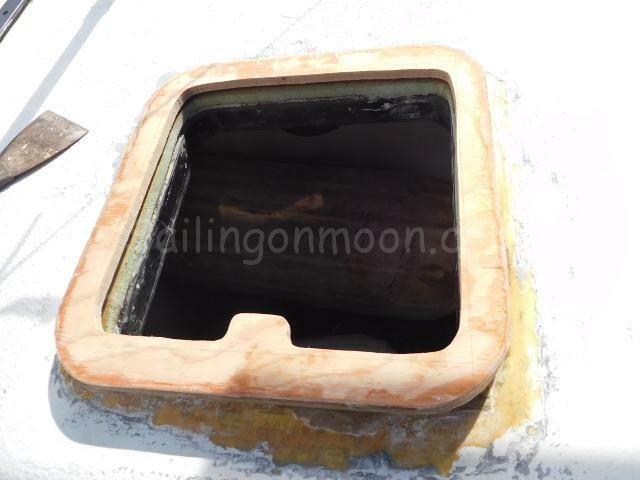 We also have a few projects that we have to take care of while we are in the boatyard and Moon is getting some much needed TLC. 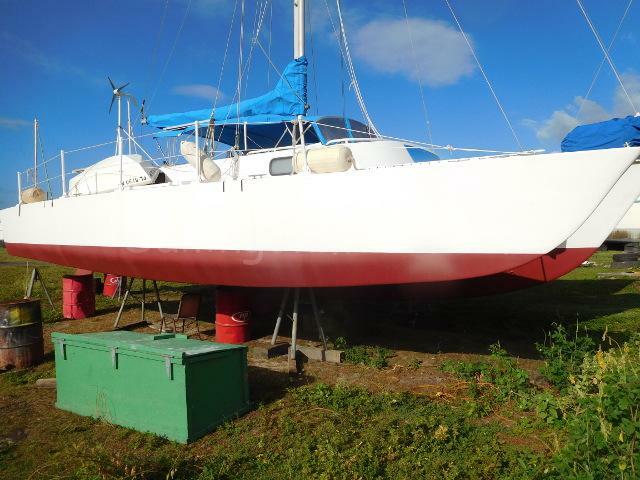 We plan on painting her bottom while we are hauled out but we have to wait for 10 business (or island time) days for the bottom paint to arrive so this is the perfect time to get some needed projects done. Three of the hatches starting to be built. 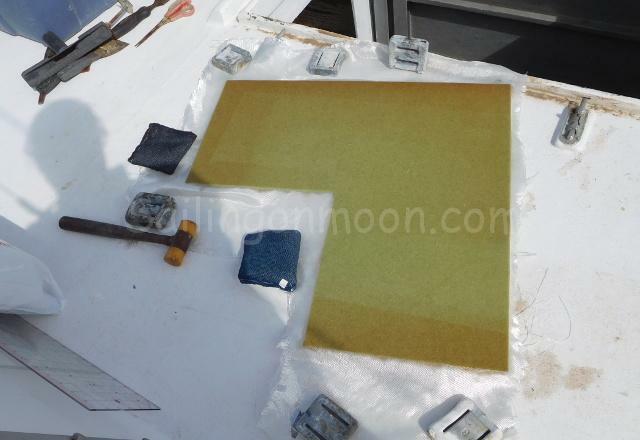 Epoxy bonded foam to plywood. Then they are cut to size. Look Ron, Brian still used the hand drill that you gave him years ago! He’s used it on lots of our projects. 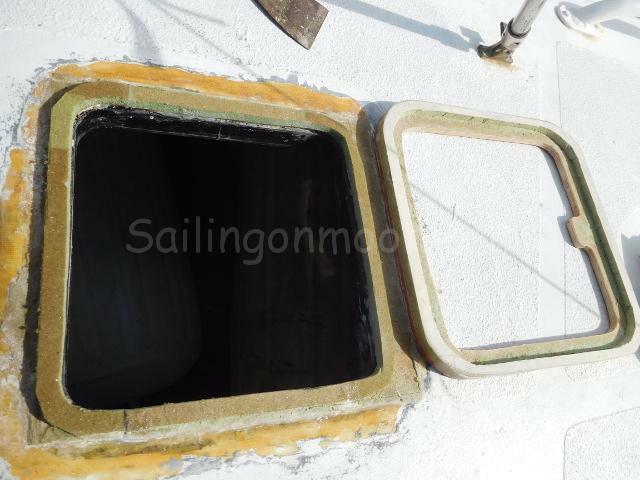 We knew that we needed new hatches since last season when I stepped through one of them and broke it. Most of them on board are pretty old anyways and needed to be replaced too. 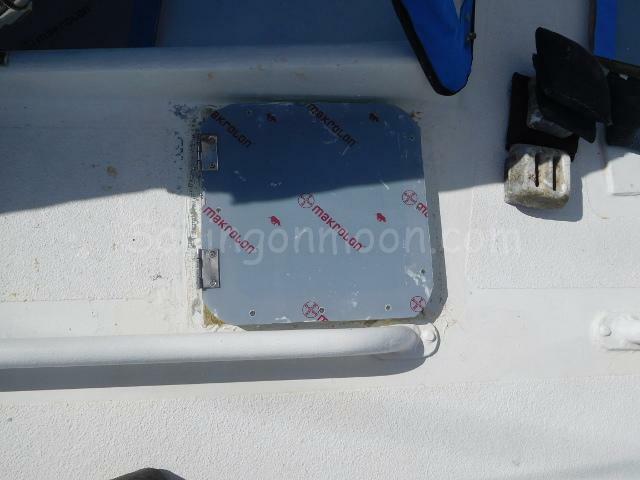 When we ordered our bottom paint we looked in the marine catalog and hatches are very expensive! The least expensive ones were just over four hundred dollars apiece and some were over thirteen hundred dollars each! Brian decided this was something that he could build on his own so, he is making us four new hatches, from scratch! The plans are all in his head and he has been working hard to get them completed while we are here. So far so good. Brian never ceases to amaze me with the knowledge and skills that he has in that head of his! I’ve been working on some inside projects. 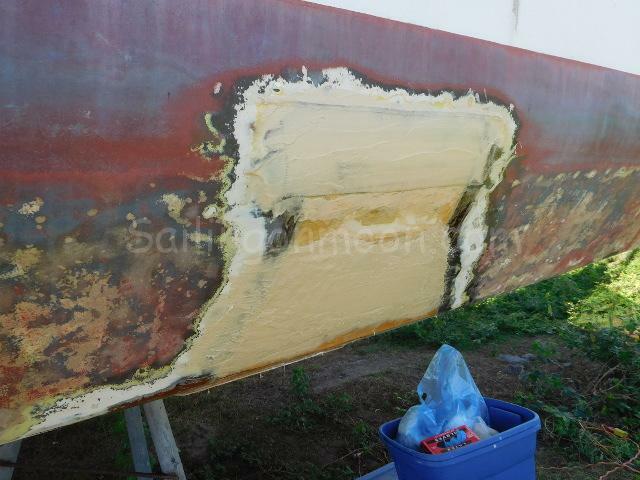 The paint on our galley cabinets was looking a little ragged and worn so I’ve begun scraping all of the old paint off and hopefully will be repainting them soon. 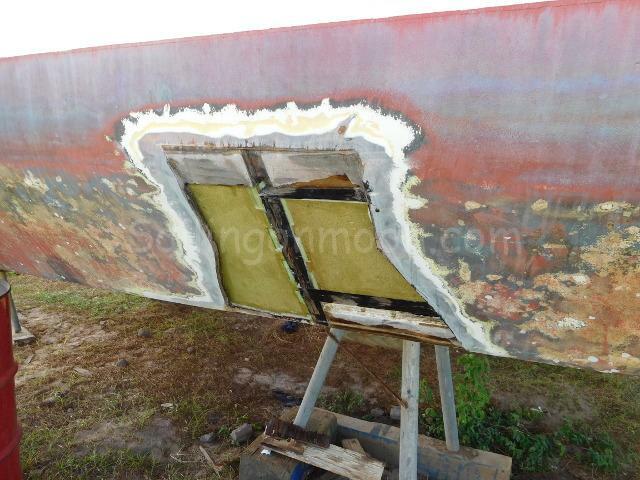 I’ve learned from this project that being a painter is not a profession that I am interested in at all! At the end of the day we are close to a nice little beach and we go and swim to get all of the days grime off of us. 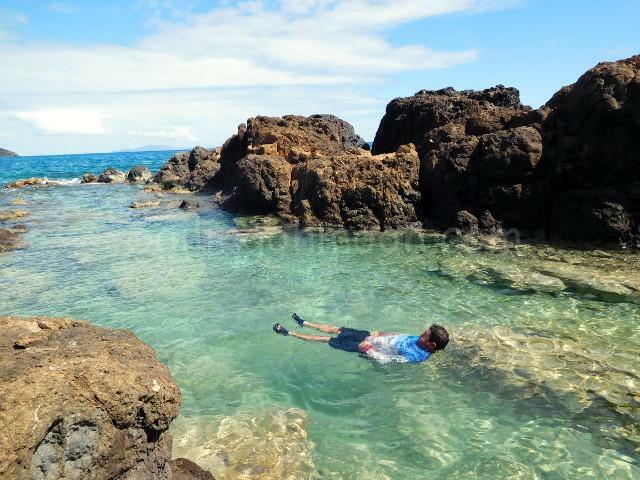 It is so nice to be able to relax for a bit and just float. I always look forward to the beach at the end of the day because this is also my “treasure” beach where I find all of my cool stuff. If you know me then you know by now that I love to beach comb! One day I was at the beach and there were some locals swimming. One little boy came up beside me and I commented that I had seen him swimming and that I was impressed with how good of a swimmer he was. 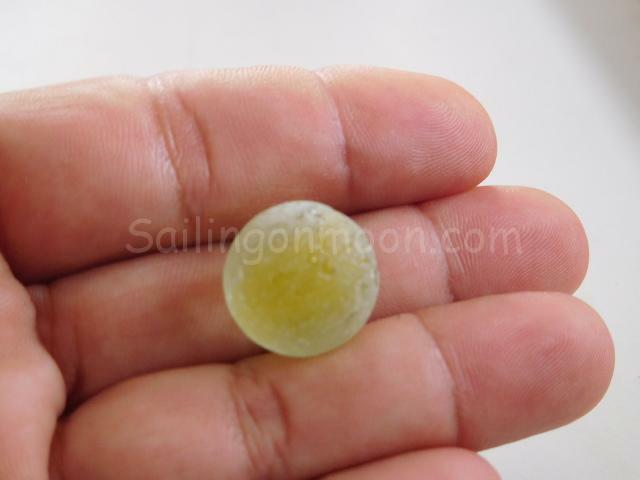 He smiled and reached down into the sand beside me and held out in his hand a beautiful yellow sea marble…”Look what the sea made”. I just loved this! He offered the marble to me. I asked him why did he not want to keep it because it was beautiful and he said that he already had many. What a nice gesture from this young man and I will never forget now when looking for my treasures that it is “what the sea made” somehow that makes it even more special! OK…I better get off of the computer and get back to work, enough time down below with the fans blowing on me for now…take care all!